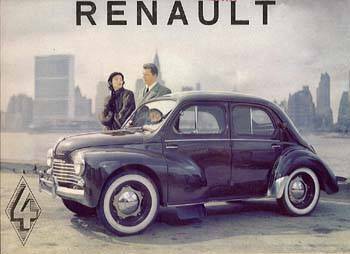 After the French capitulation in 1940, Louis Renault refused to produce tanks for Nazi Germany, which took control of his factories. 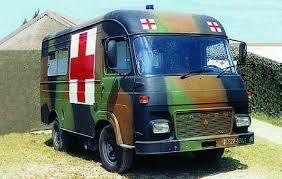 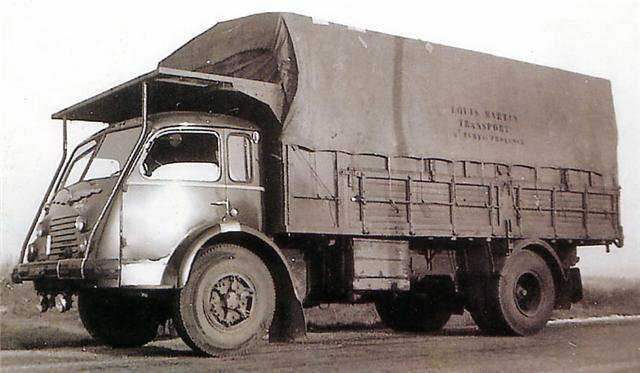 He produced lorries for the German occupiers instead. 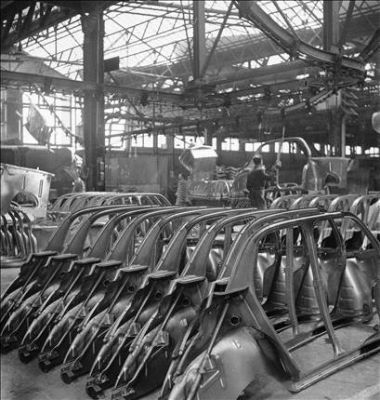 On 3 March 1942, the RAF launched 235 low-level bombers at the Billancourt plant, the largest number of aircraft aimed at a single target during the war. 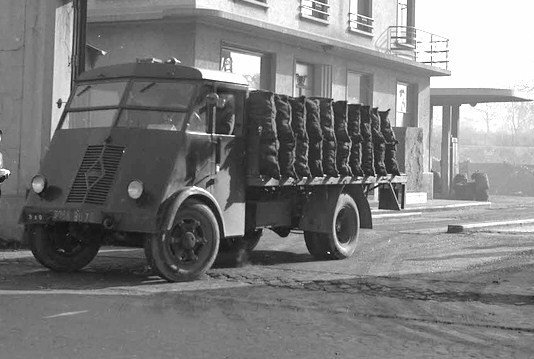 460 tons of bombs were dropped on the plant and the surrounding area, causing extensive damage to the plant along with heavy civilian casualties. 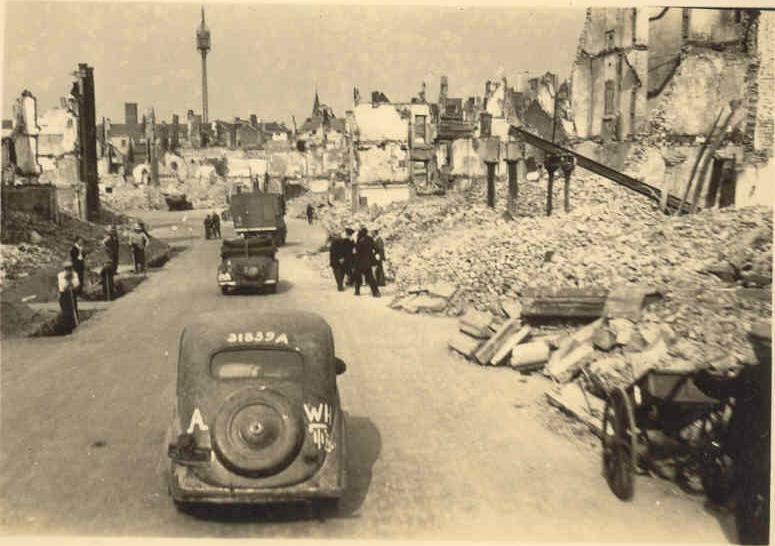 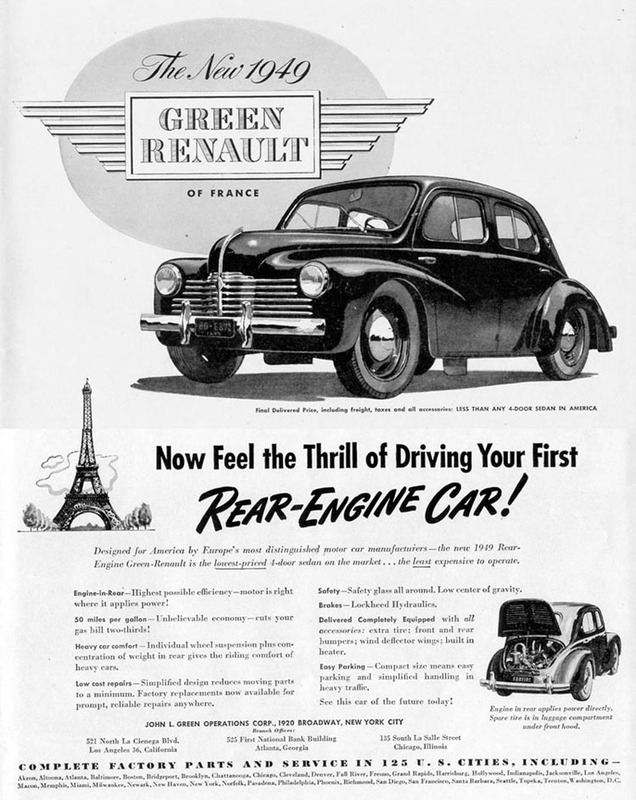 Renault resolved to rebuild the factory as quickly as possible, but a further heavy bombardment a year later, on 4 April, this time delivered by the Americans, caused further damage, as did subsequent allied bombardments on 3 and 15 September 1943. 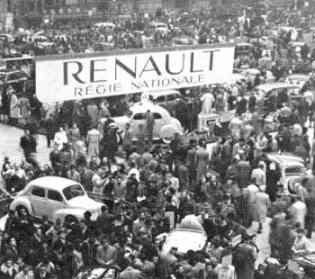 A few weeks after the Liberation of Paris, at the start of September 1944, the factory gates at Renault’s Billancourt plant reopened. 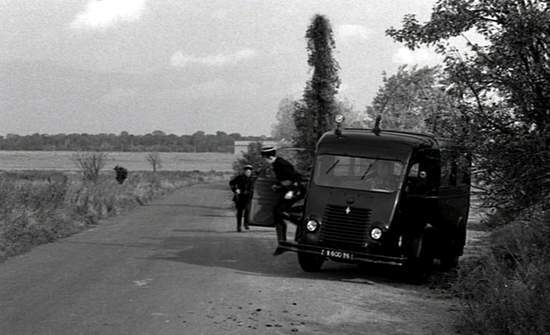 Operations restarted only very slowly, in an atmosphere poisoned by plotting and political conspiracy, undertaken in the name of popular justice. 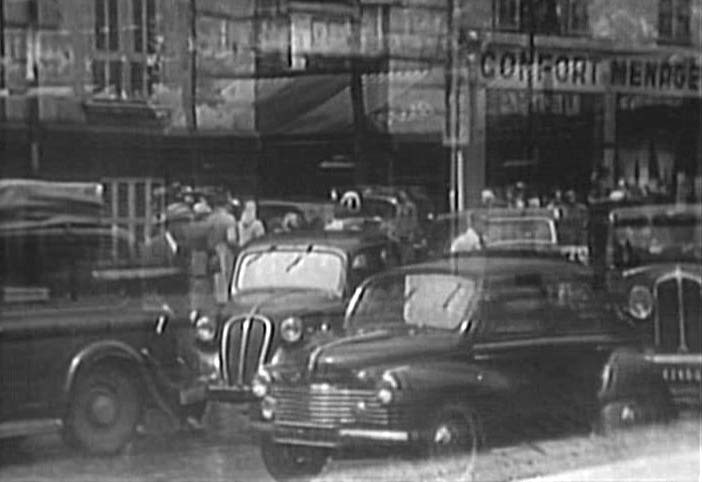 Back in 1936 the Billancourt factory had been at the heart of violent political and industrial unrest that had surfaced in France under Leon Blum’s Popular Frontgovernment: although the political jostling and violence that followed the liberation was ostensibly a backlash from the rivalries between capitalist collaboration and communist resistance, many of the scores being settled actually predated the German invasion. 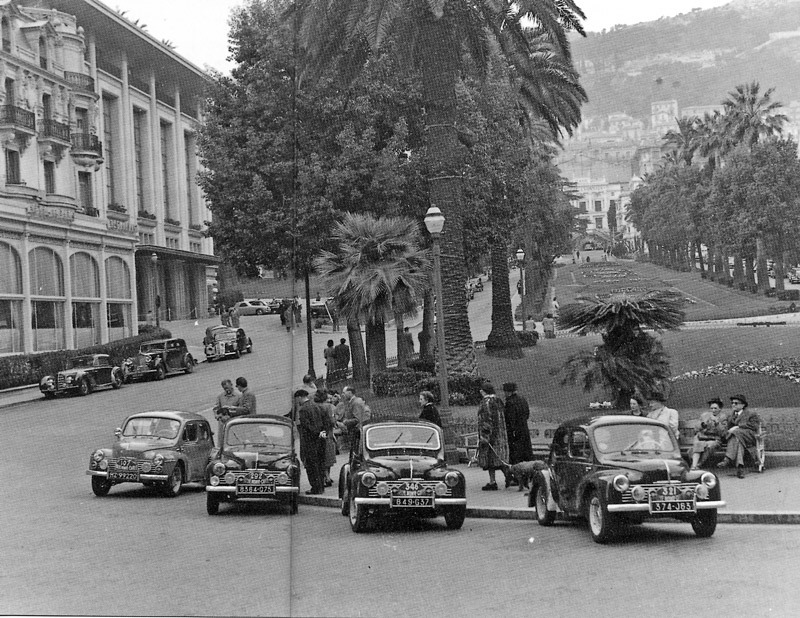 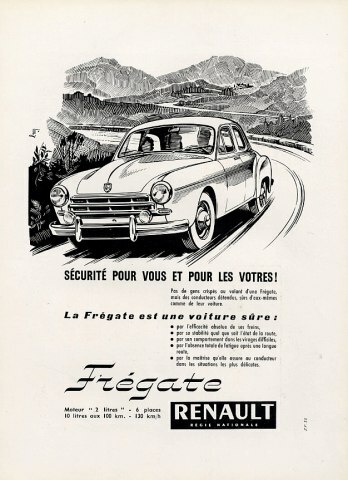 Responding to the chaotic situation at Renault, on 27 September 1944 a meeting of the Council of (the provisional government’s) Ministers took place under de Gaulle’s presidency. 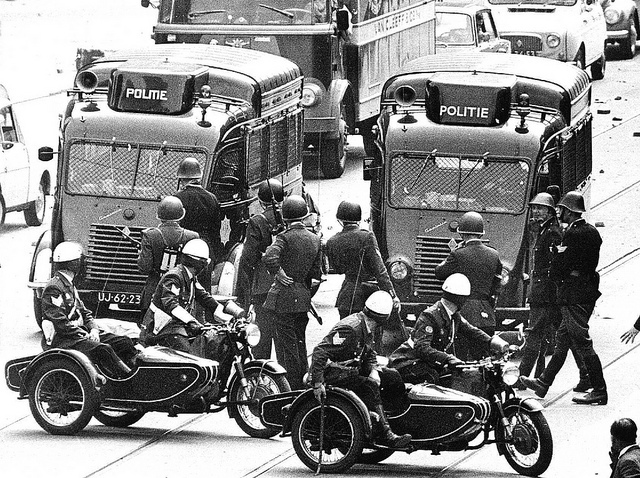 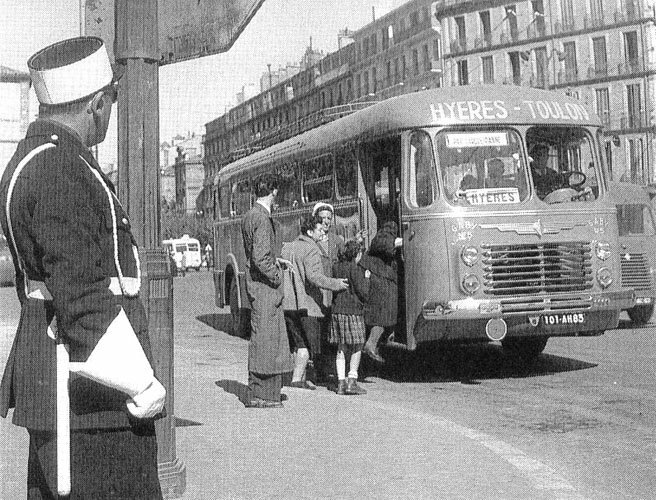 Postwar European politics had quickly become polarised between communists and anti-communists, and in France De Gaulle was keen to resist Communist Party attempts to monopolise the political dividends available to resistance heroes: politically Billancourt was a communist stronghold. 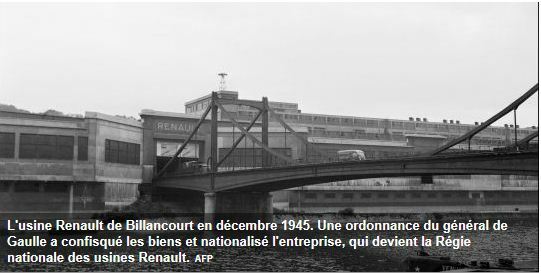 The government decided to “requisition” the Renault factories. 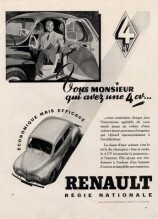 A week later, on 4 October Pierre Lefaucheux, a resistance leader with a background in engineering and top-level management, was appointed provisional administrator of the firm, assuming his responsibilities at once. 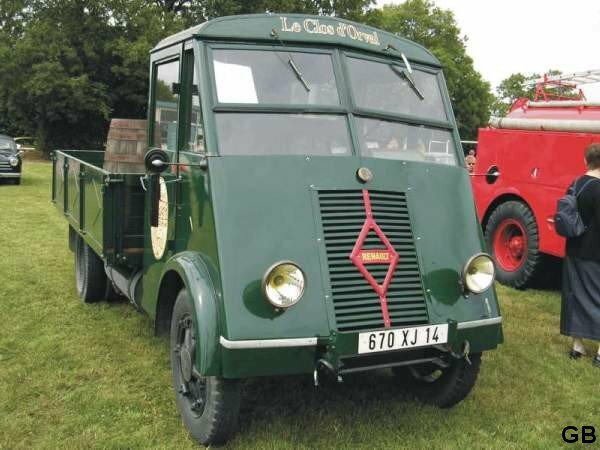 Meanwhile the provisional government accused Louis Renault of collaborating with the Germans. 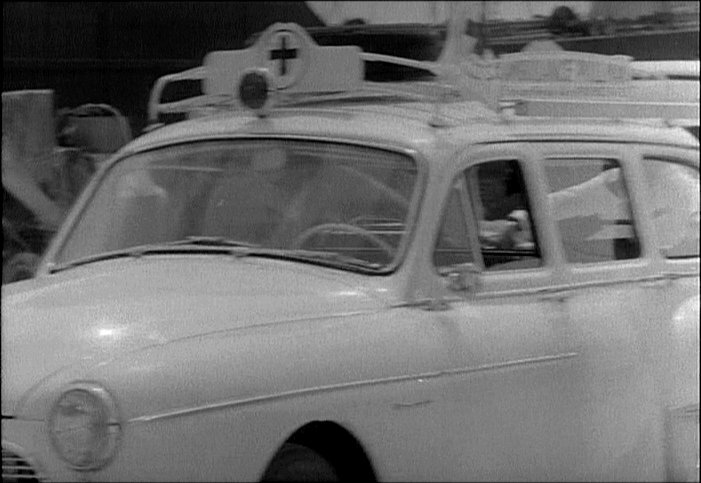 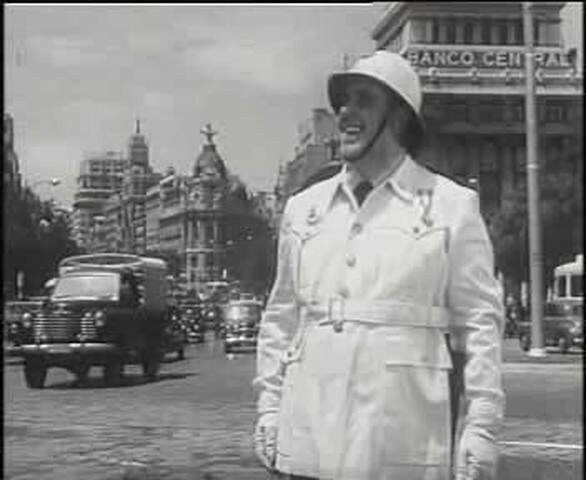 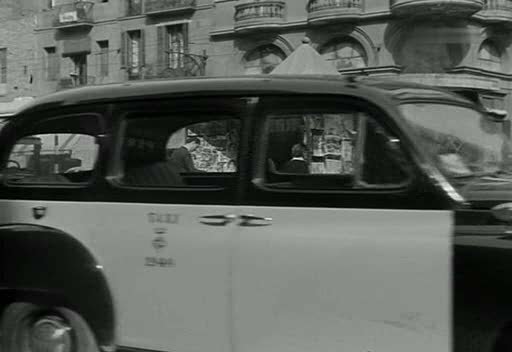 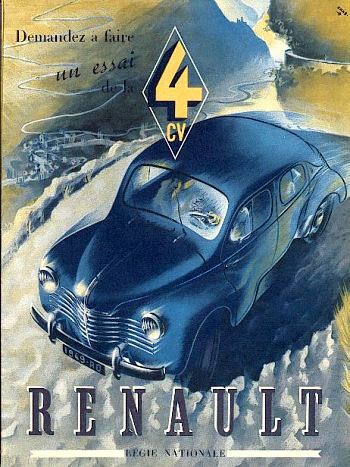 In the frenzied atmosphere of those early post-liberation days, with many wild accusations against him, but believing himself innocent of the crimes of collaboration, Renault was advised by his lawyers not to flee the country, but to present himself to a judge. 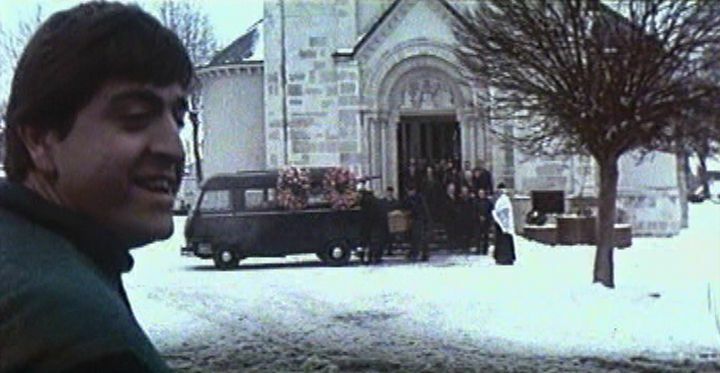 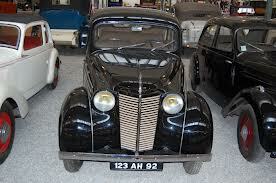 He presented himself to Judge Marcel Martin, on 22 September 1944. 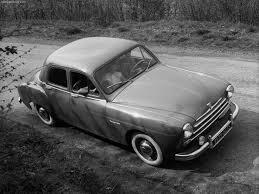 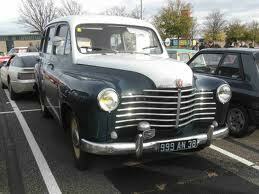 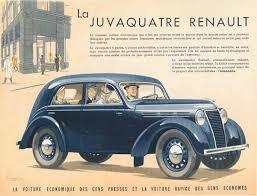 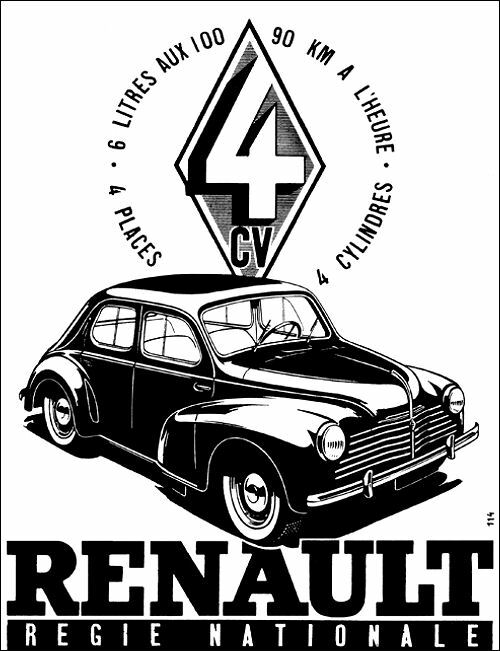 Louis Renault was arrested on 23 September 1944, like several other French auto-industry leaders at the time. 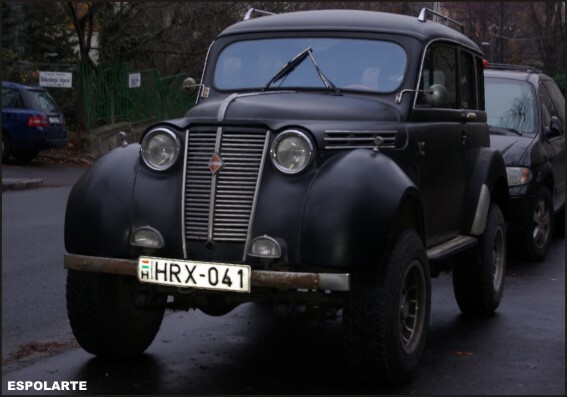 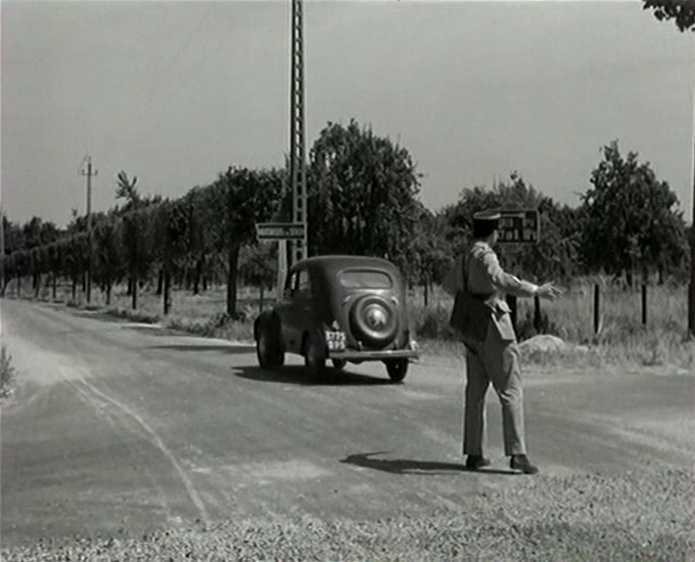 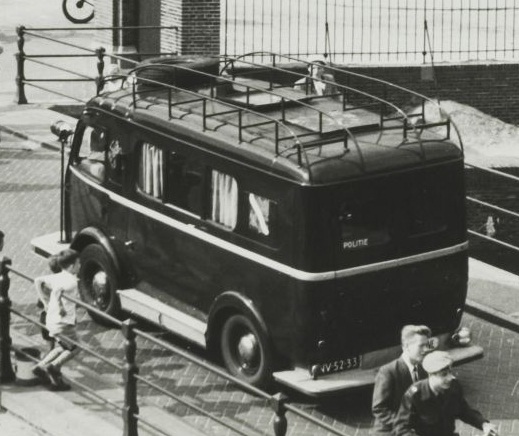 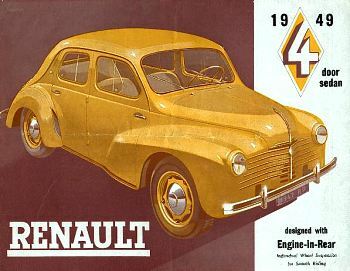 Renault’s harsh handling of the 1936–1938 strikes had left him without political allies in those early days after the liberation; thus he was completely isolated and no one came to his aid. 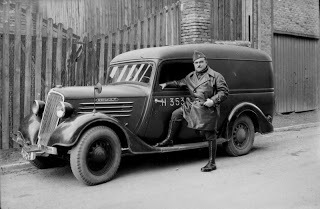 He was incarcerated at Fresnes prison where he died on 24 October 1944 under unclear circumstances, while awaiting trial. 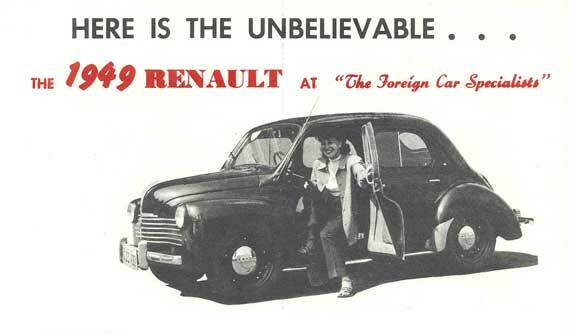 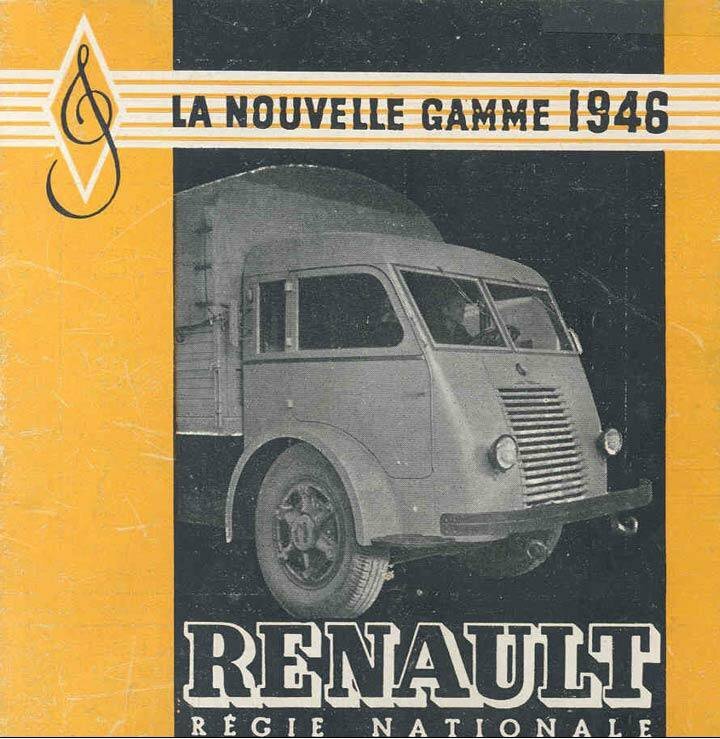 On 1 January 1945, by decree of General Charles de Gaulle based on the untried accusations of collaboration, the company was expropriated from Louis Renault posthumously and on 16 January 1945 it was formally nationalised as Régie Nationale des Usines Renault. 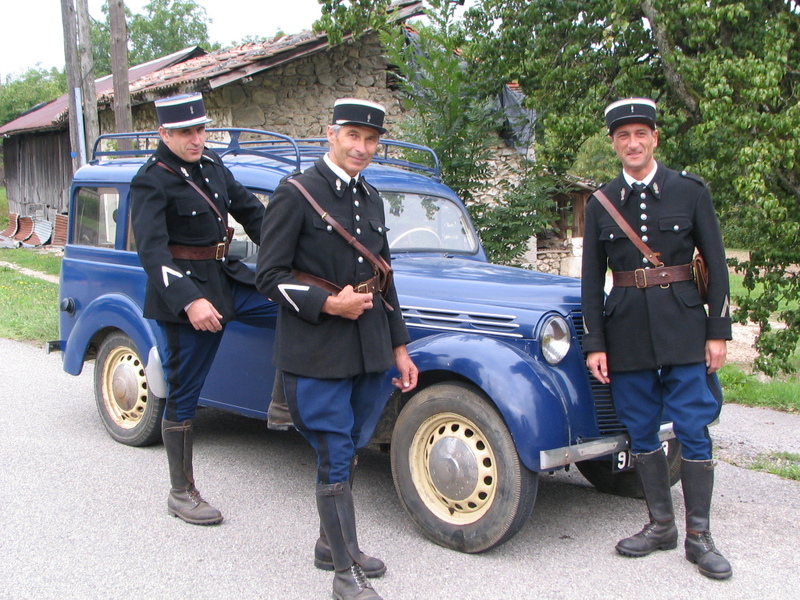 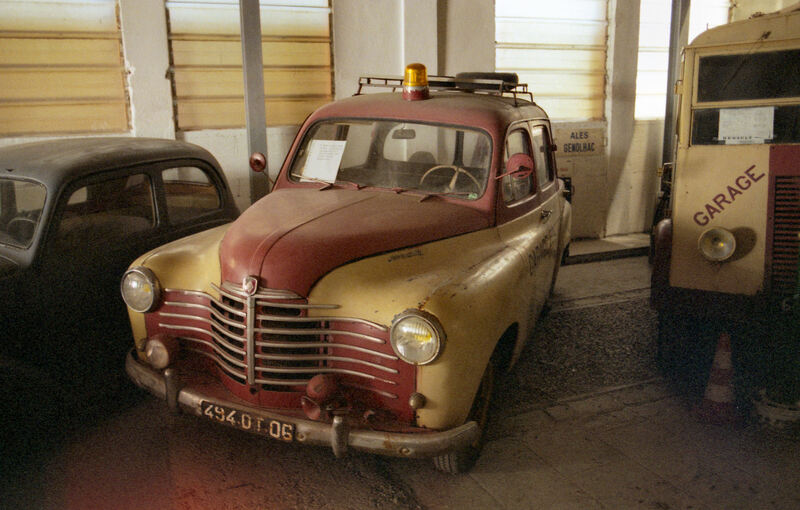 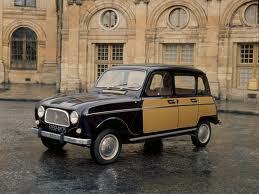 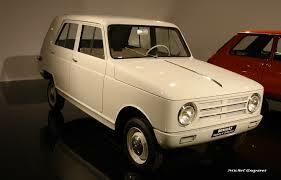 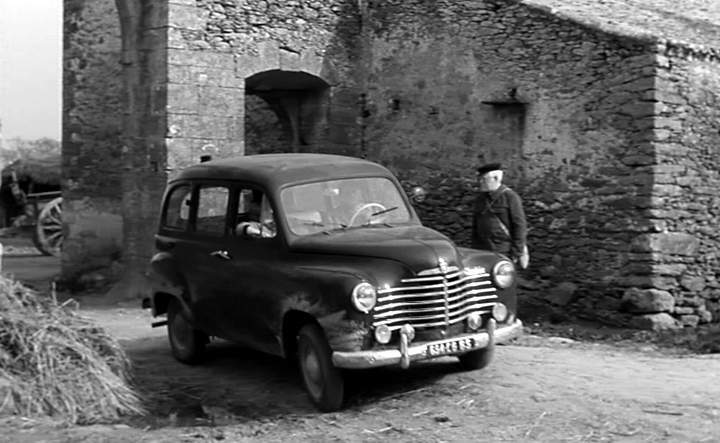 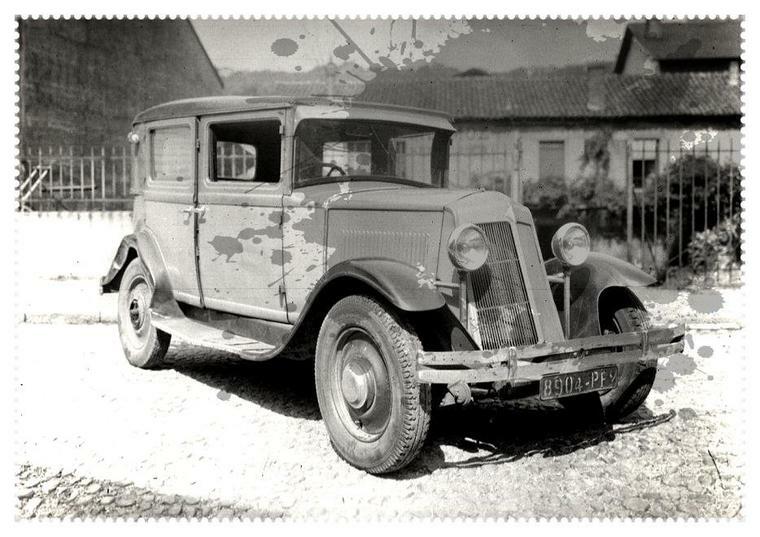 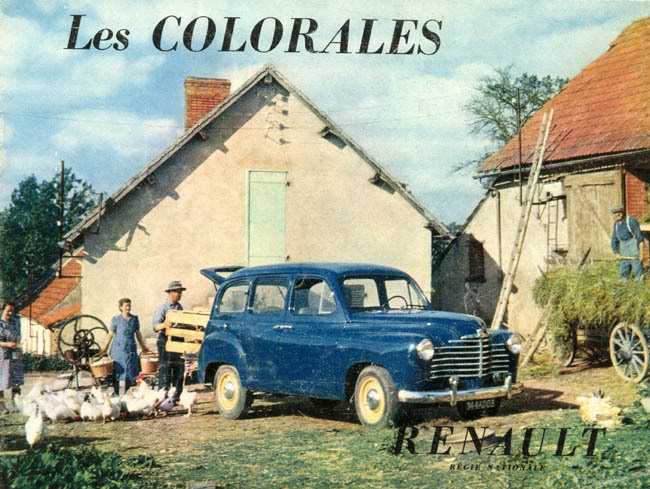 Renault’s were the only factories permanently expropriated by the French government. 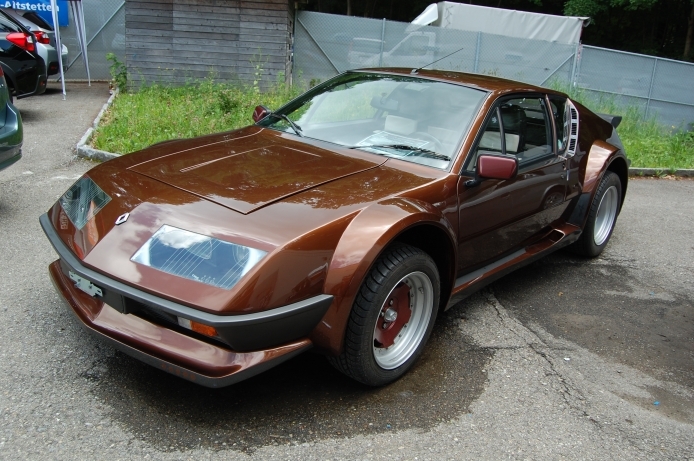 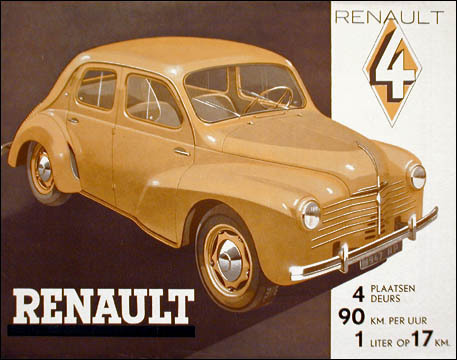 In subsequent years, the Renault family tried to have the nationalisation ruling overturned by the French courts and receive compensation. 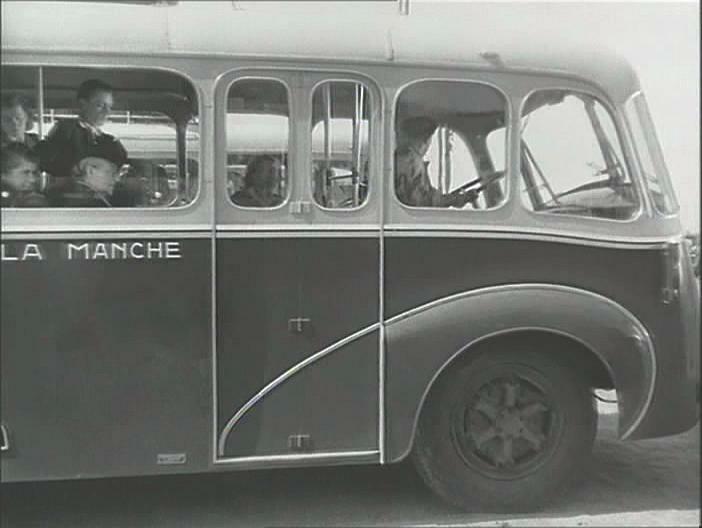 In 1945 and 1961 the Courts responded that they had no authority to review the actions of the De Gaulle Government. 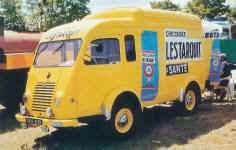 Under the leadership of Pierre Lefaucheux, Renault experienced both a commercial resurgence as well as labor unrest – that was ultimately to continue into the 1980s. 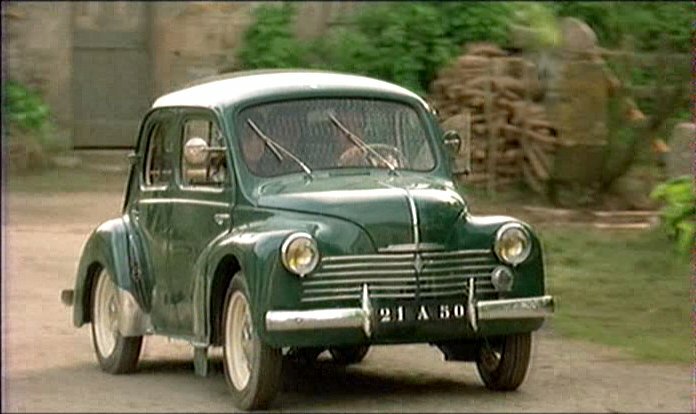 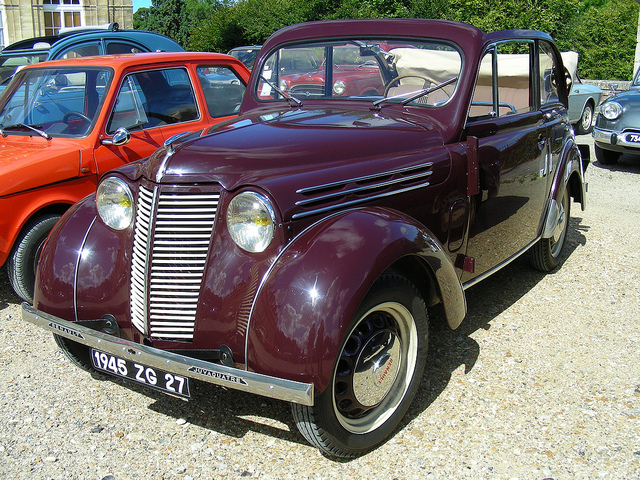 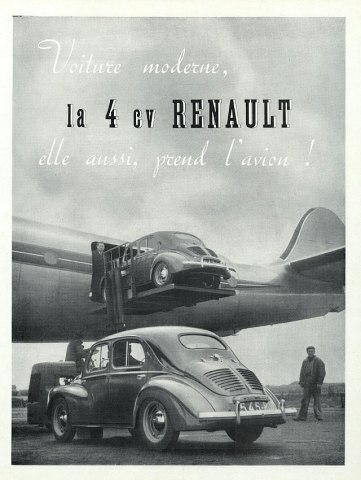 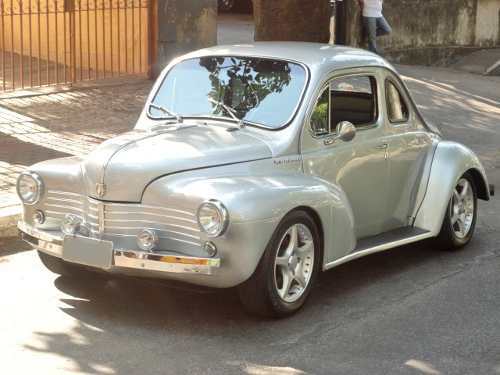 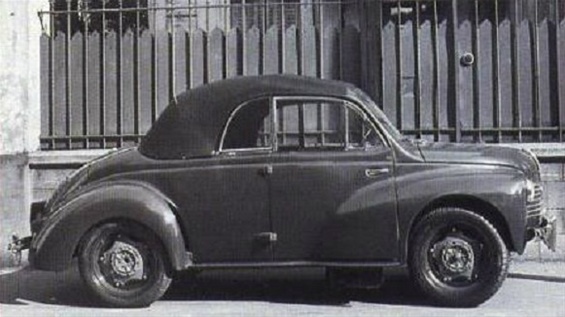 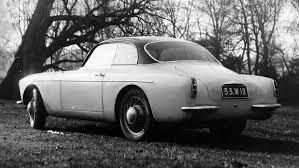 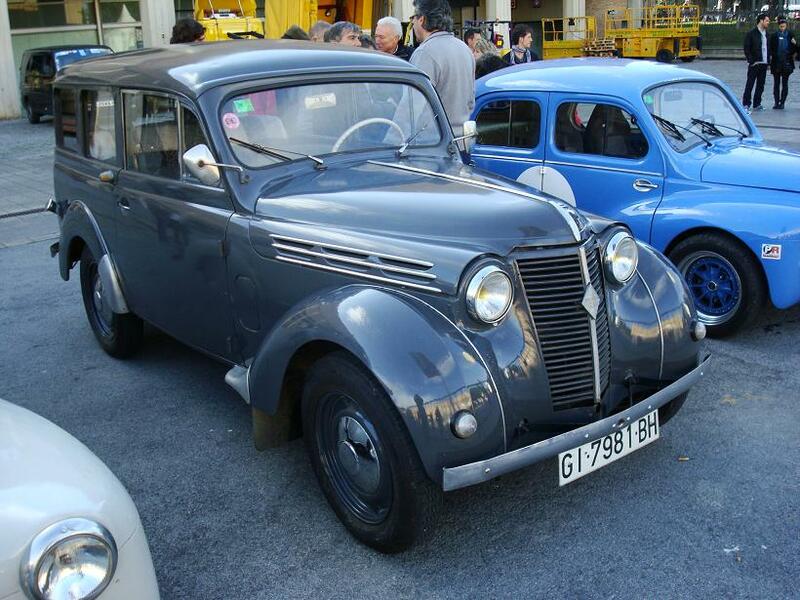 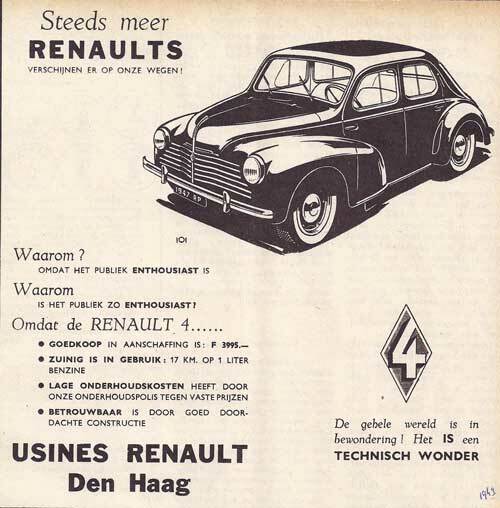 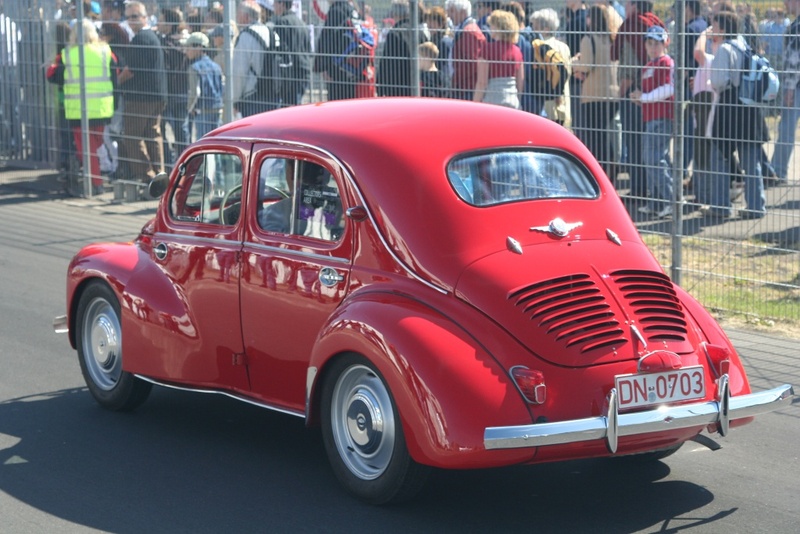 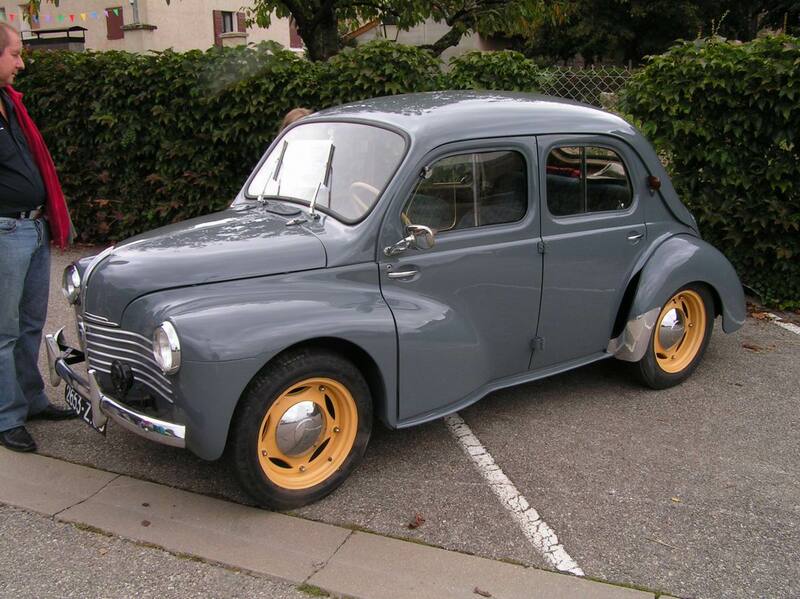 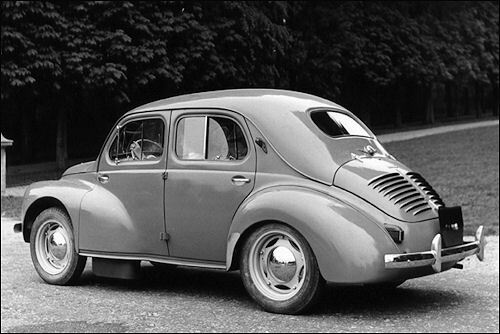 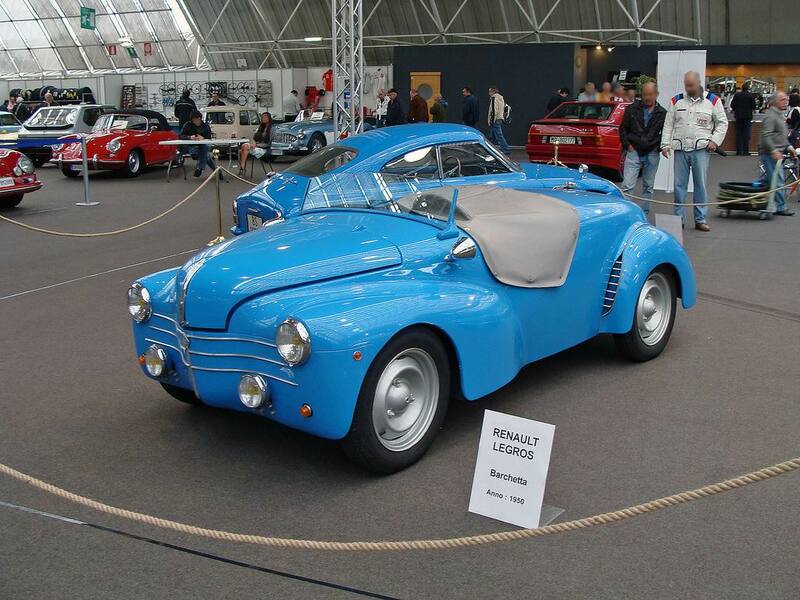 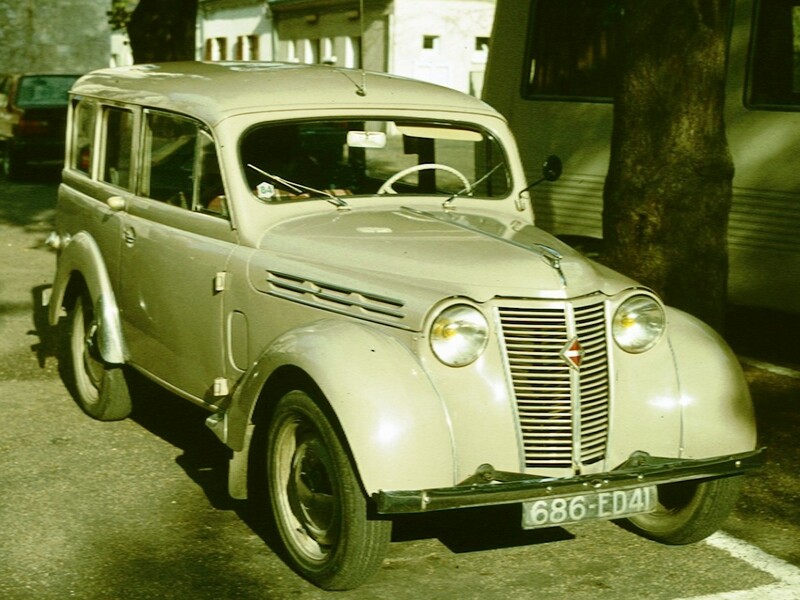 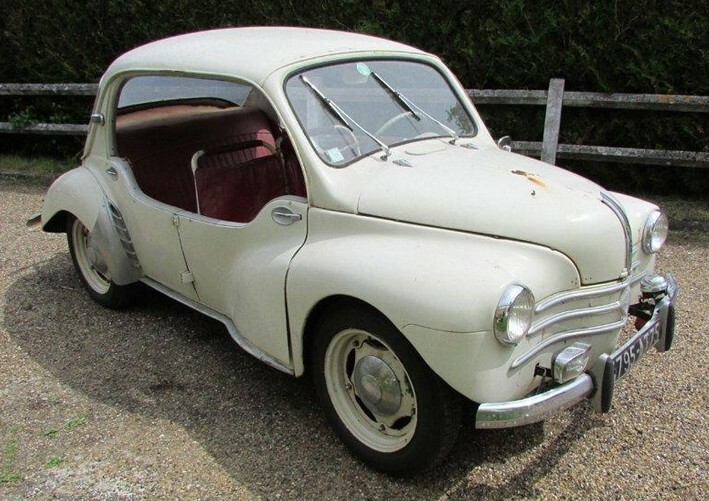 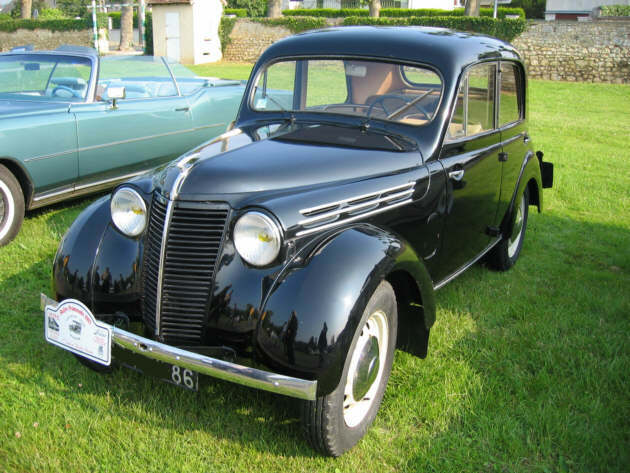 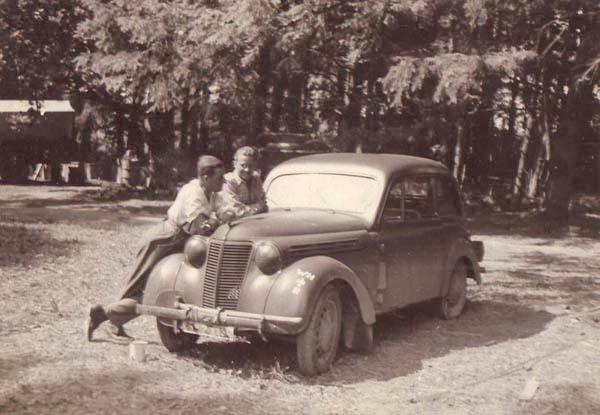 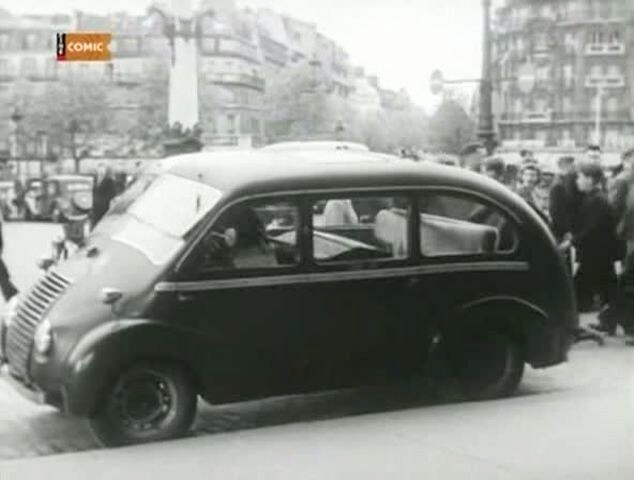 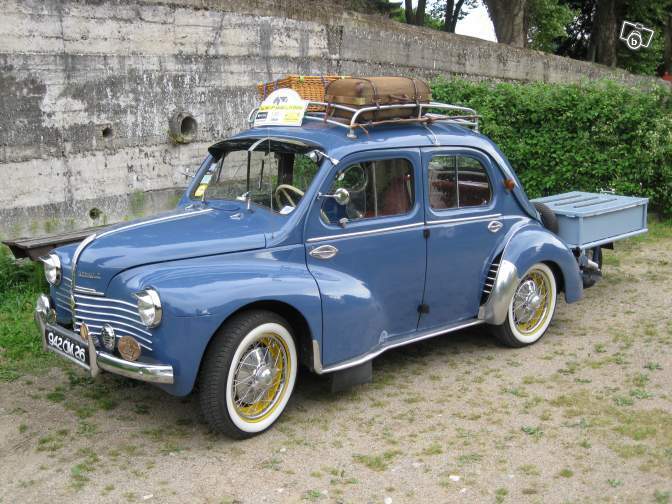 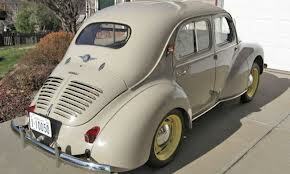 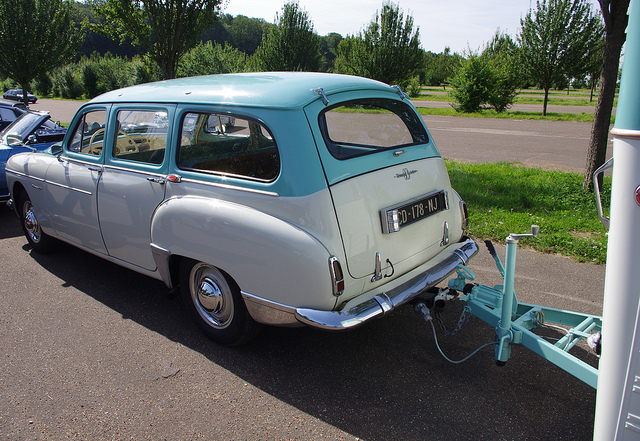 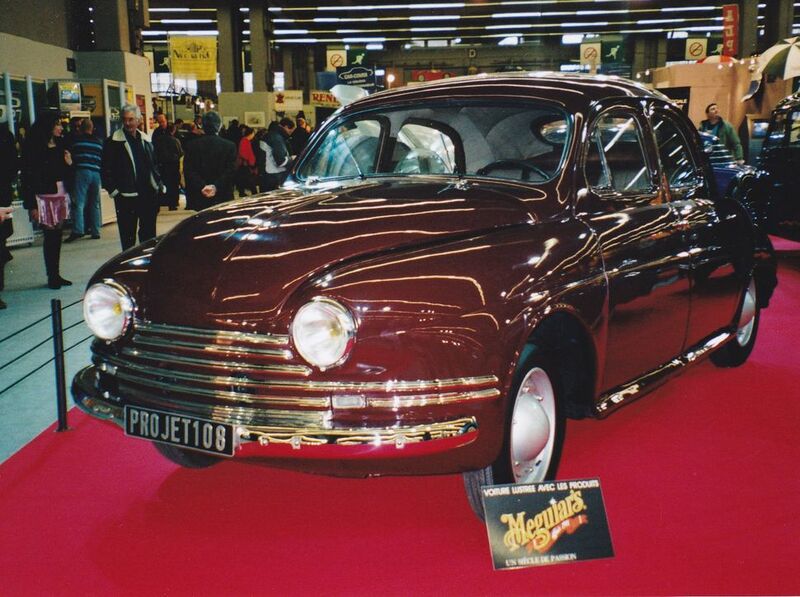 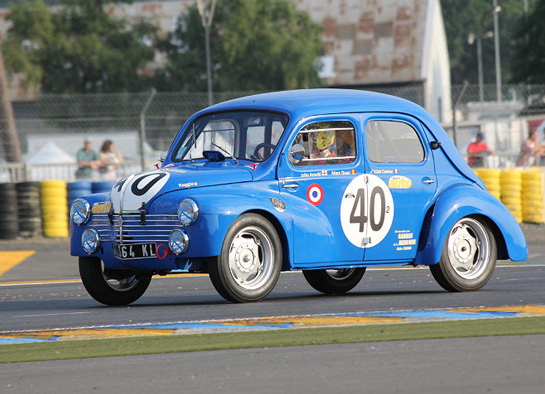 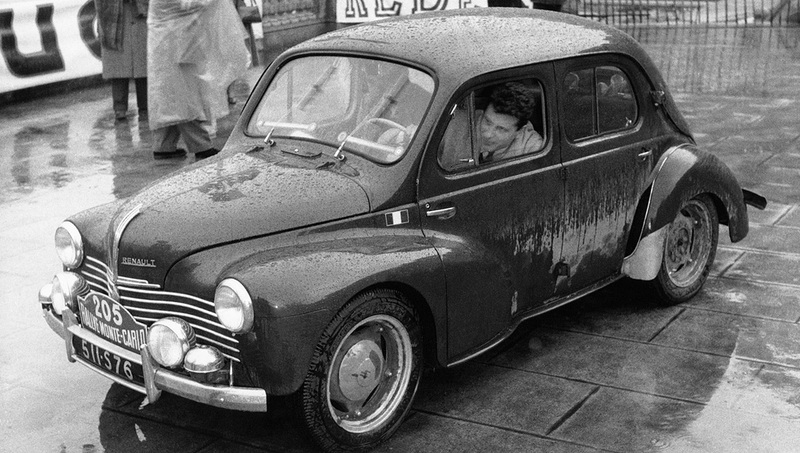 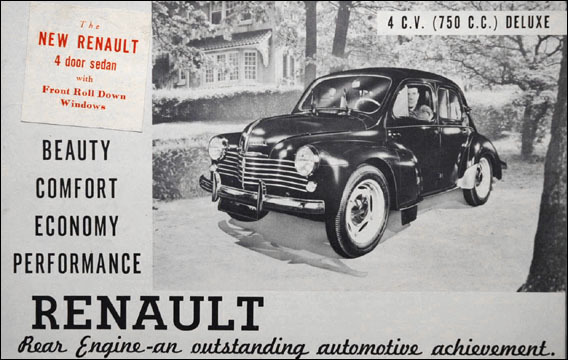 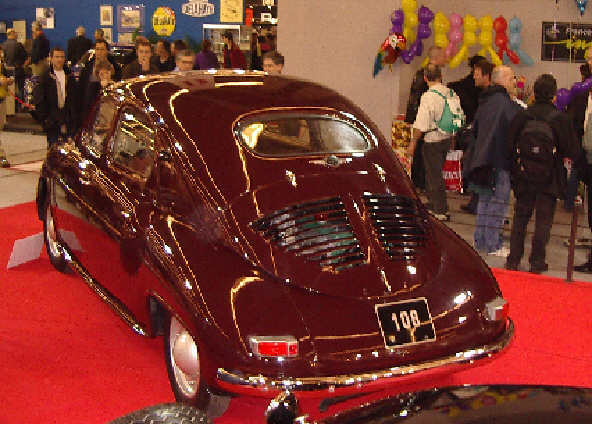 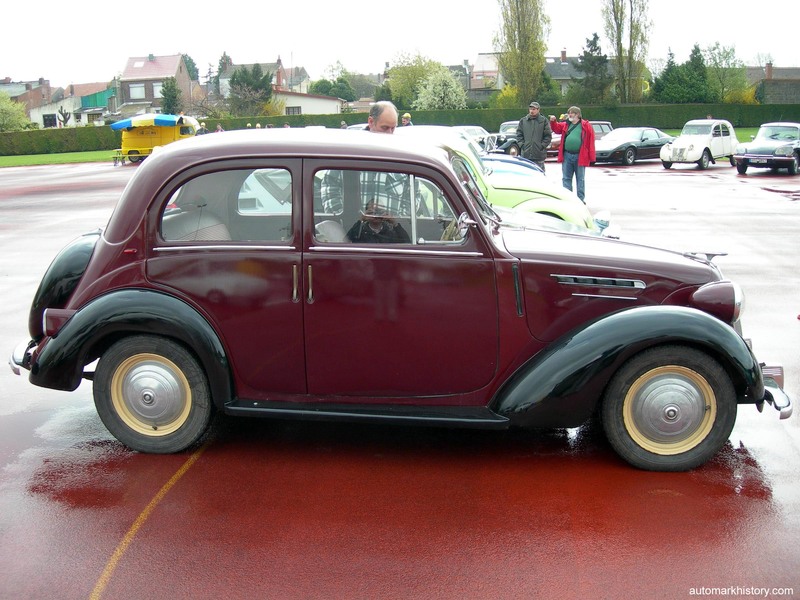 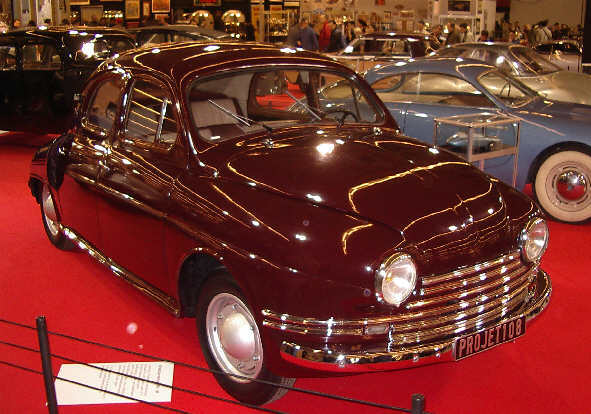 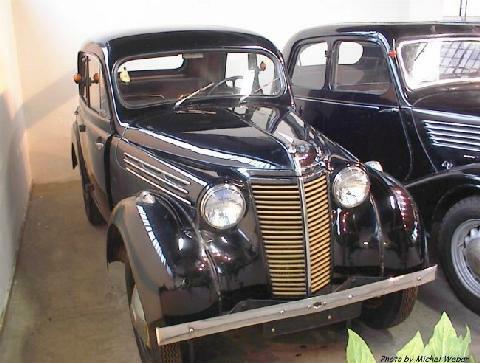 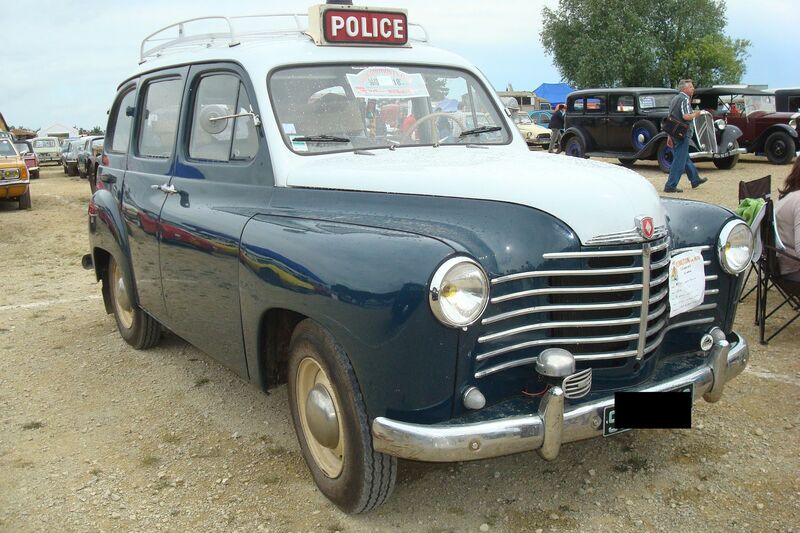 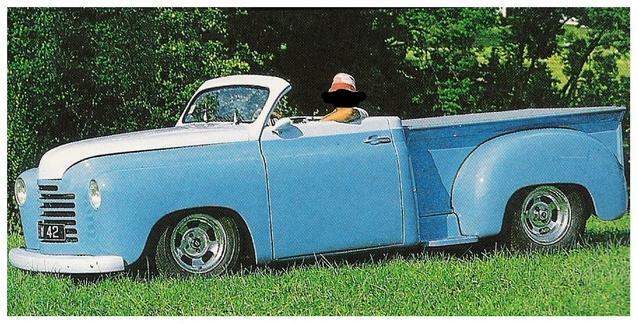 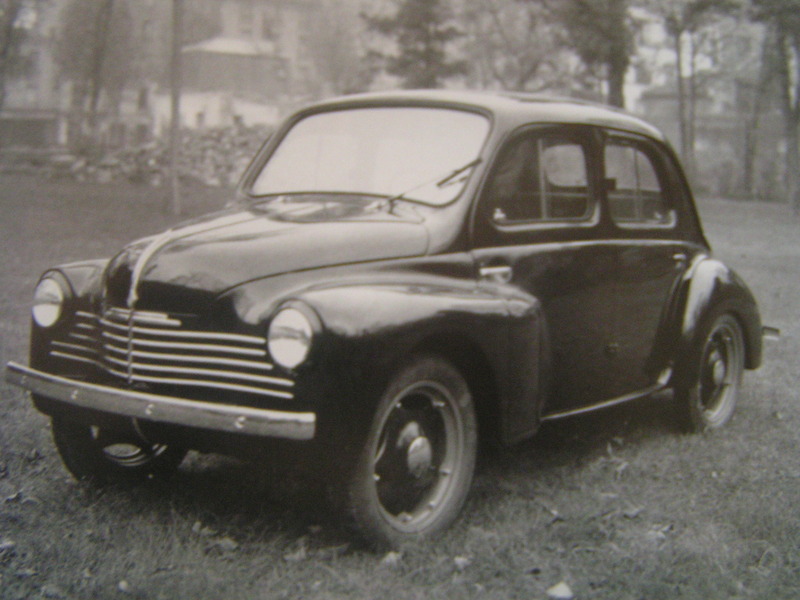 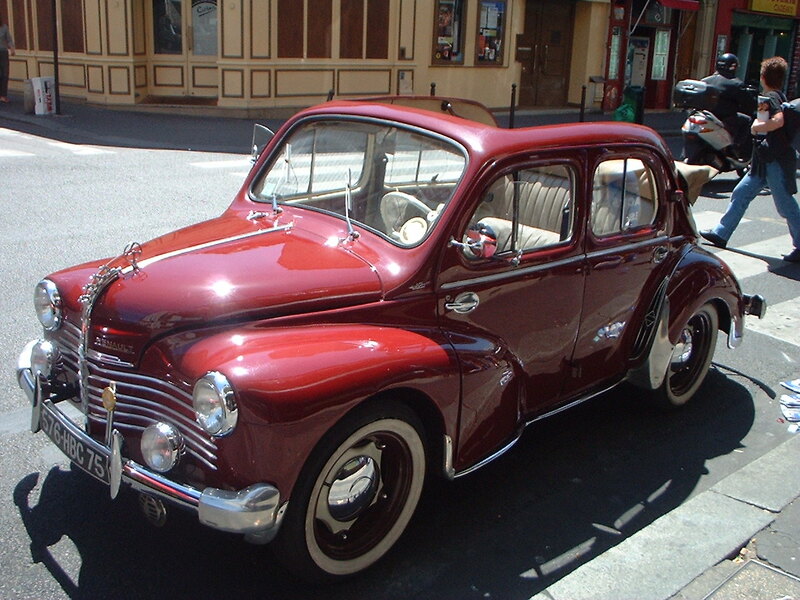 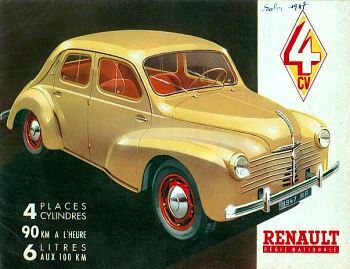 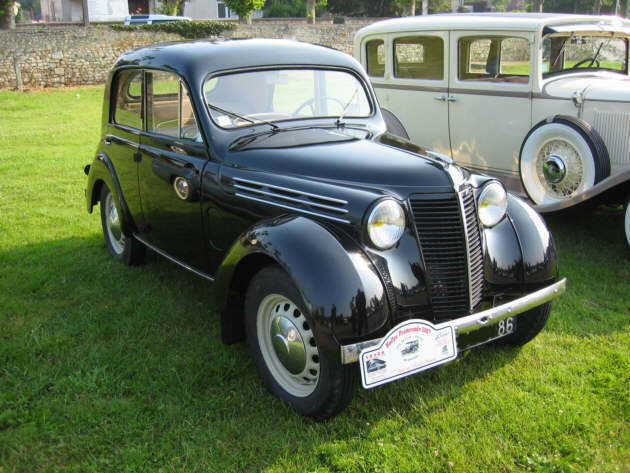 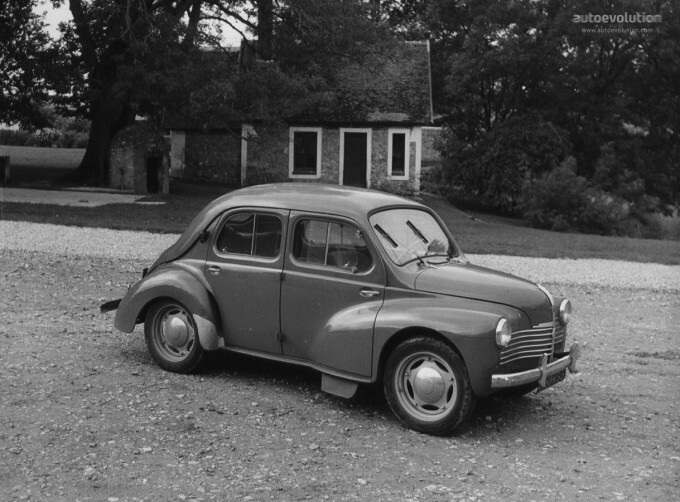 In secrecy during the war, Louis Renault had developed the rear engine 4CV which was subsequently launched under Lefacheux in 1946. 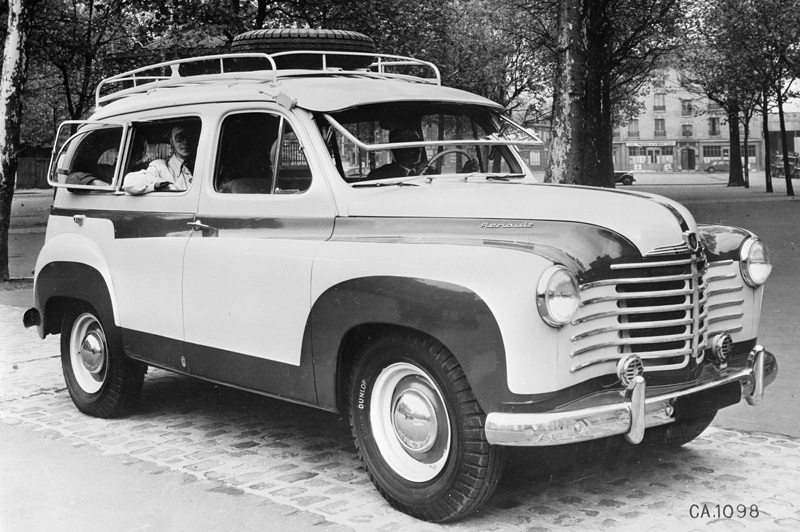 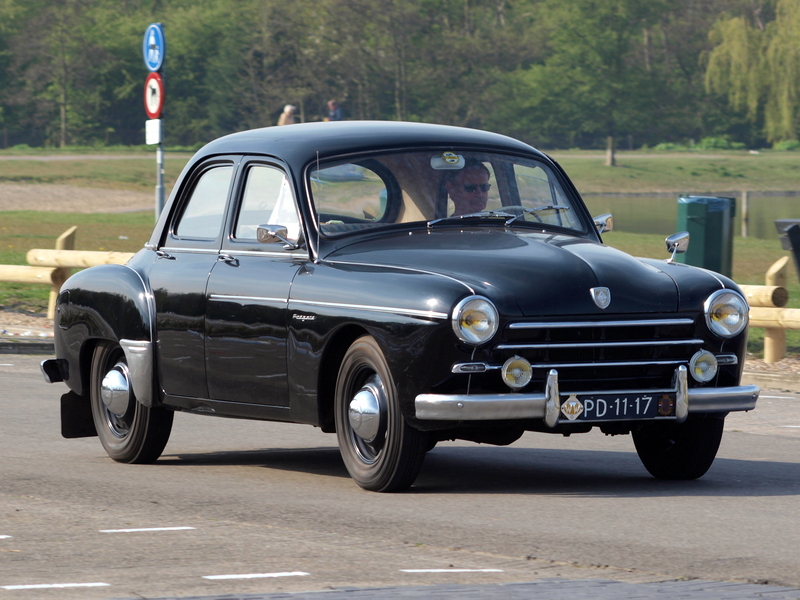 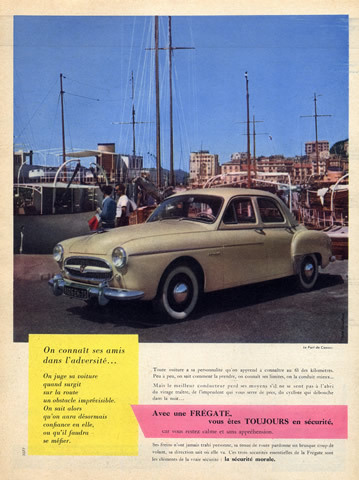 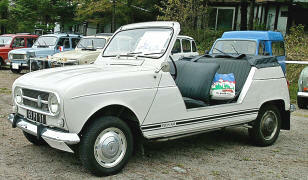 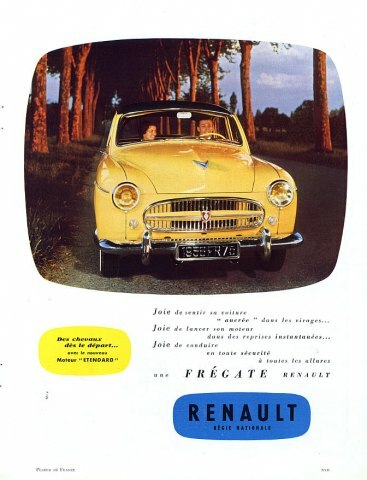 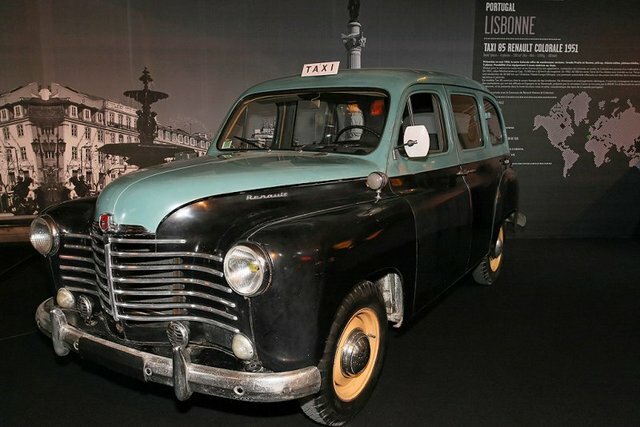 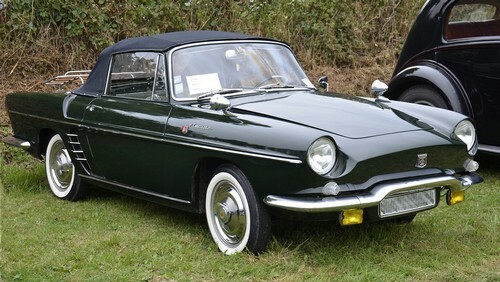 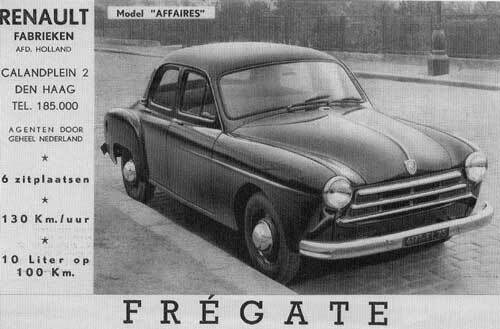 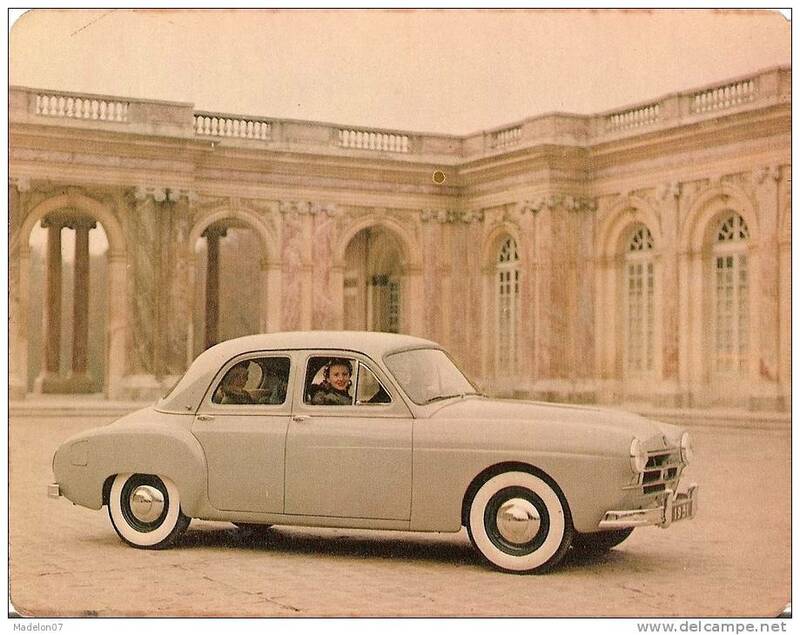 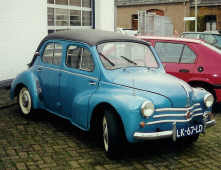 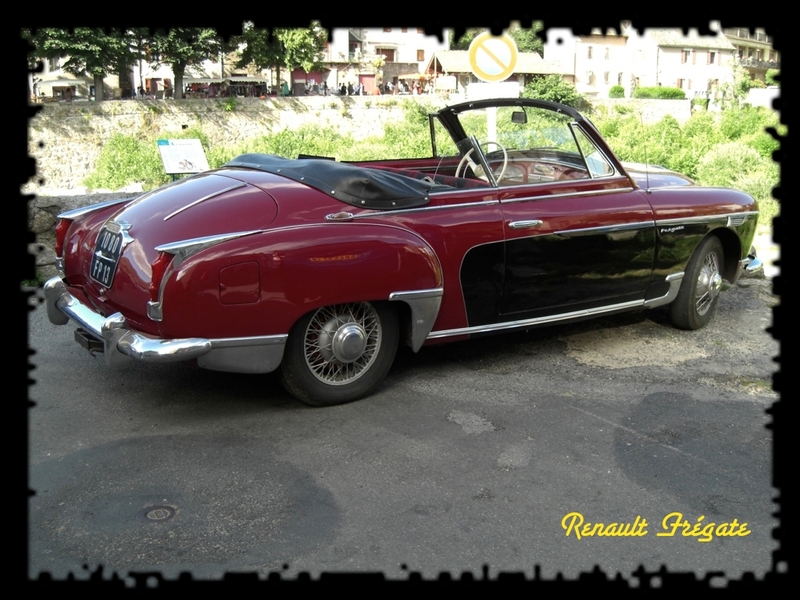 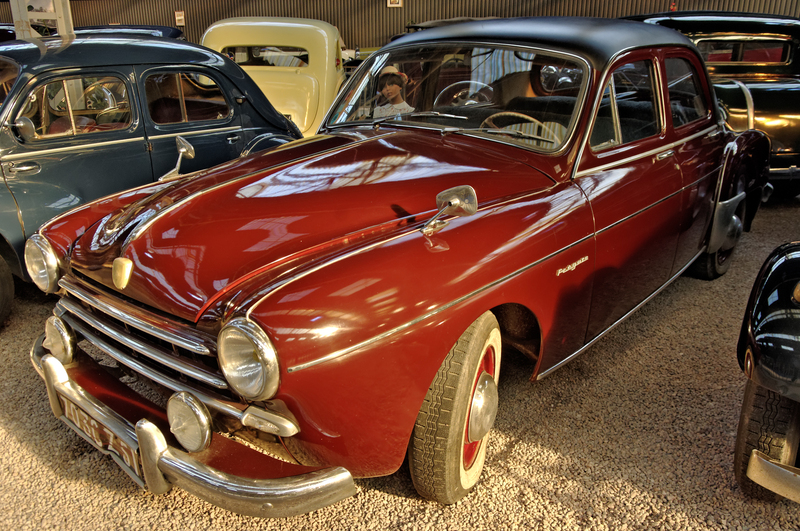 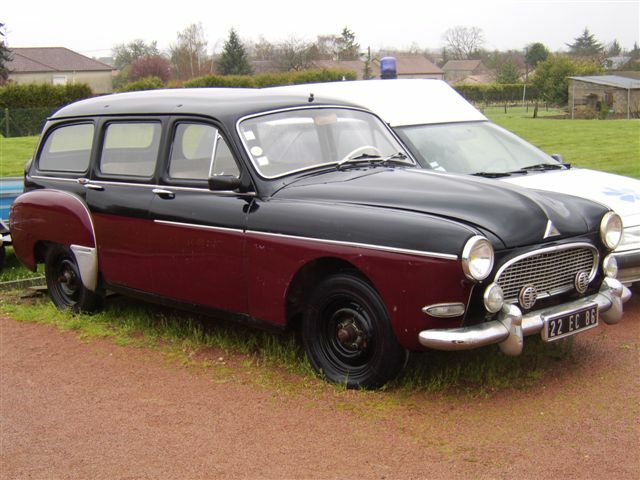 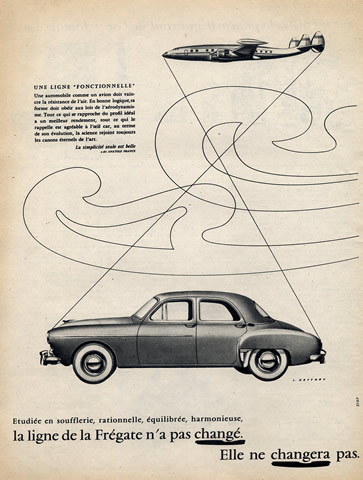 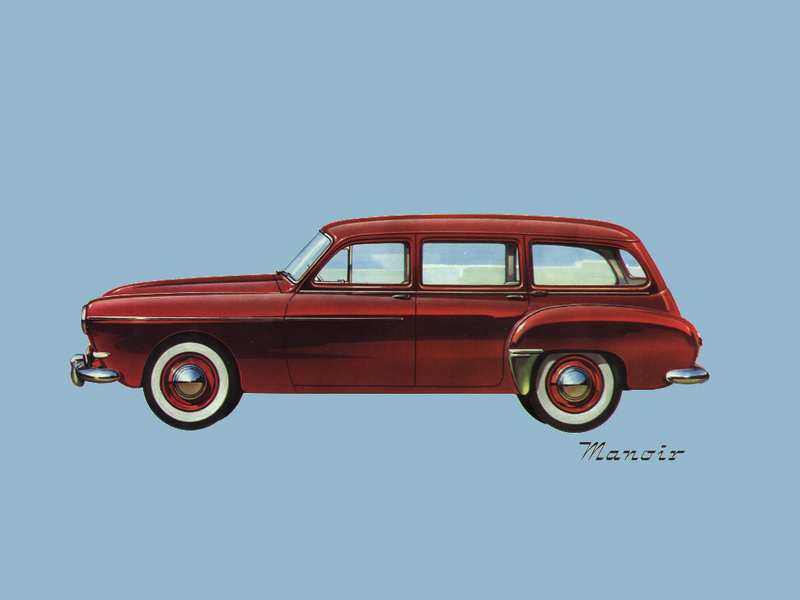 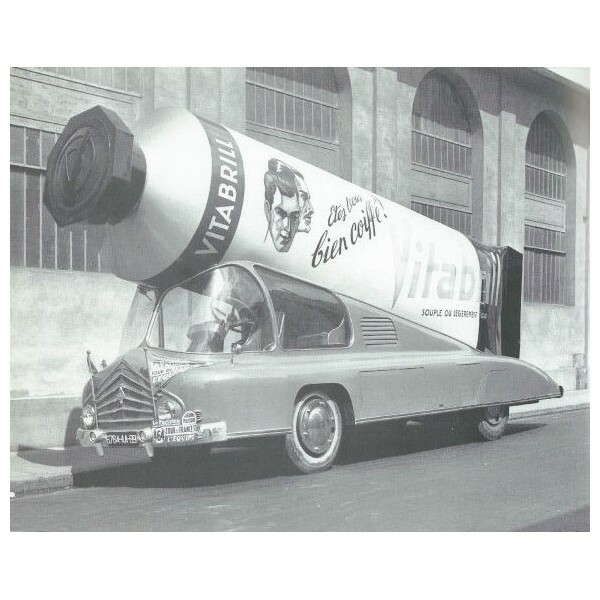 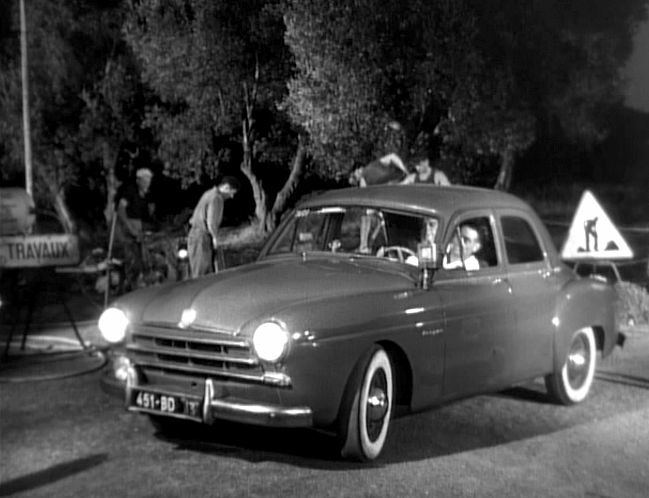 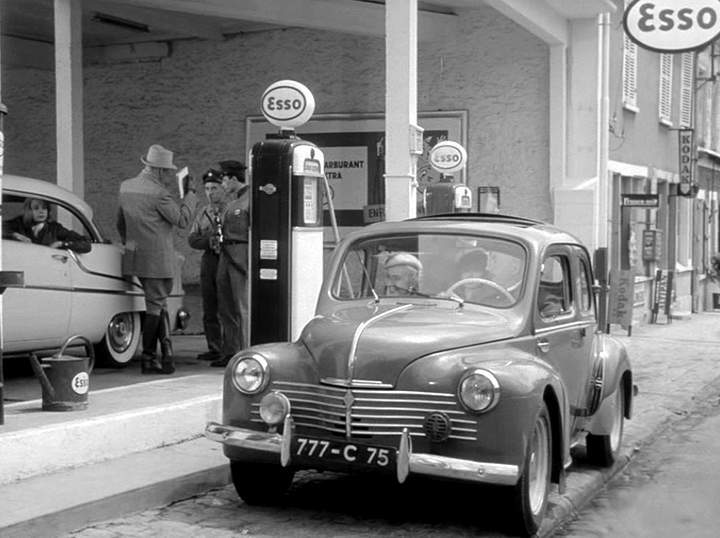 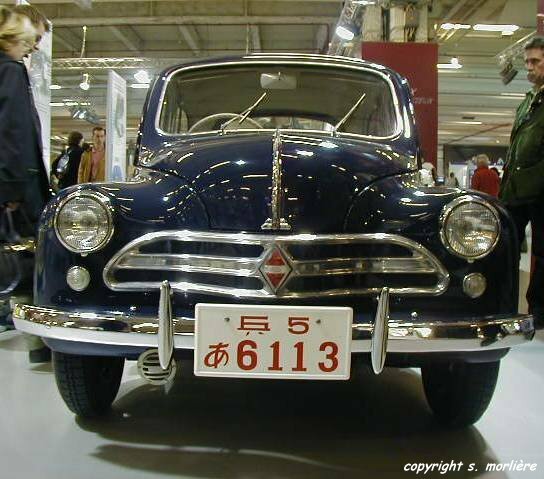 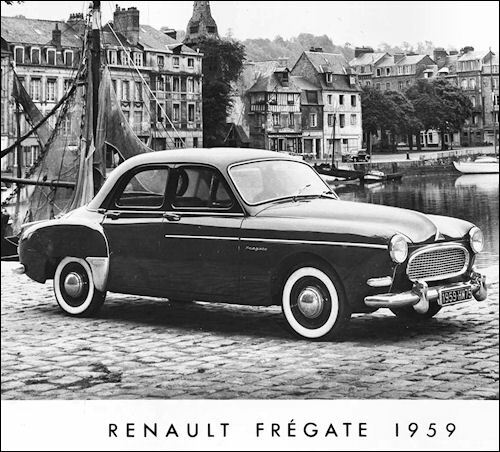 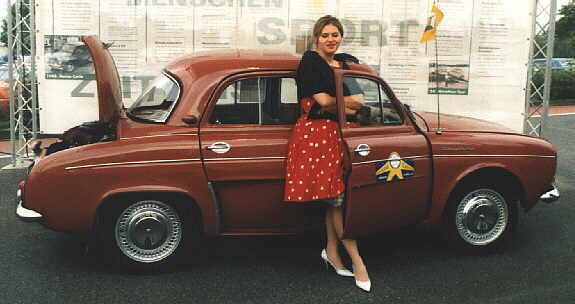 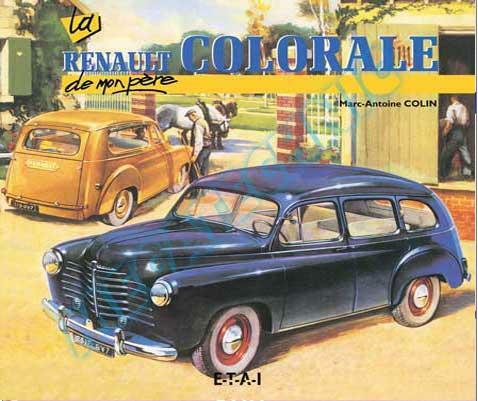 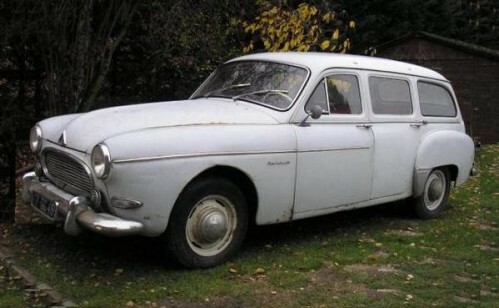 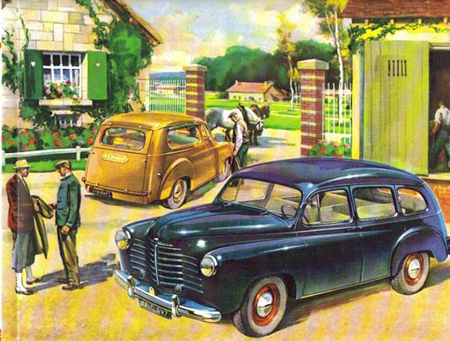 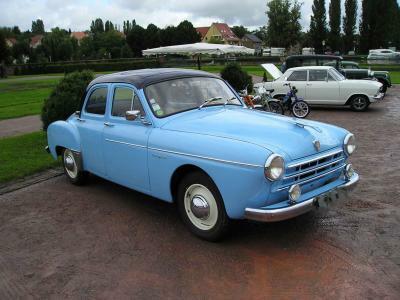 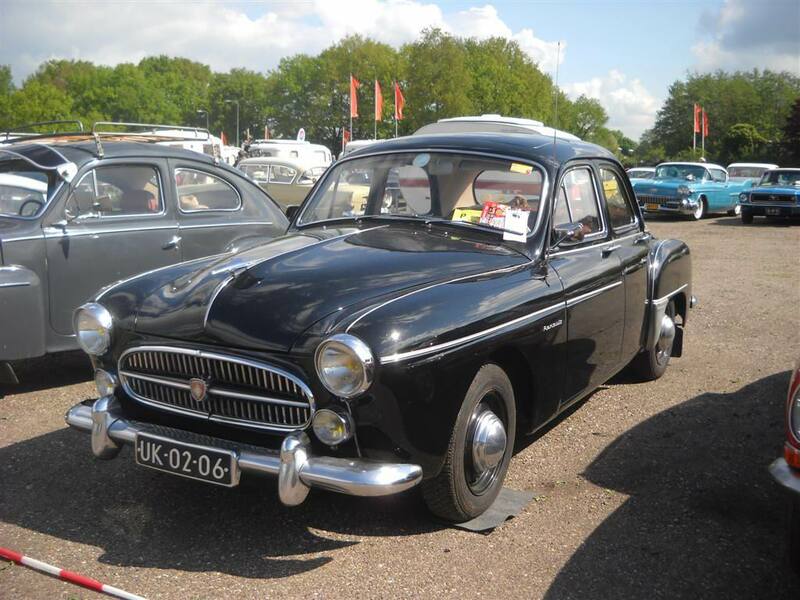 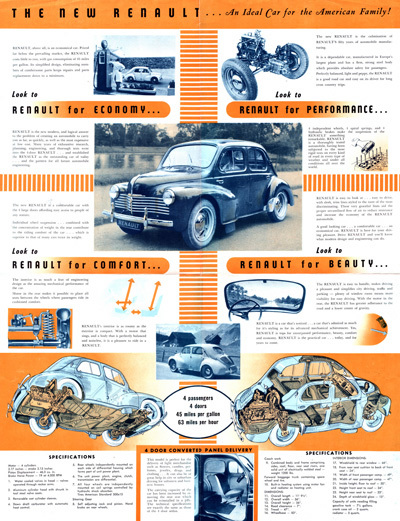 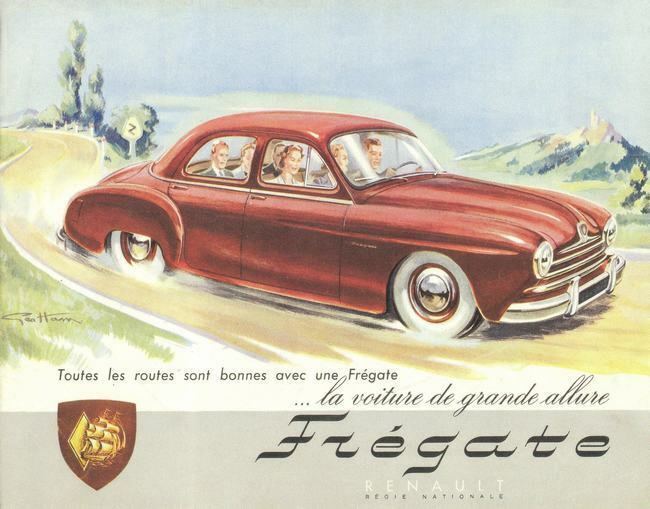 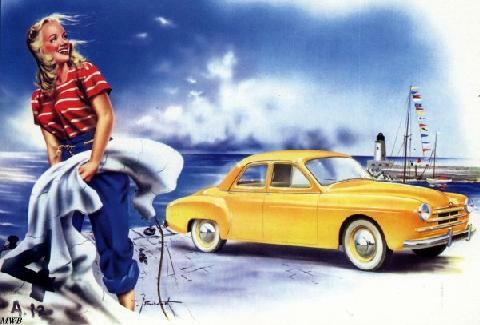 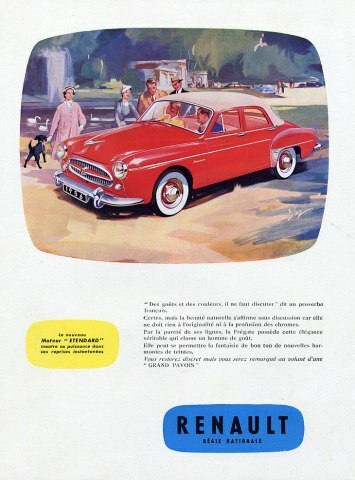 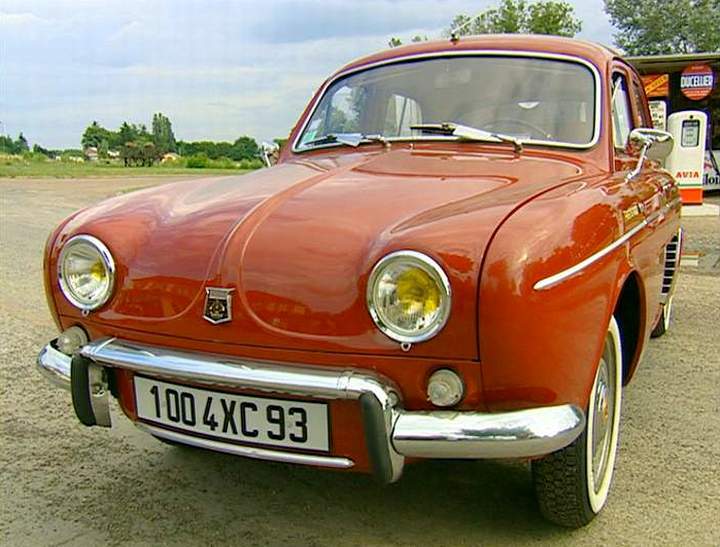 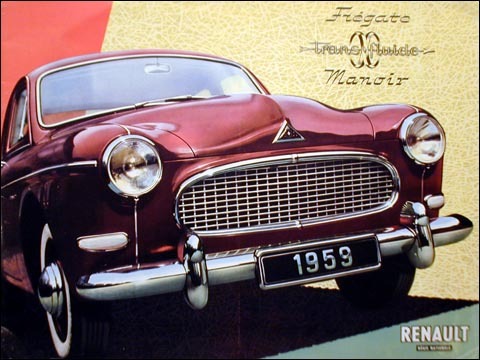 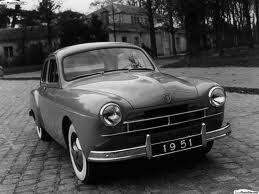 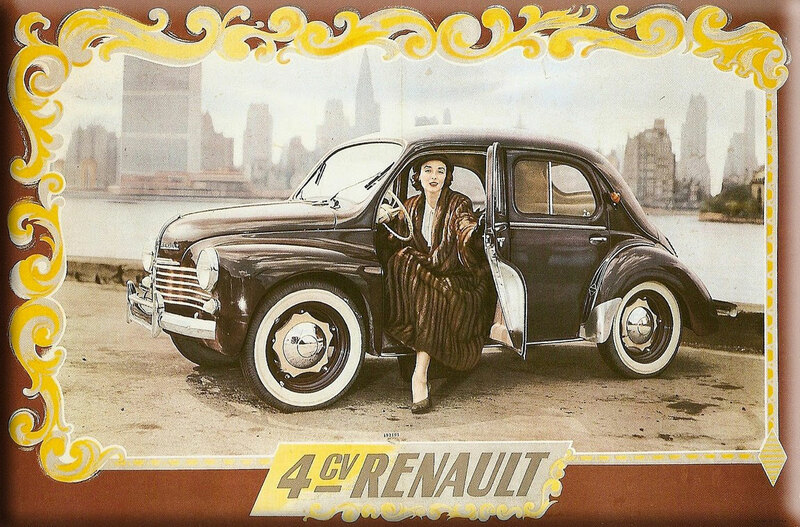 Renault debuted its flagship model, the largely conventional 2-litre 4-cylinder Renault Frégate (1951–1960), shortly thereafter. 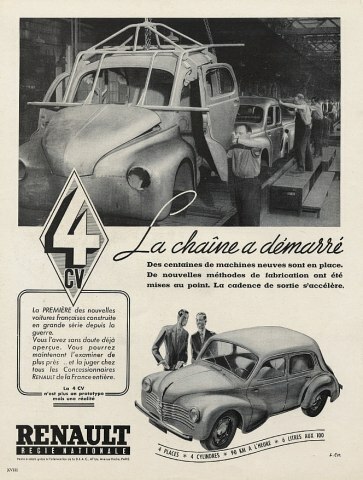 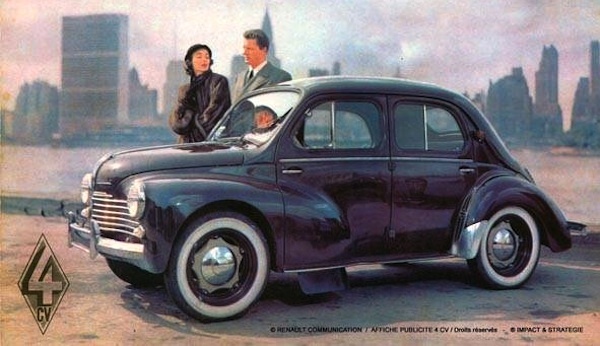 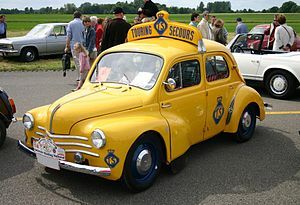 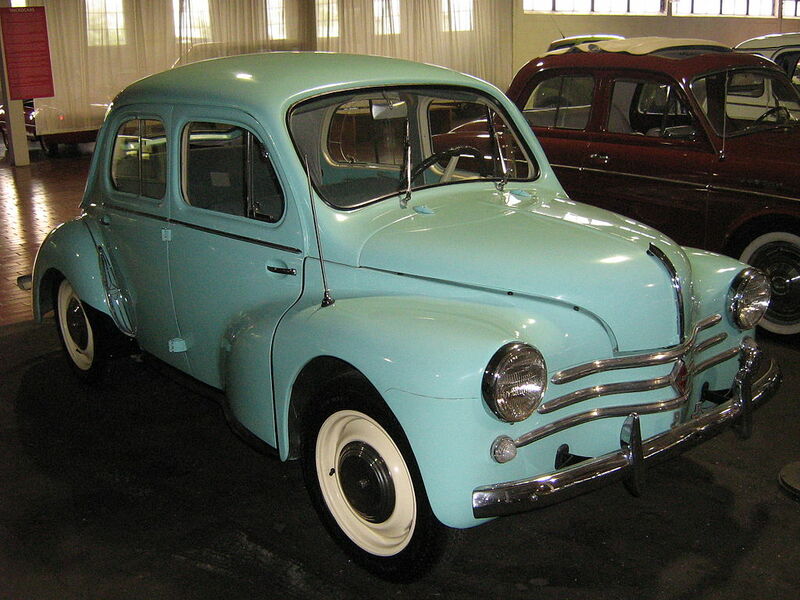 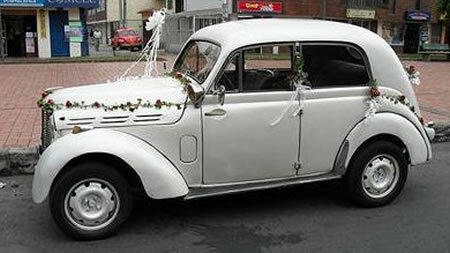 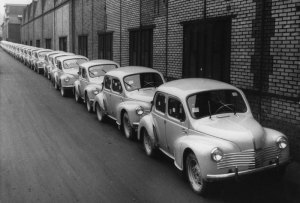 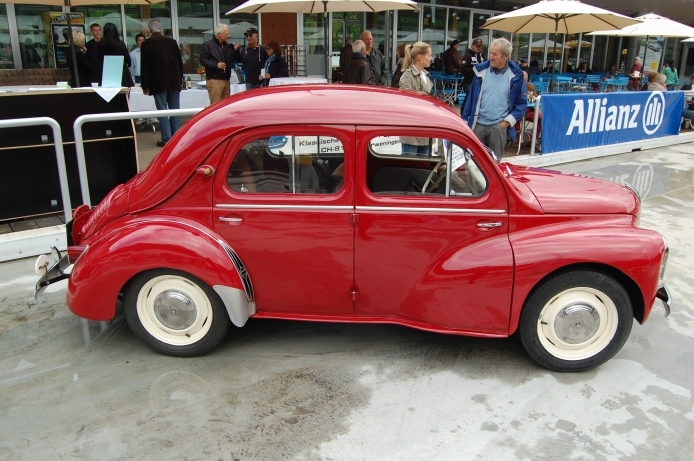 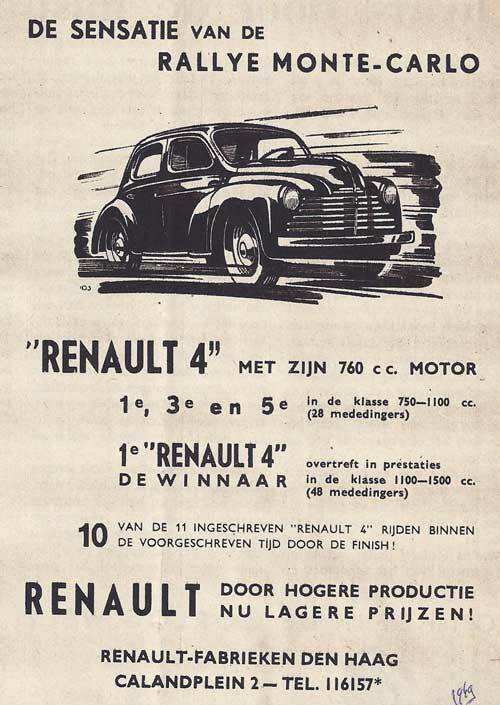 The 4CV proved itself a capable rival for cars such as the Morris Minor and Volkswagen Beetle; its sales of more than half a million ensured its production until 1961. 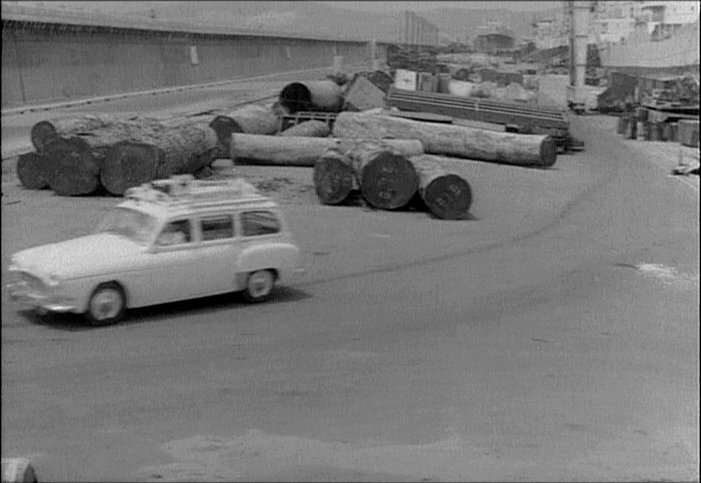 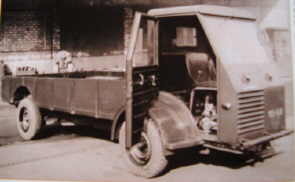 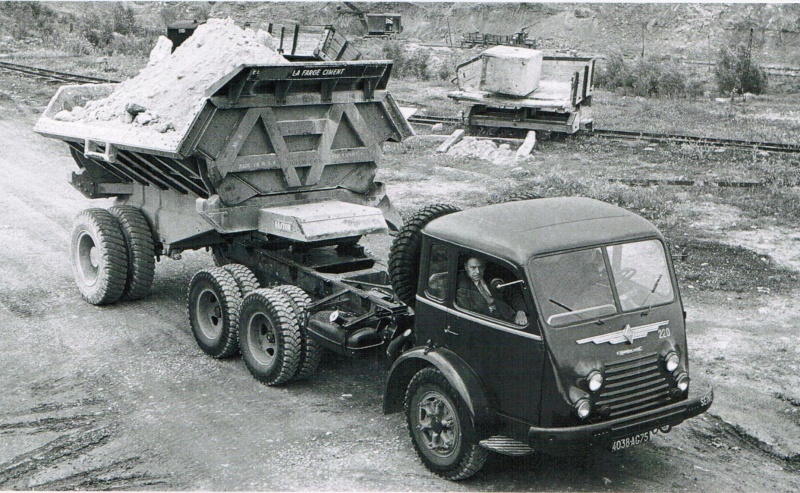 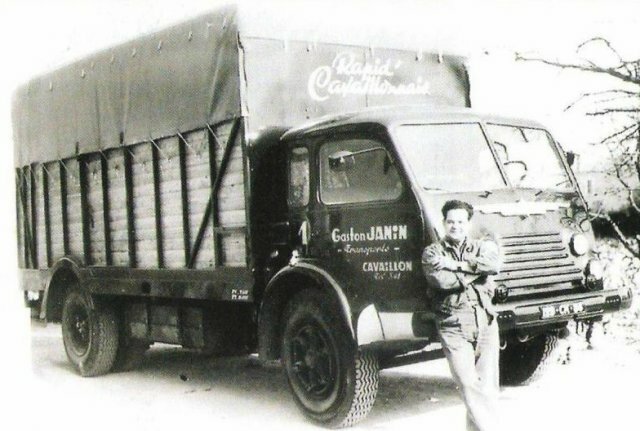 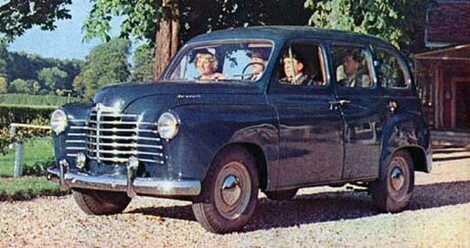 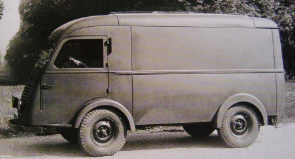 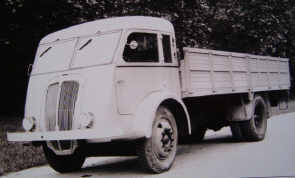 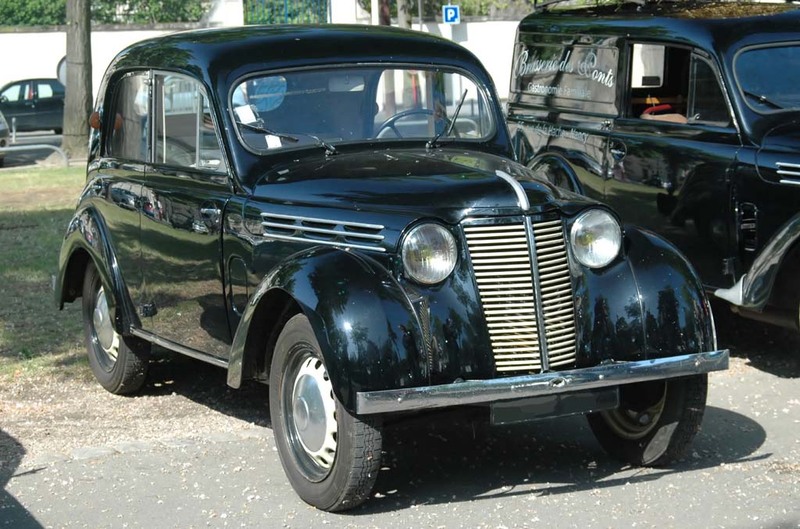 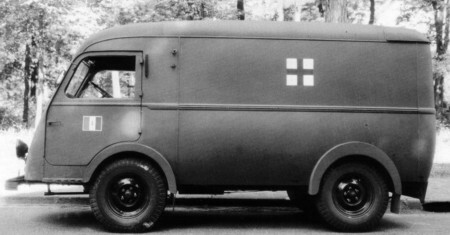 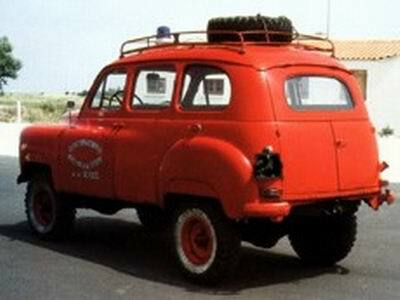 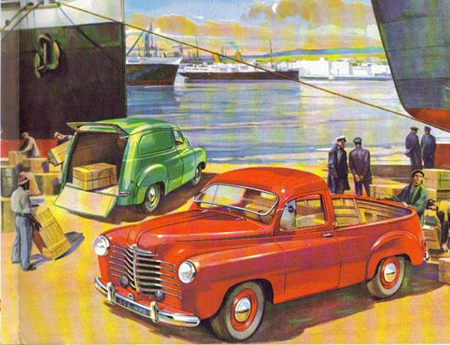 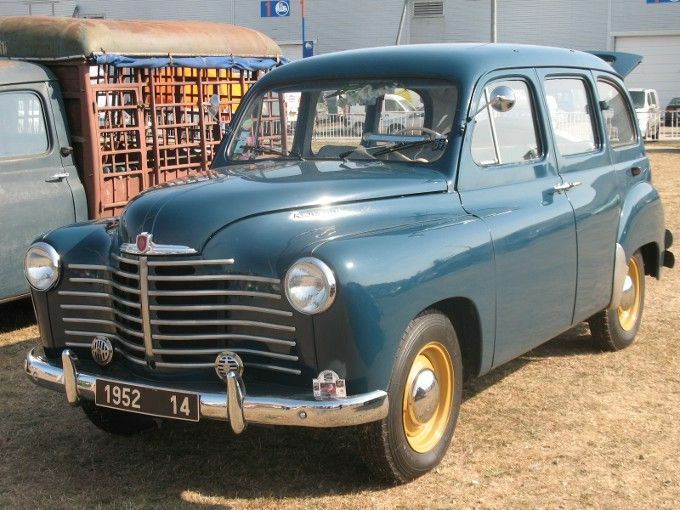 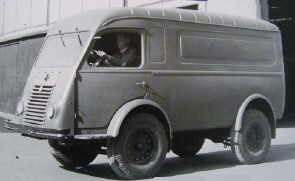 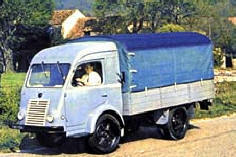 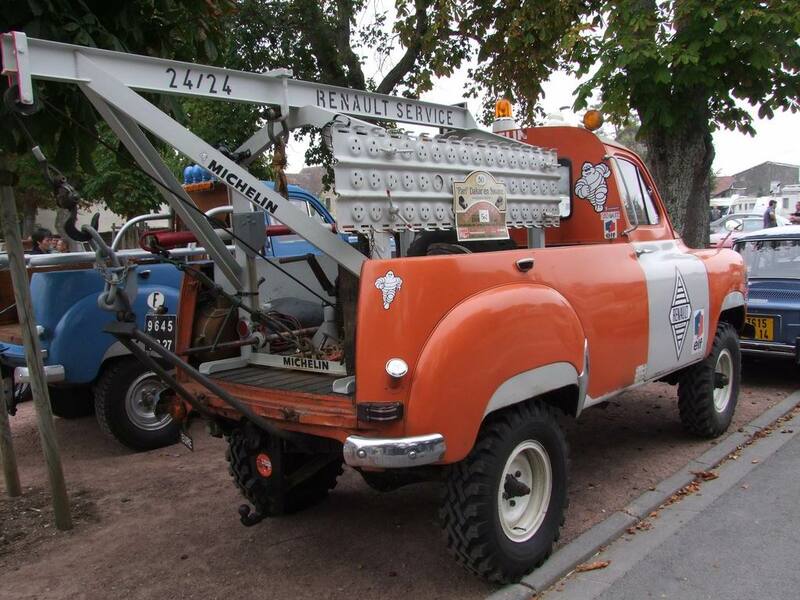 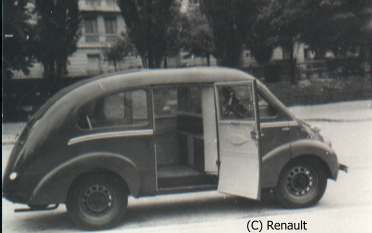 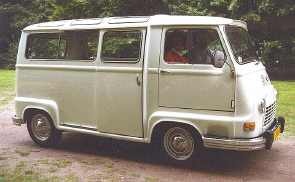 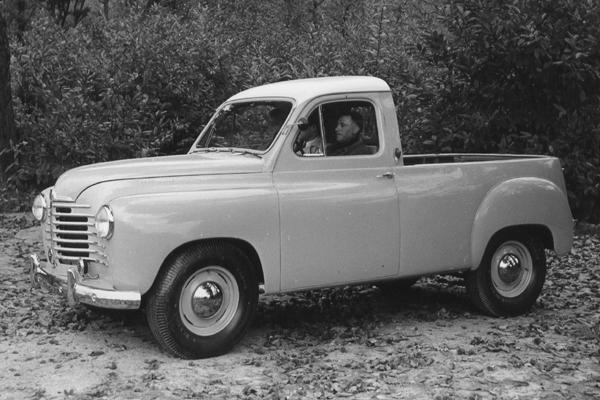 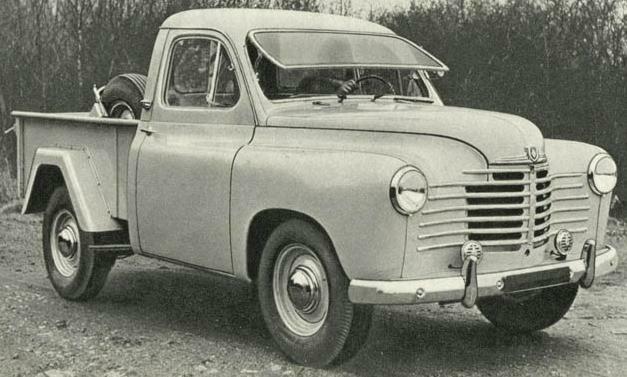 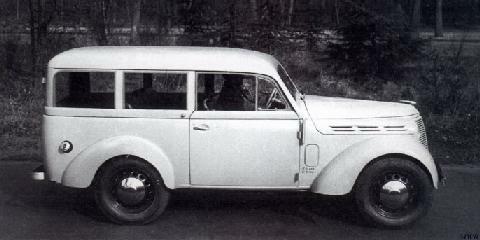 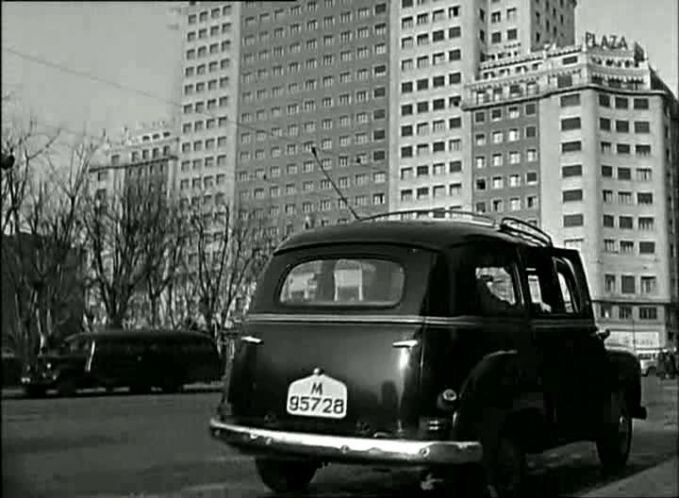 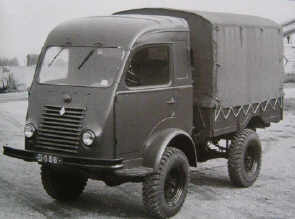 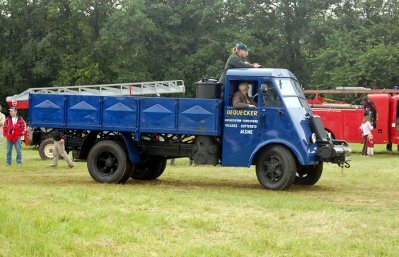 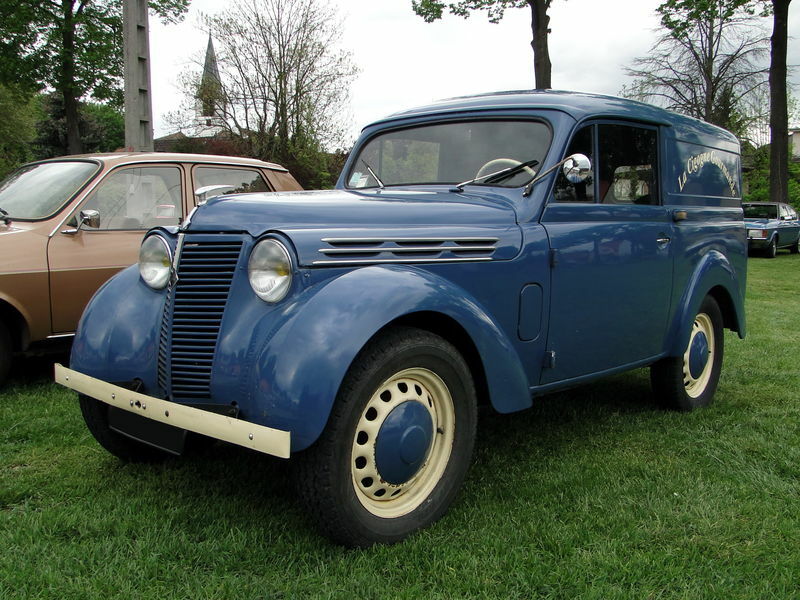 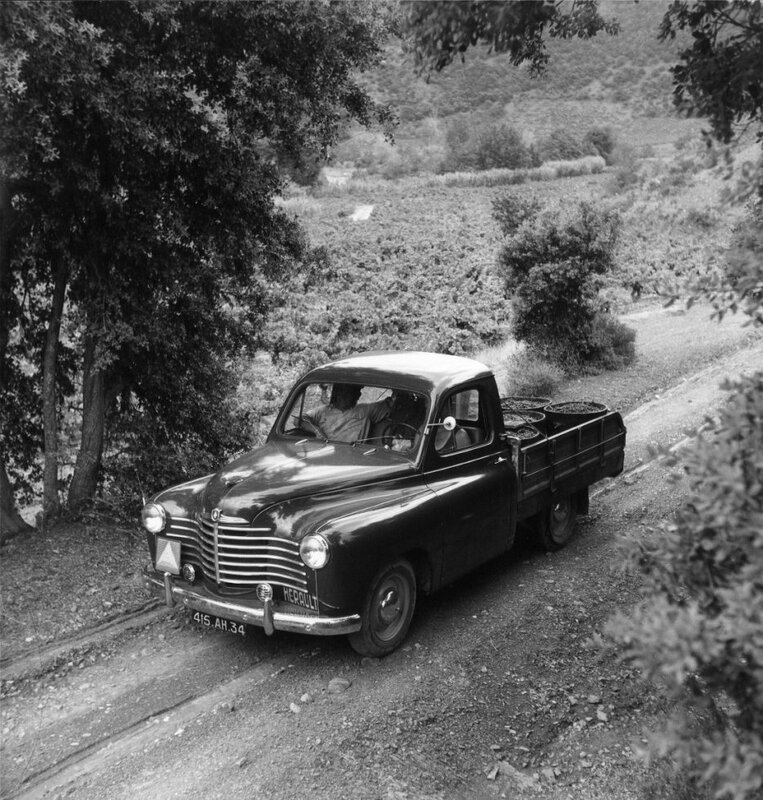 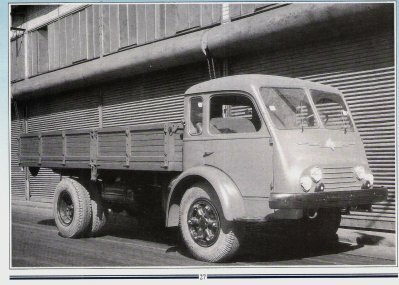 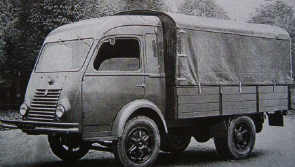 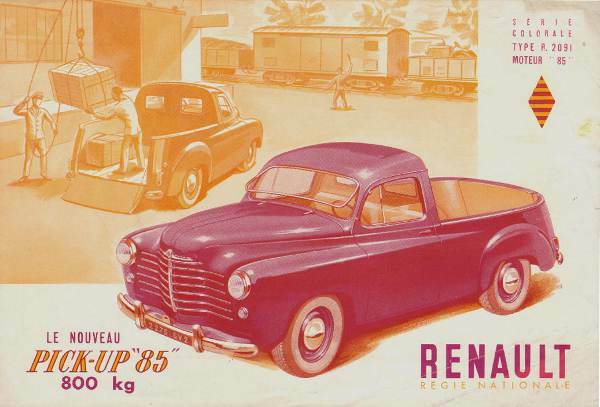 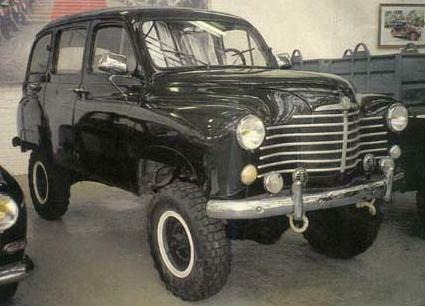 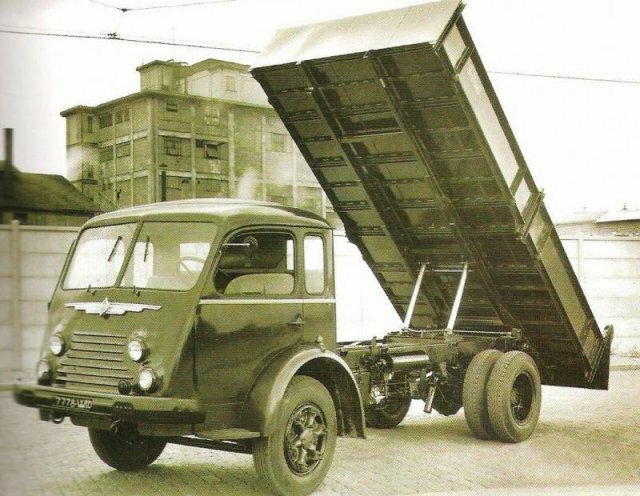 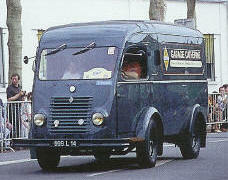 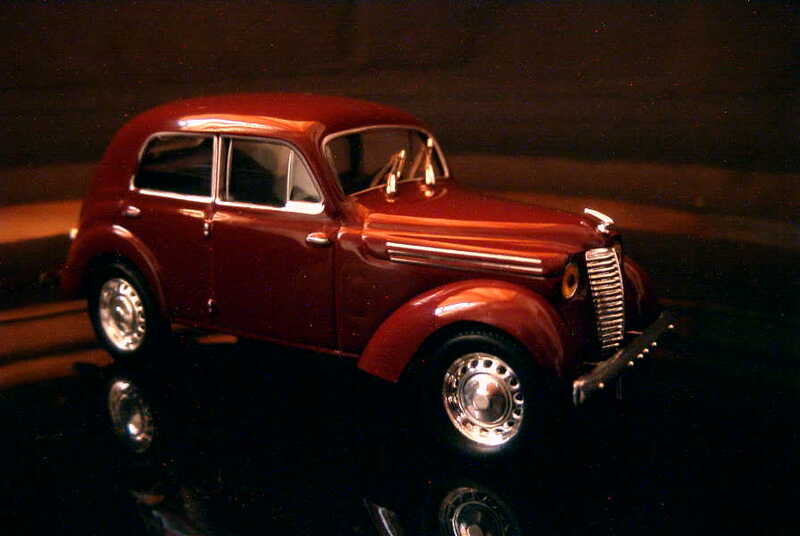 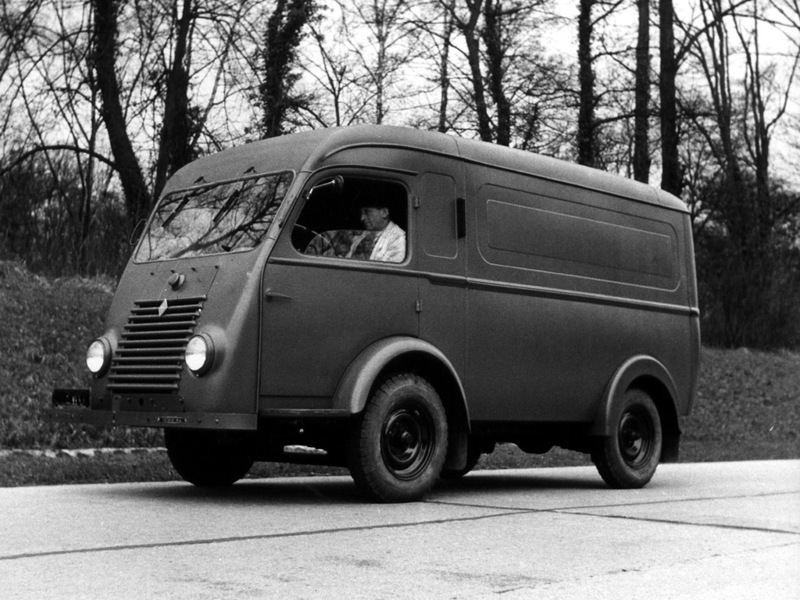 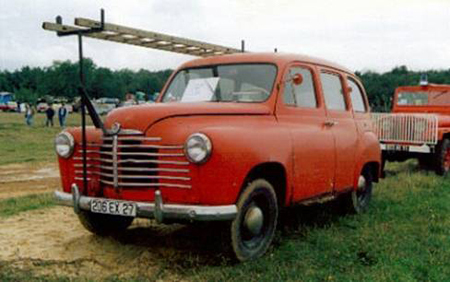 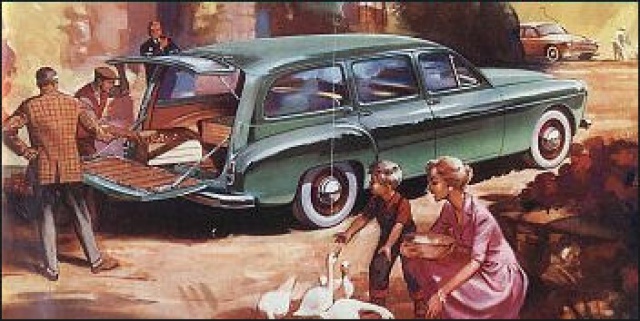 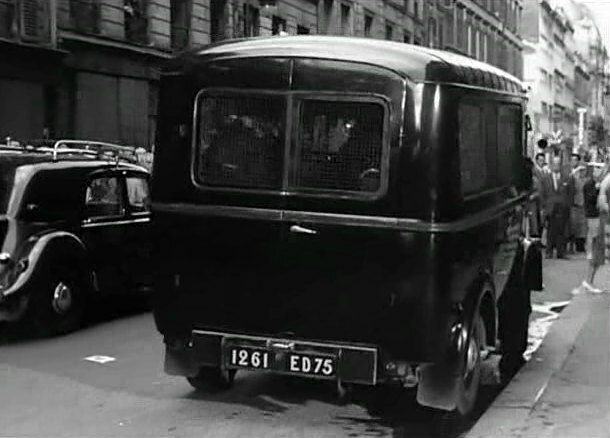 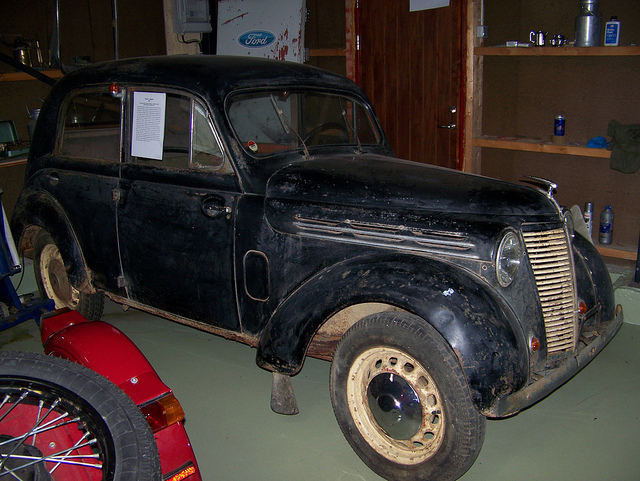 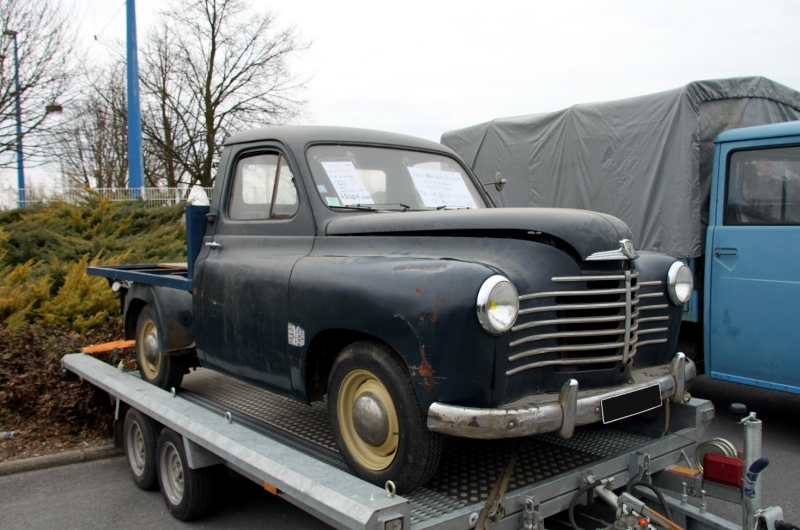 After the success of the 4CV, Lefacheux continued to defy the postwar French Ministry of Industrial Production, which had wanted to convert Renault solely to truck manufacture, by directing the development of its successor. 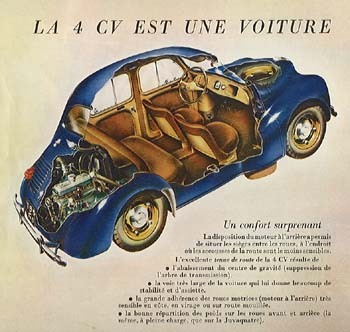 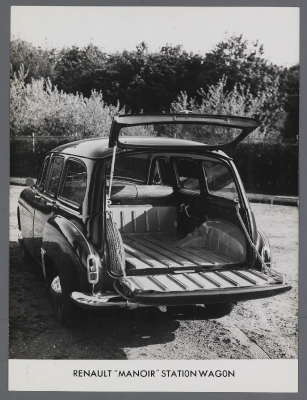 He oversaw the prototyping of the Dauphine (until his death) – enlisting the help of artist Paule Marrot in pioneering the company’s textile and color division. 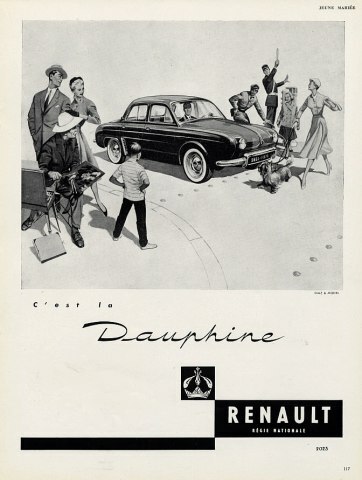 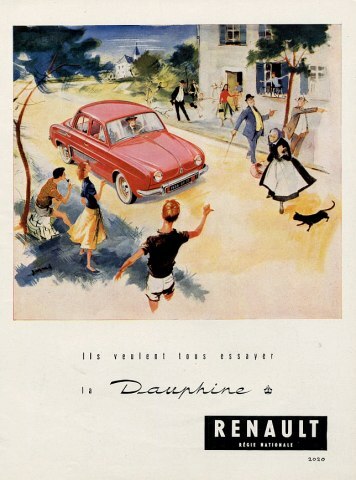 The Dauphine sold extremely well as the company expanded production and sales further abroad, including Africa and North America. 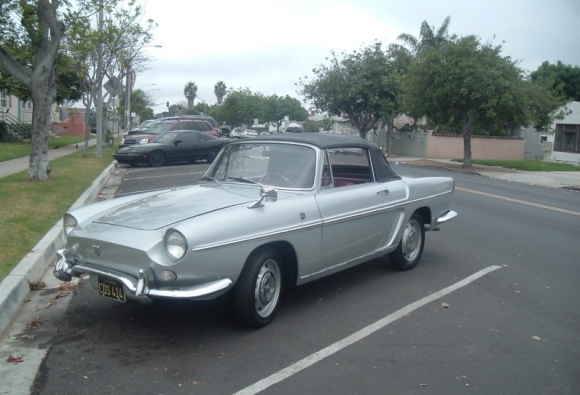 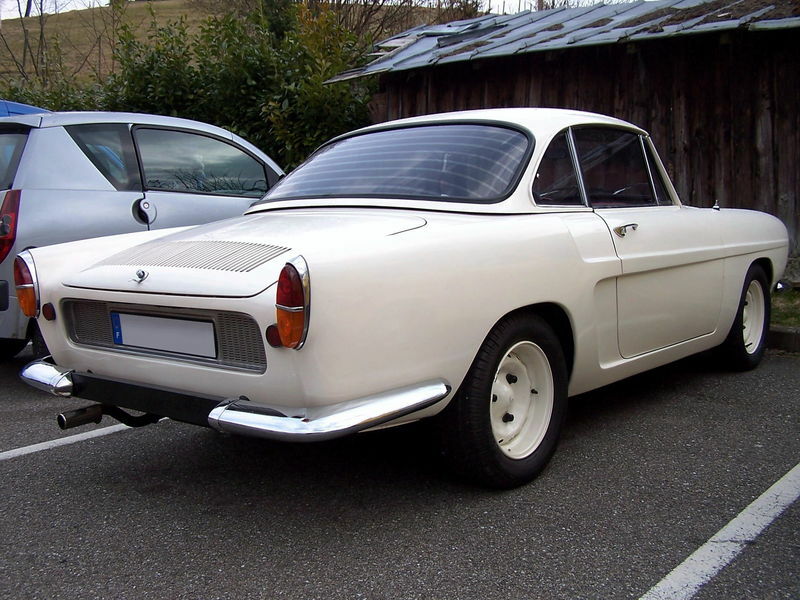 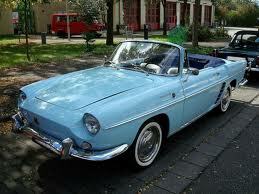 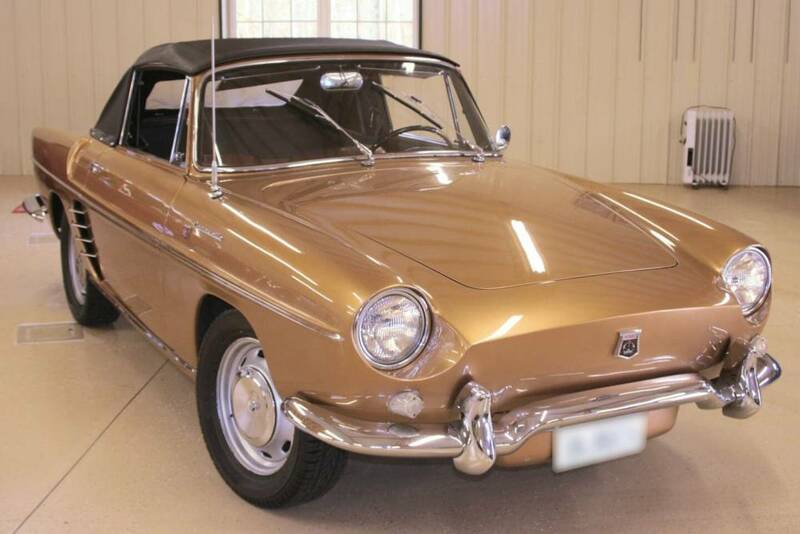 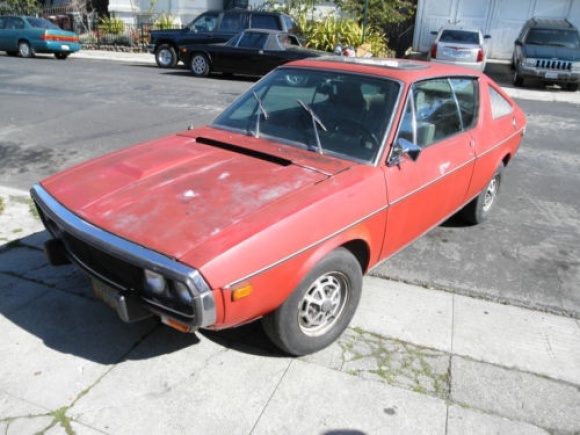 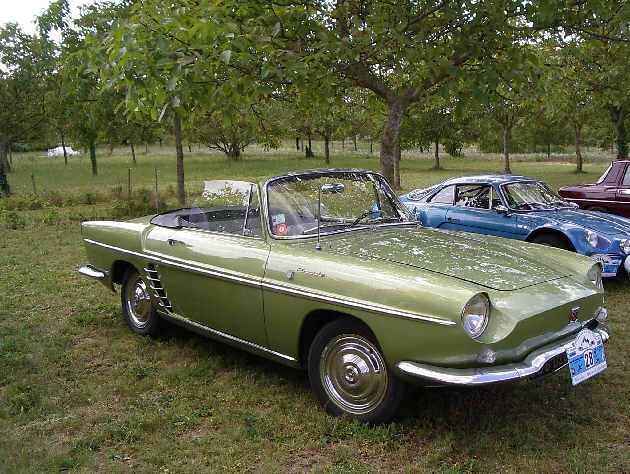 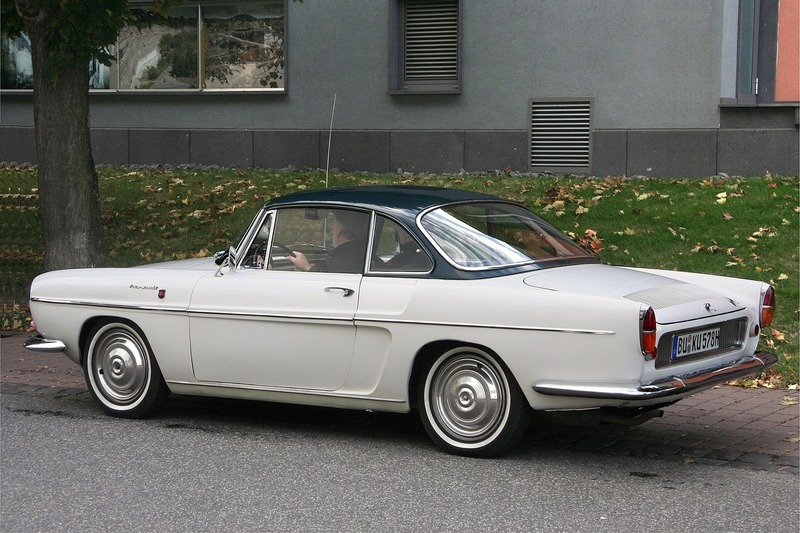 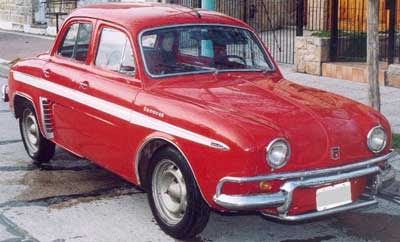 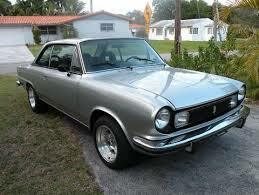 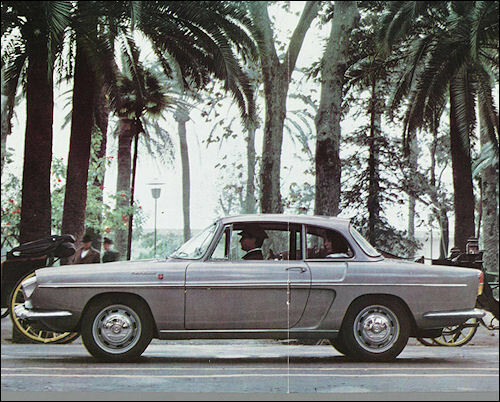 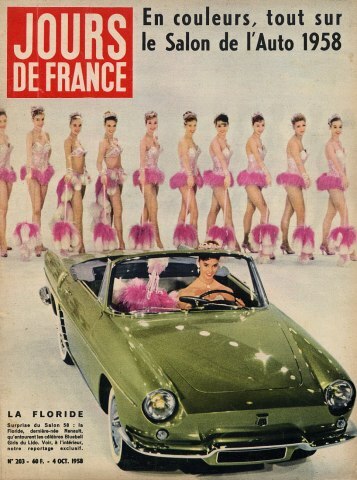 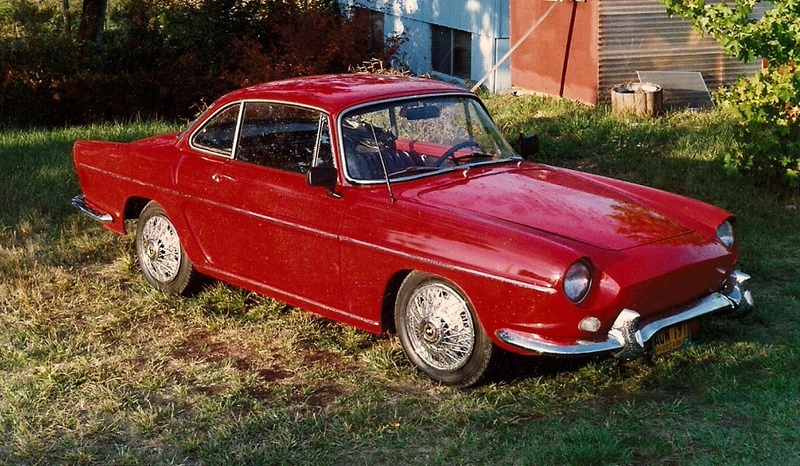 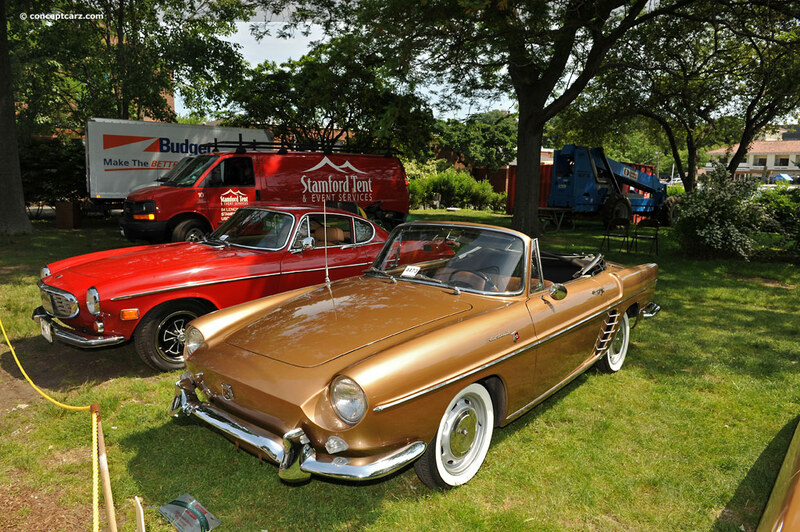 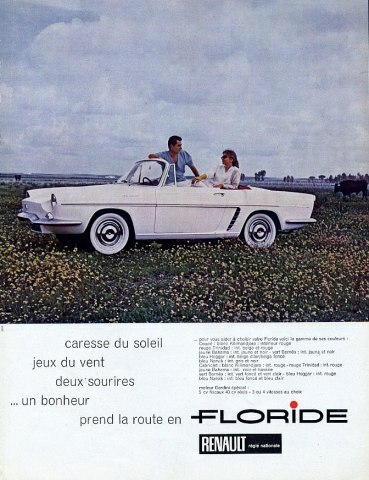 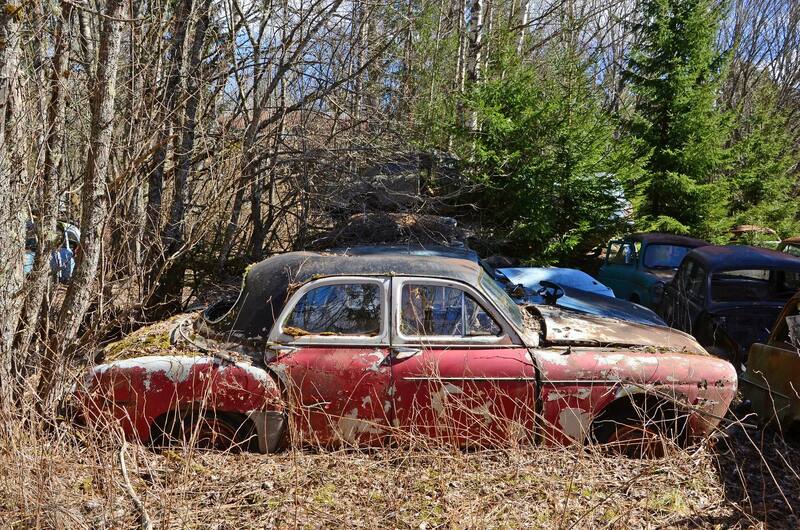 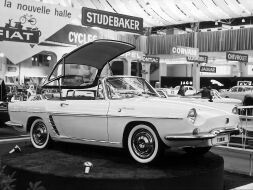 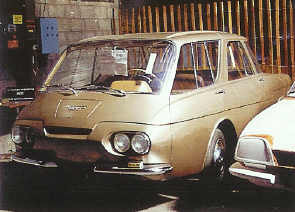 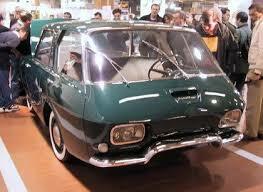 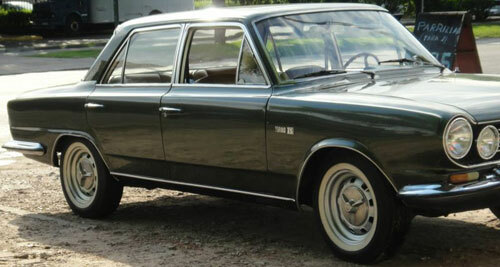 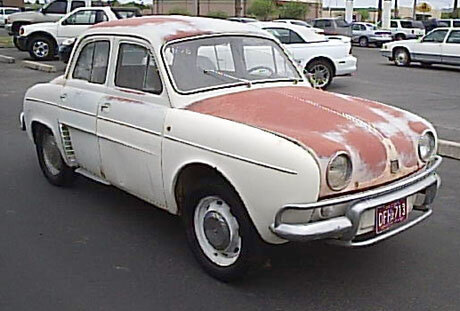 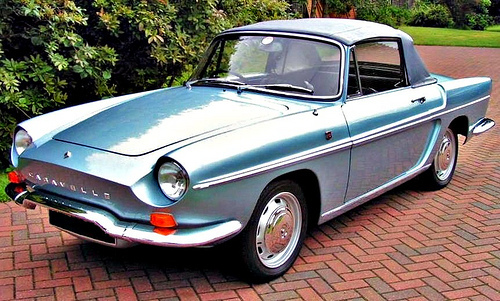 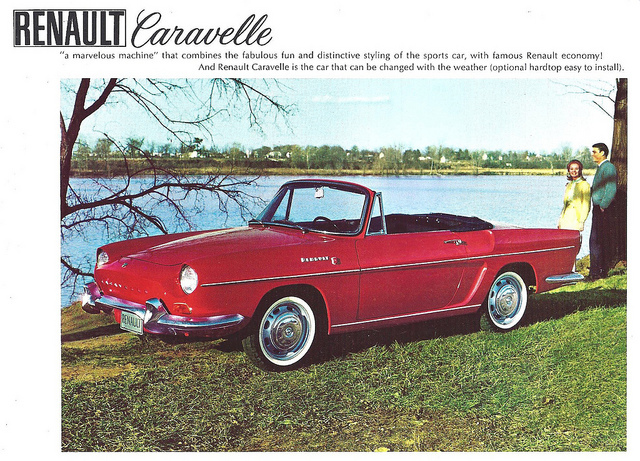 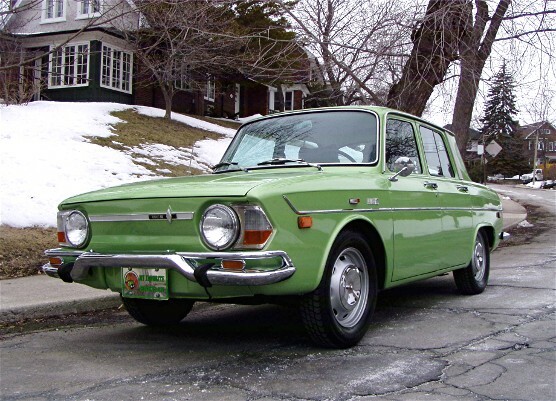 The Dauphine sold well initially in the US, where it subsequently became outdated against increased competition, including from the country’s nascent domestic compacts such as the Chevrolet Corvair. 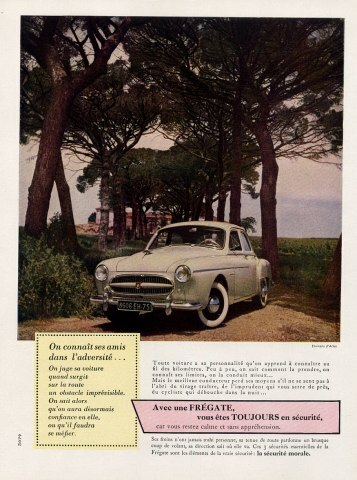 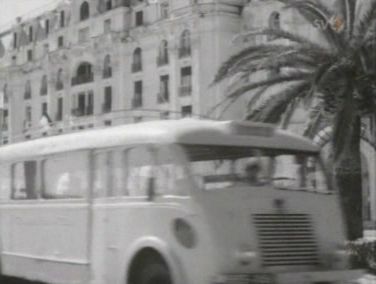 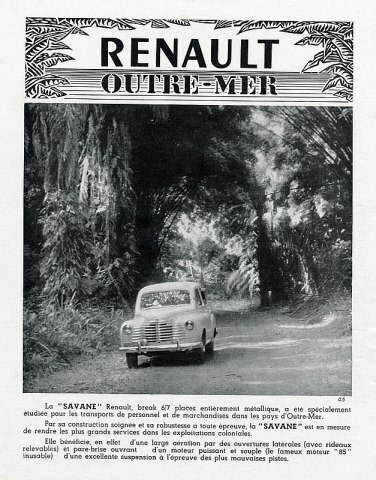 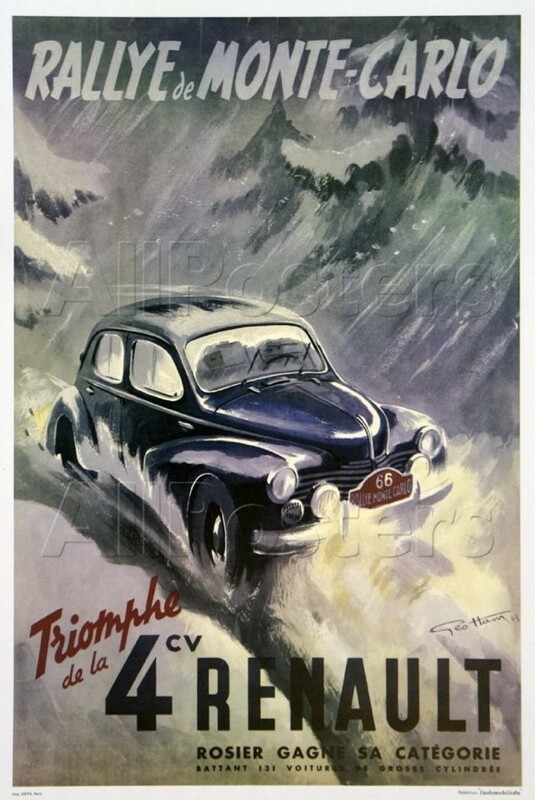 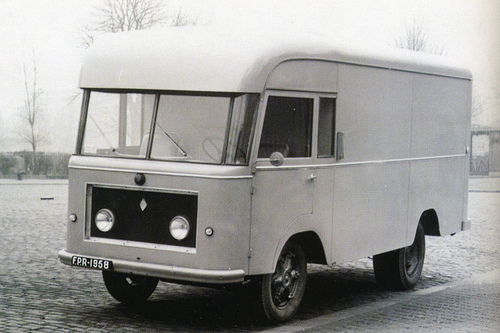 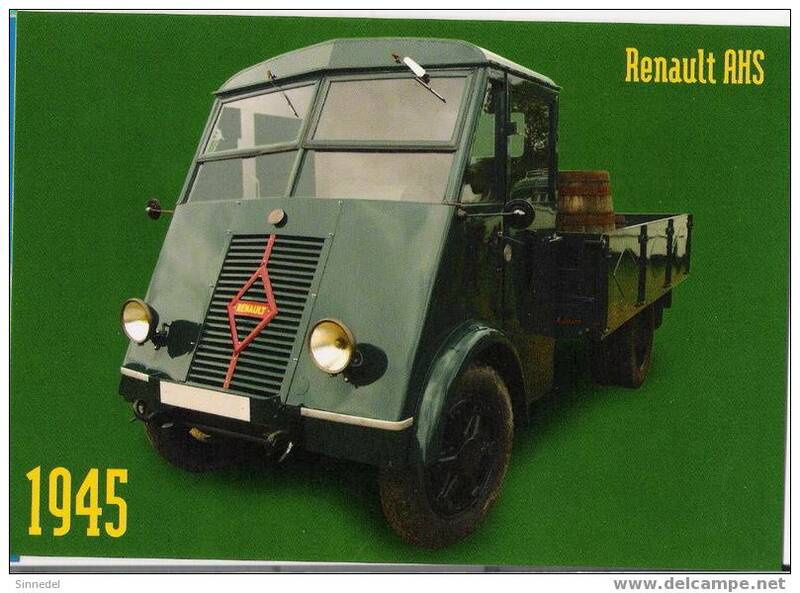 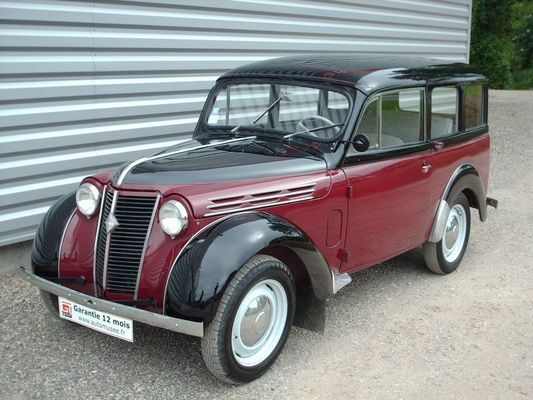 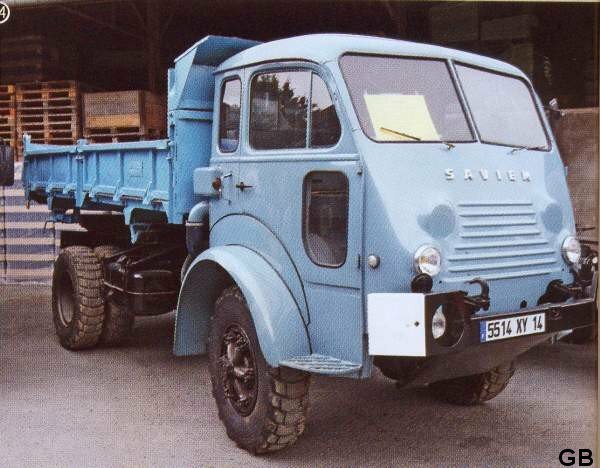 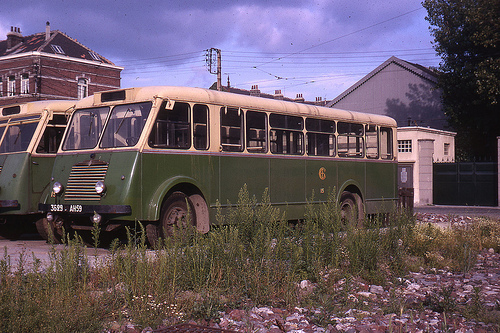 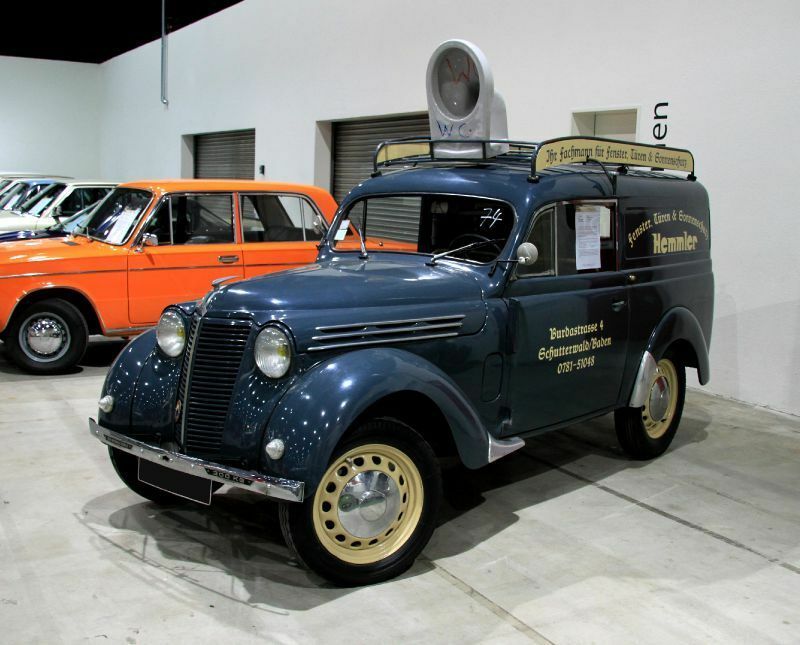 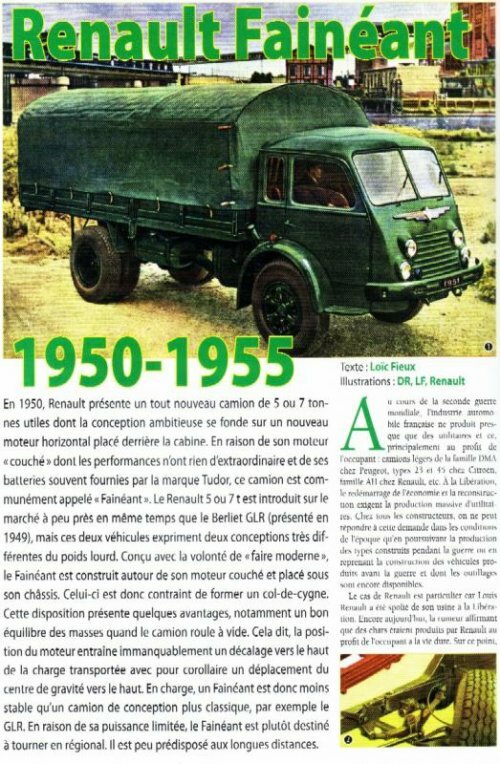 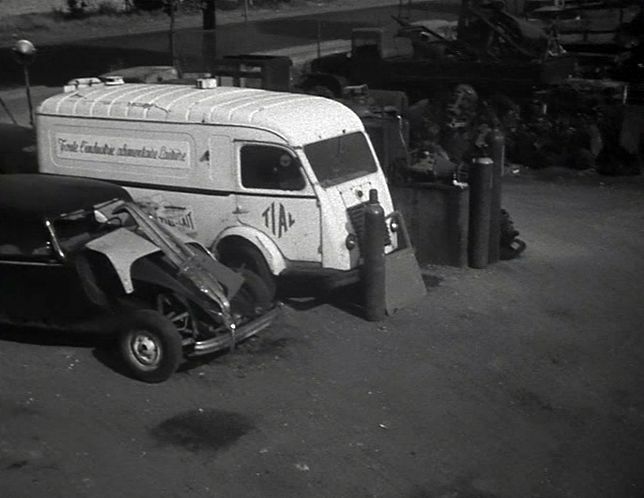 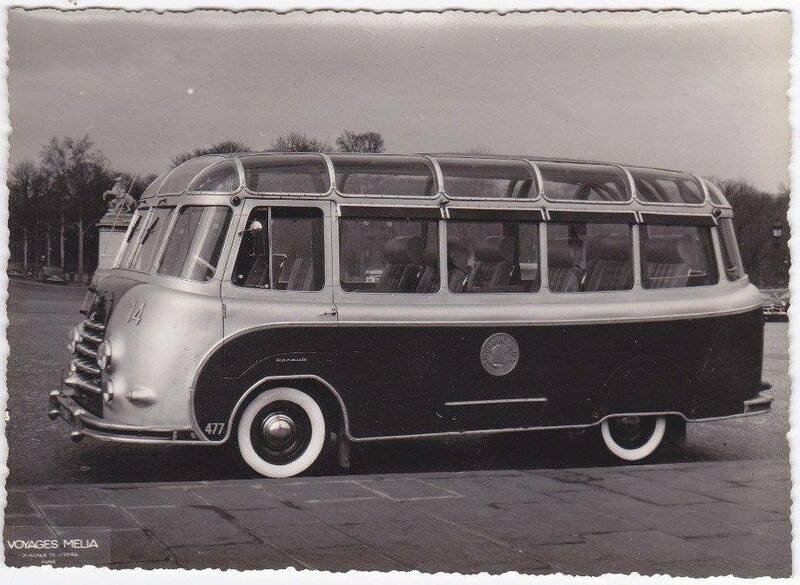 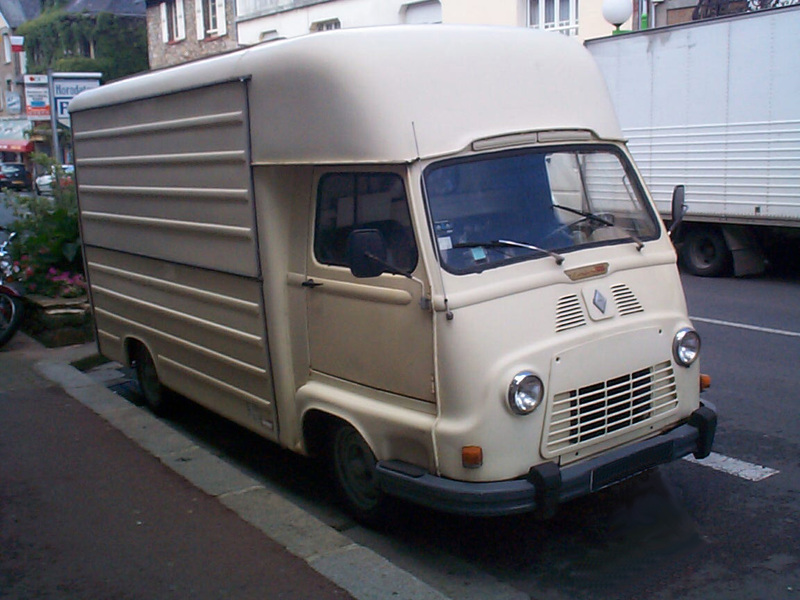 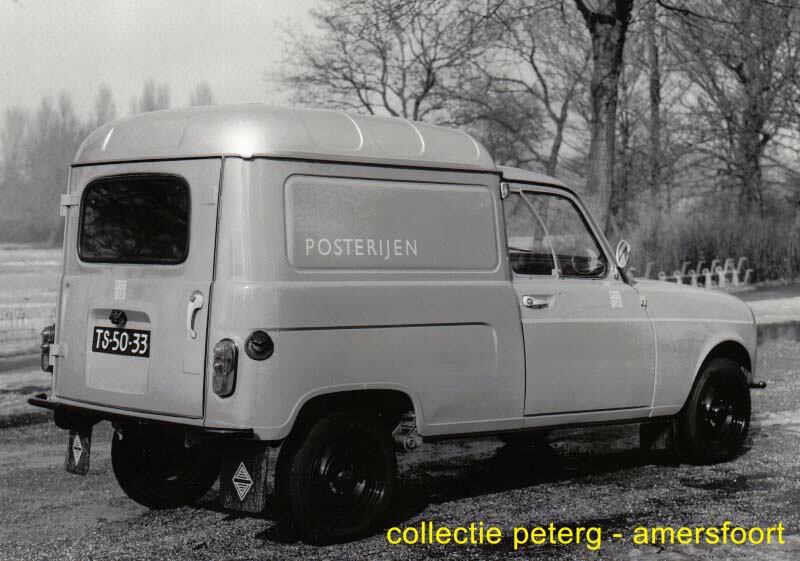 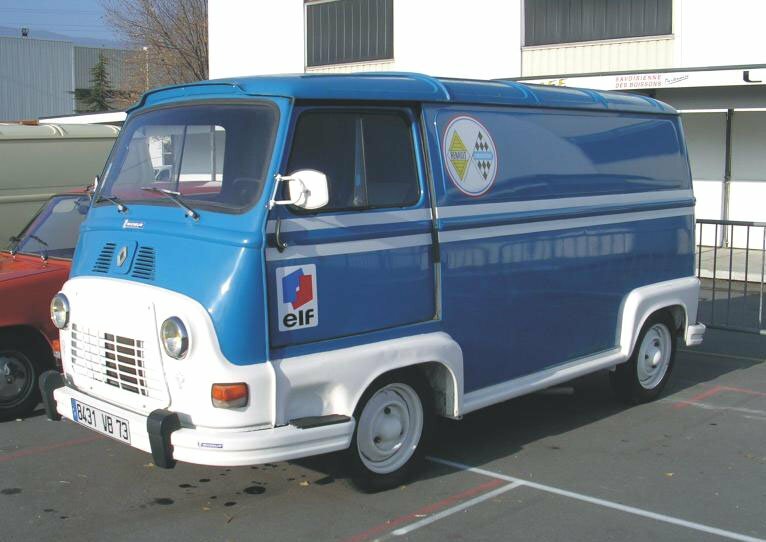 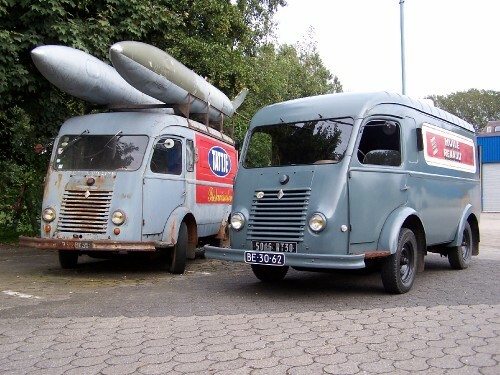 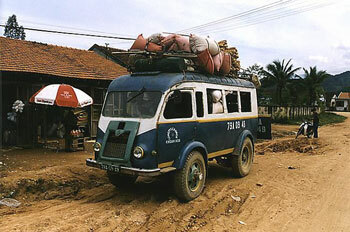 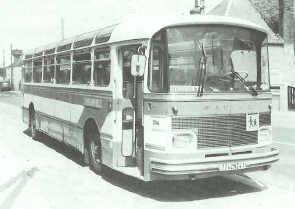 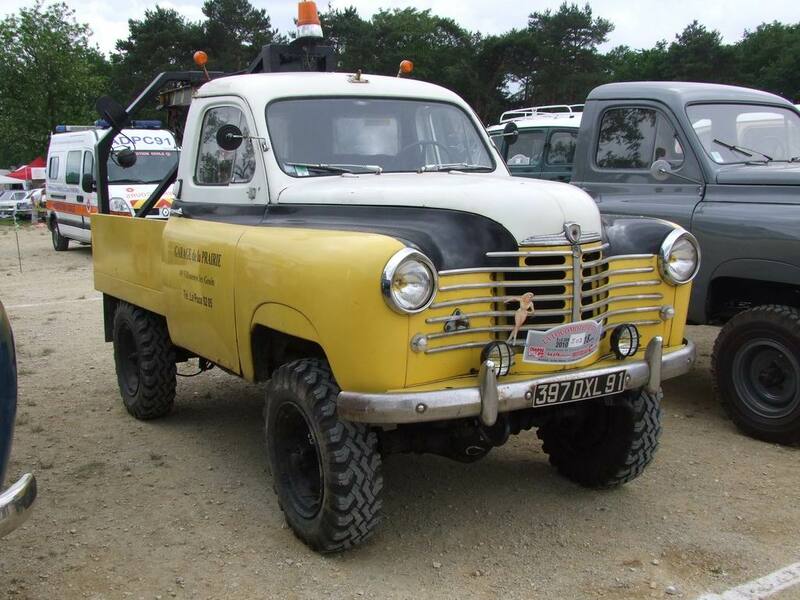 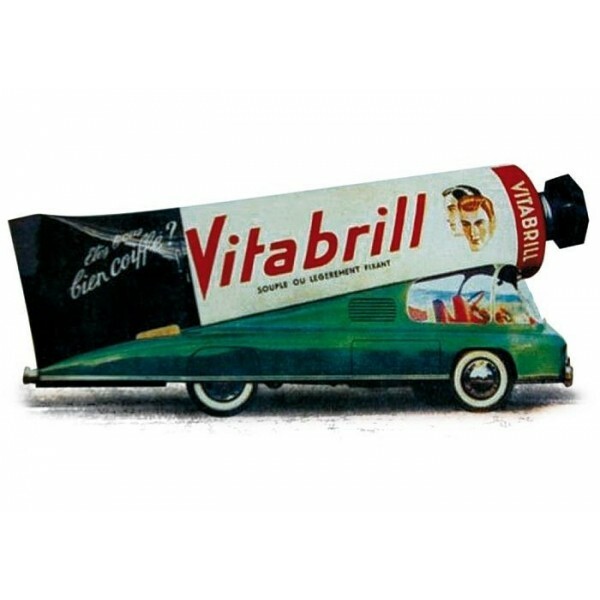 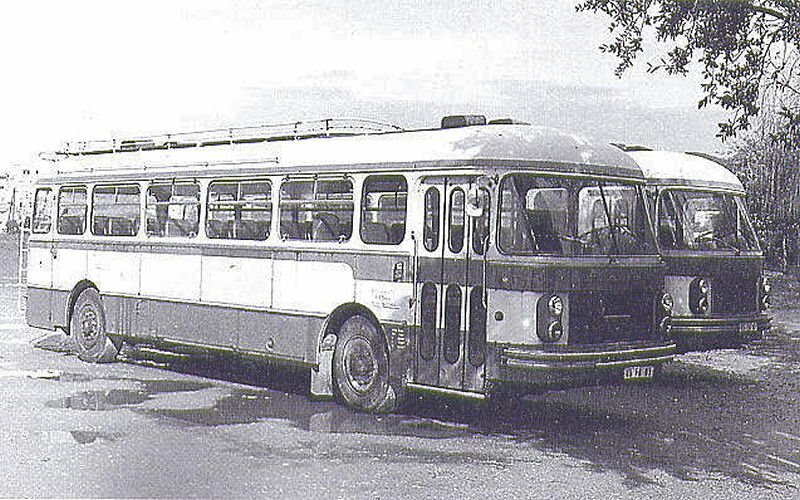 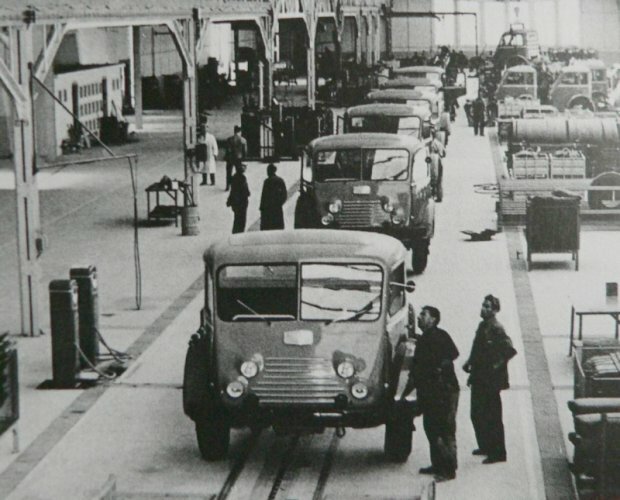 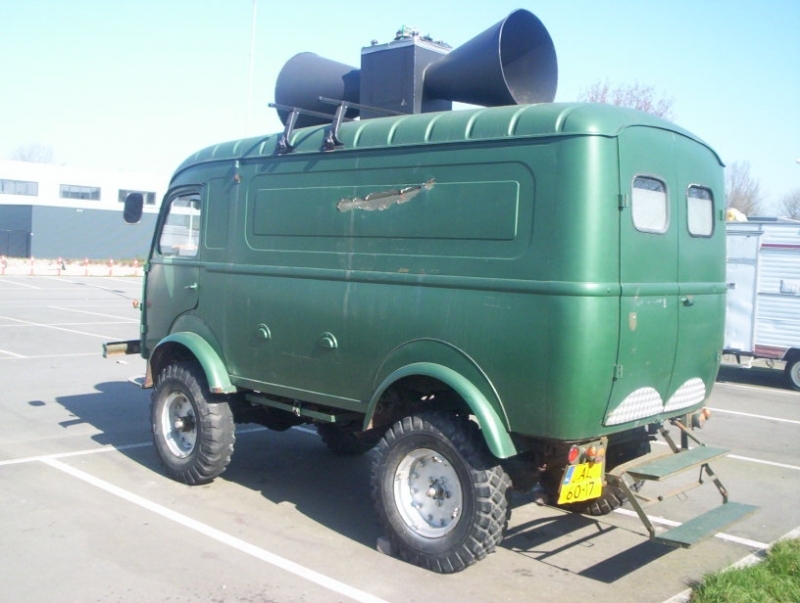 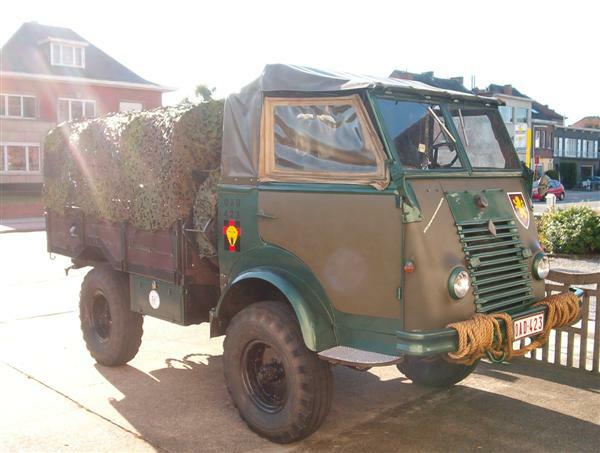 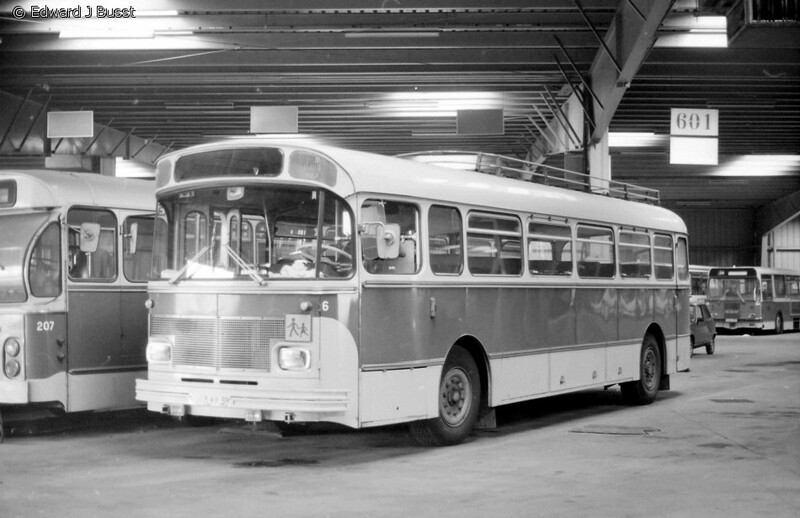 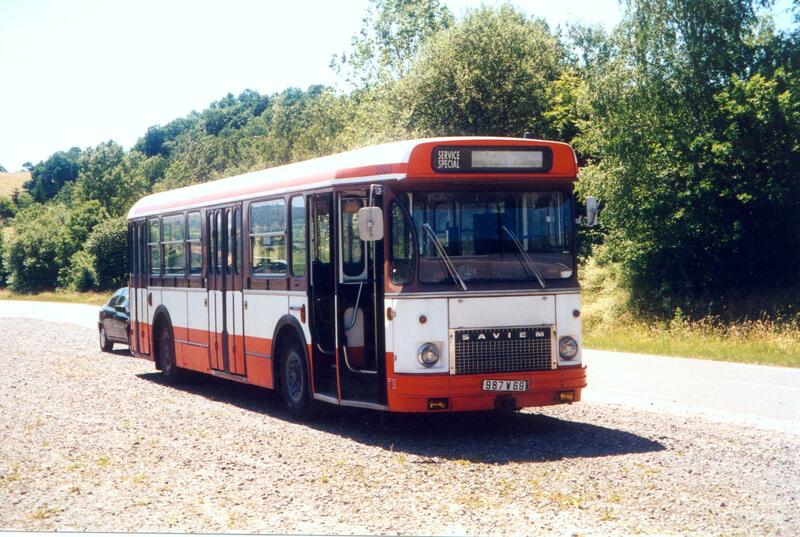 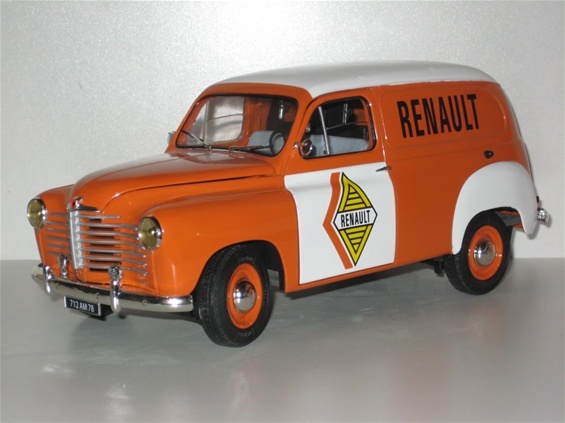 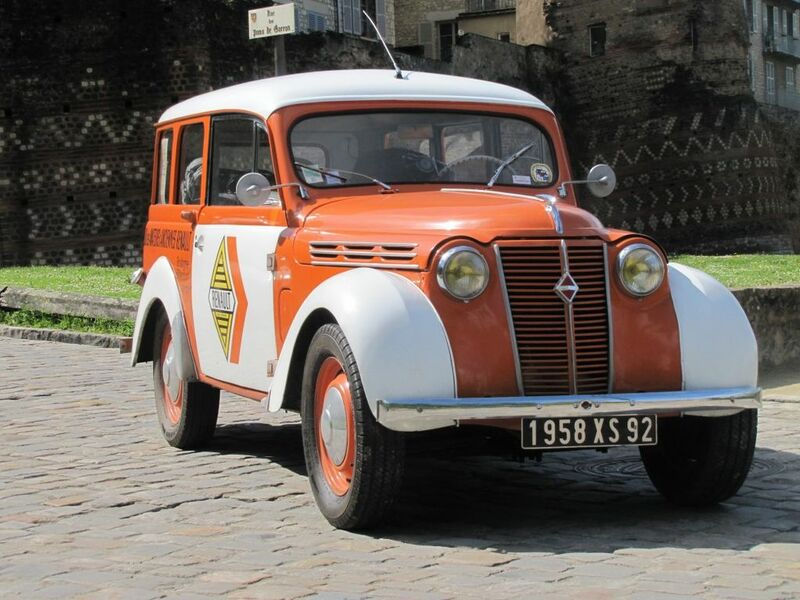 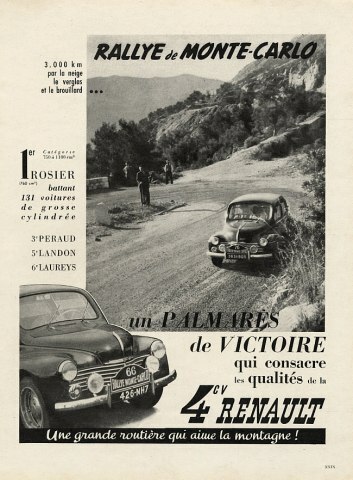 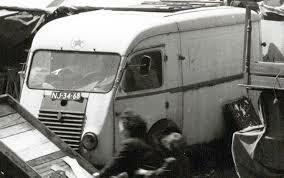 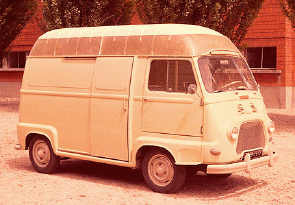 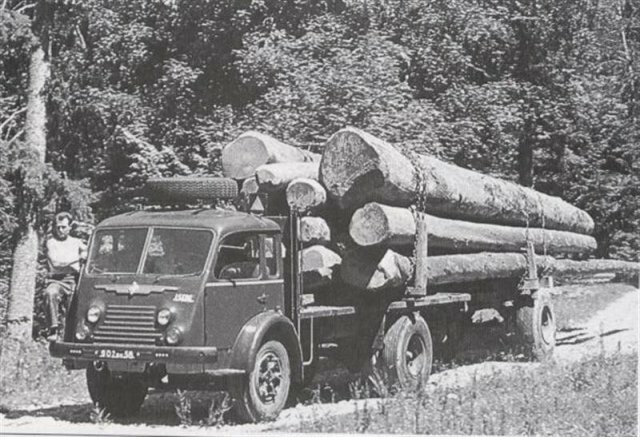 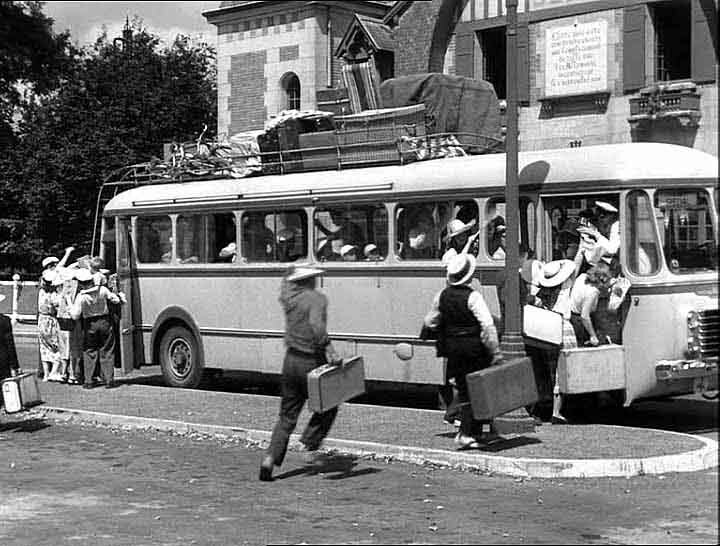 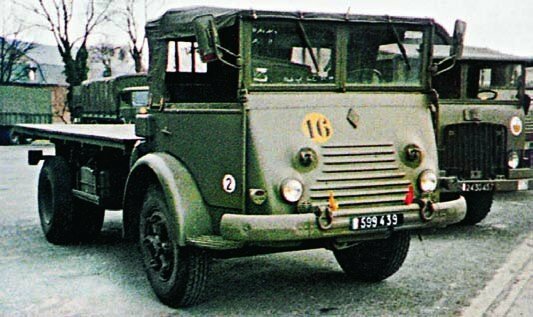 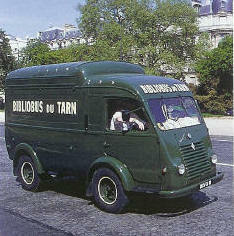 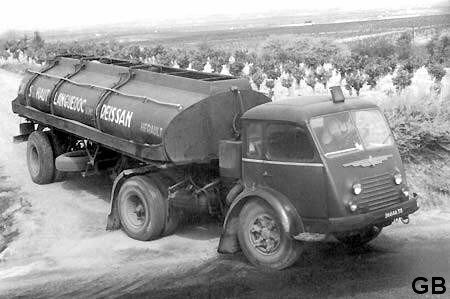 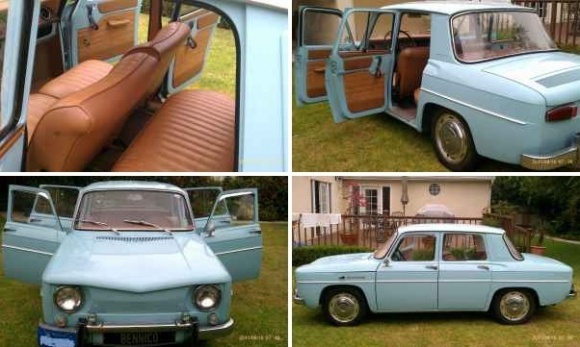 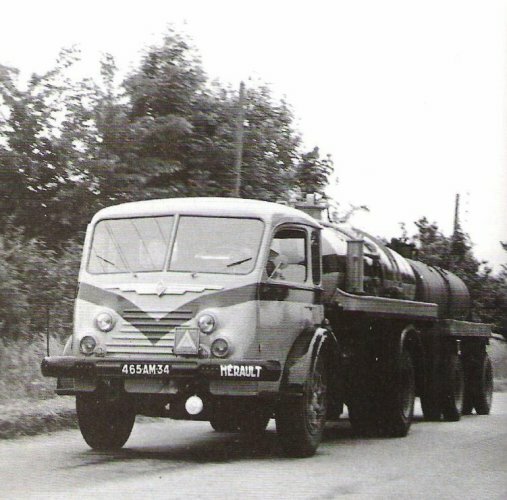 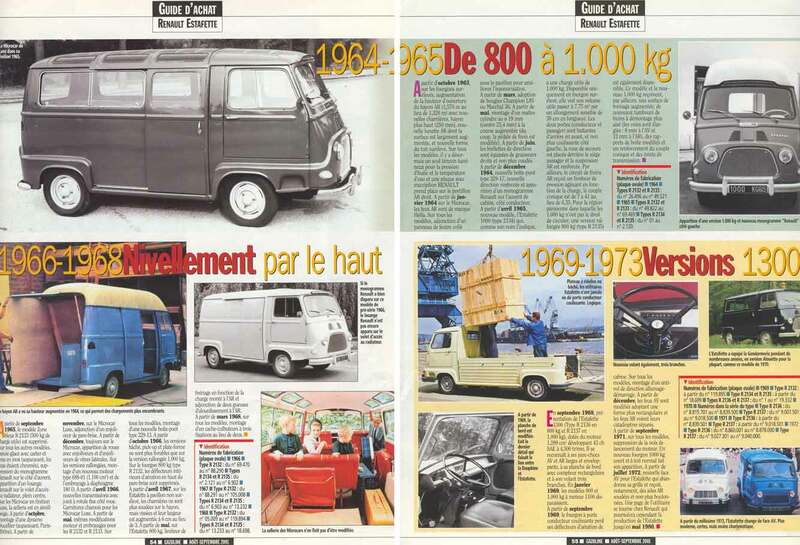 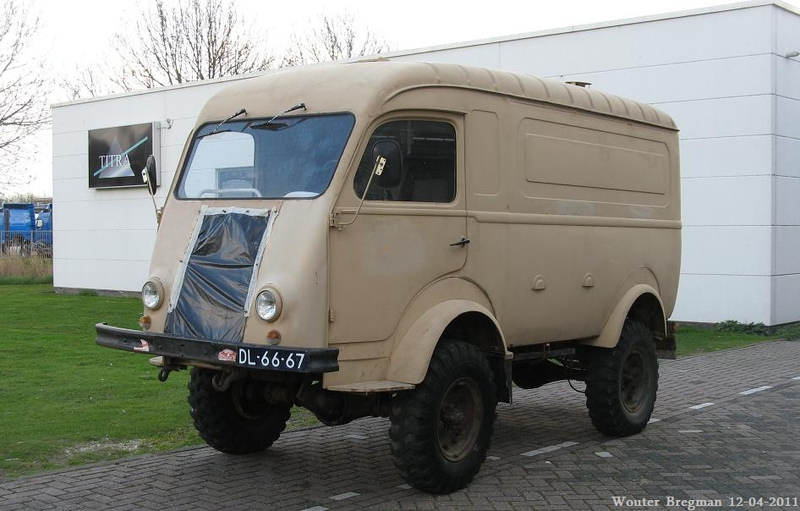 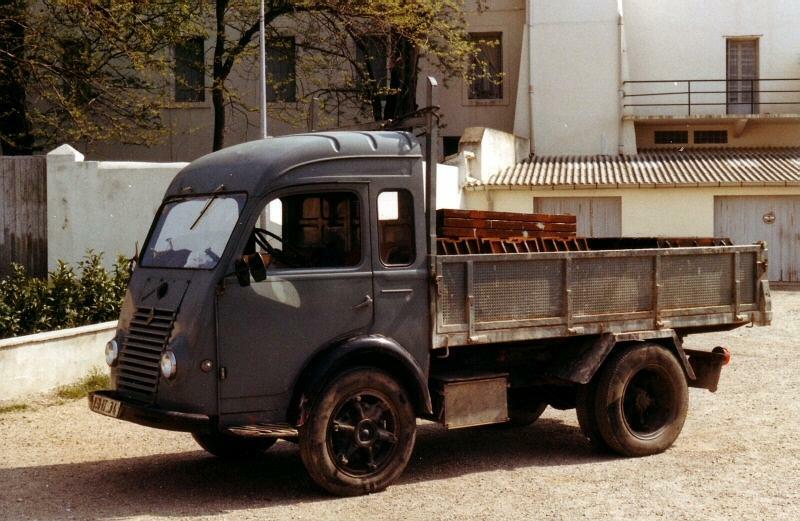 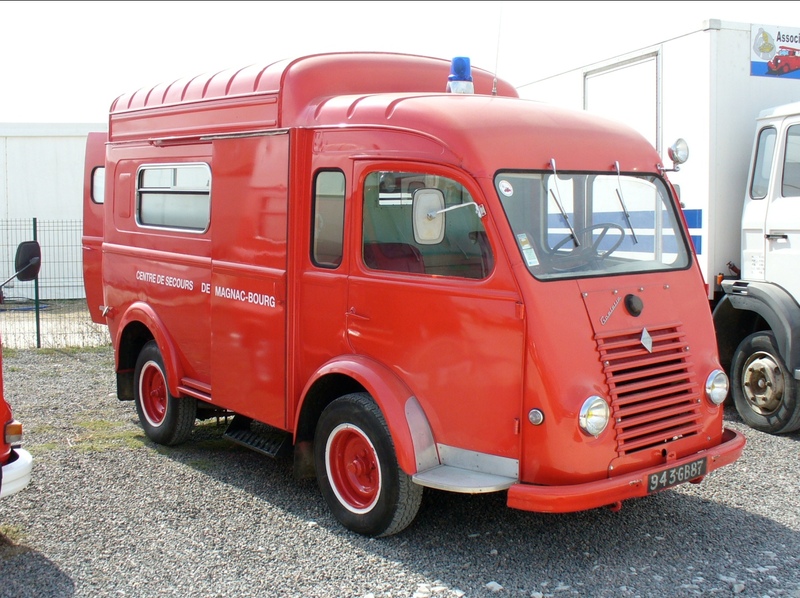 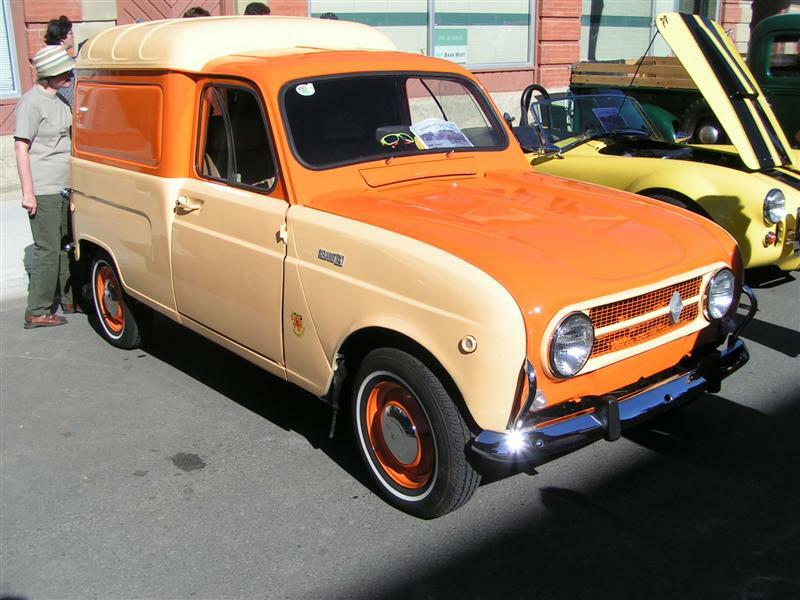 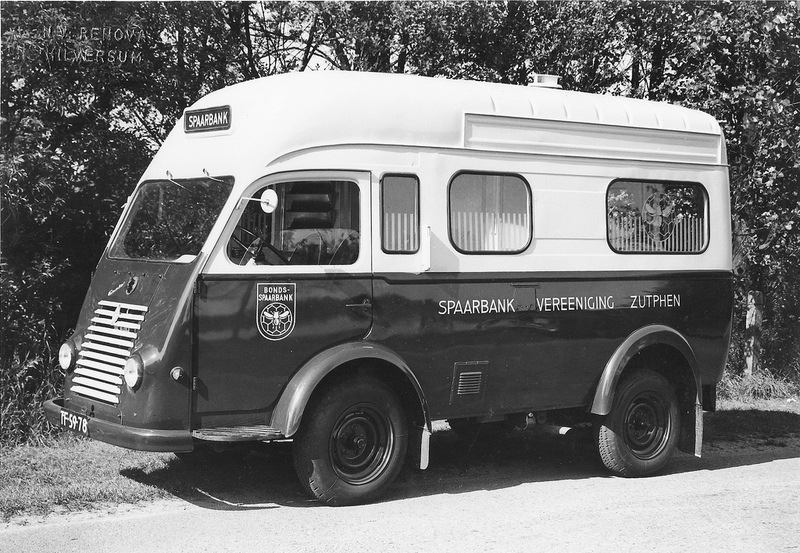 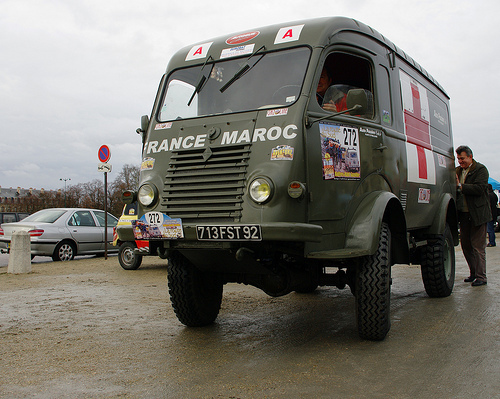 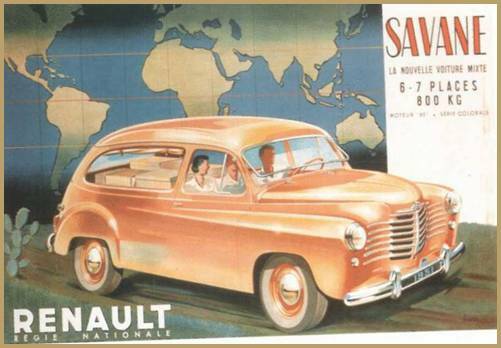 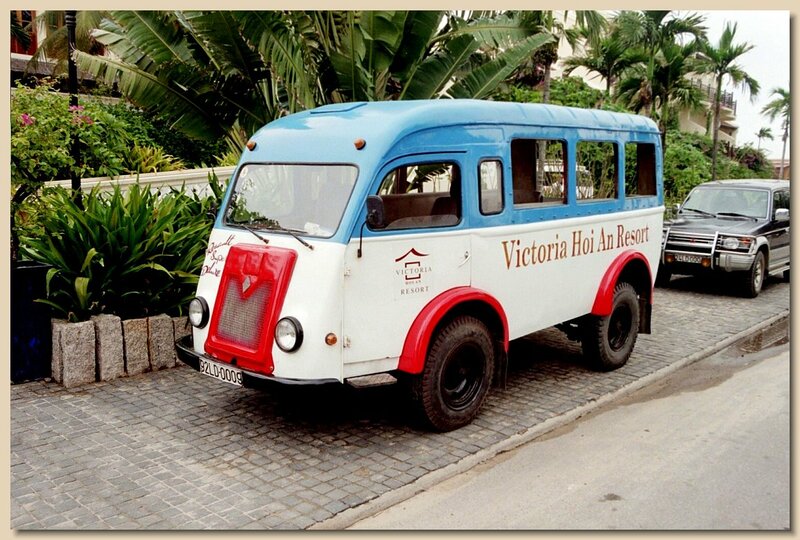 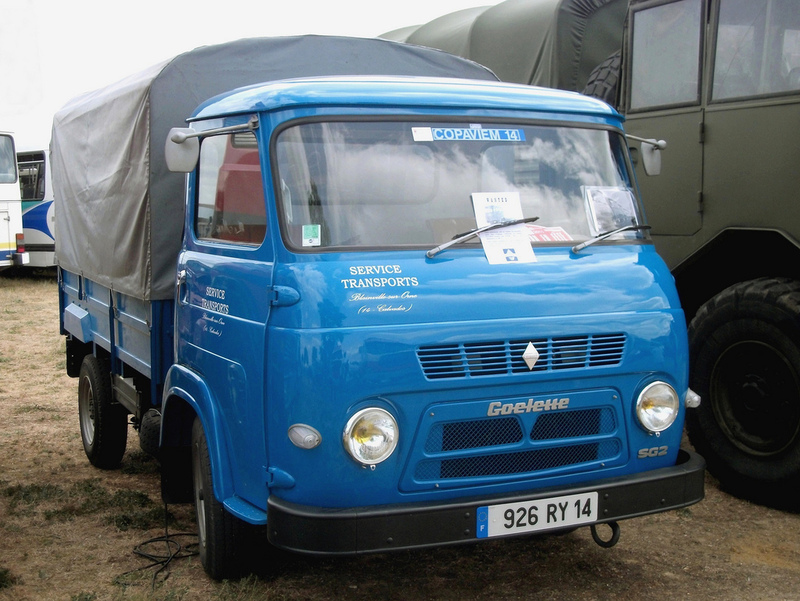 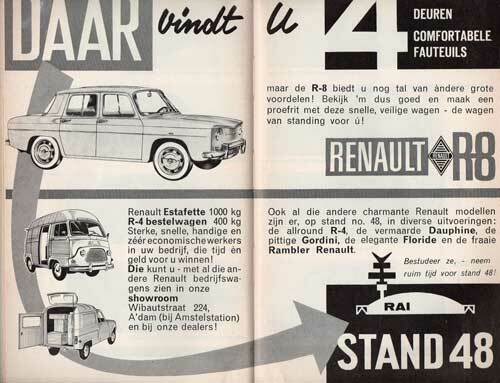 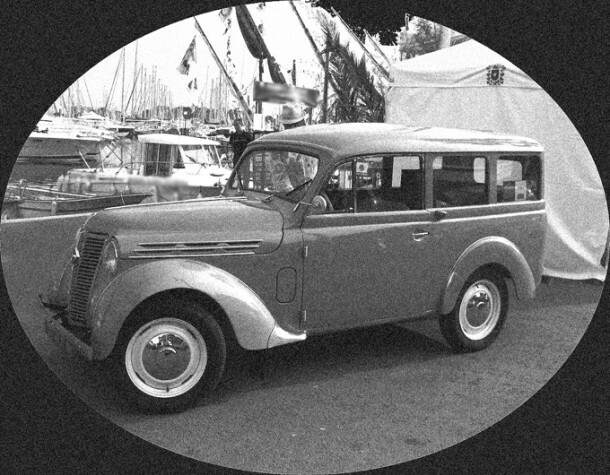 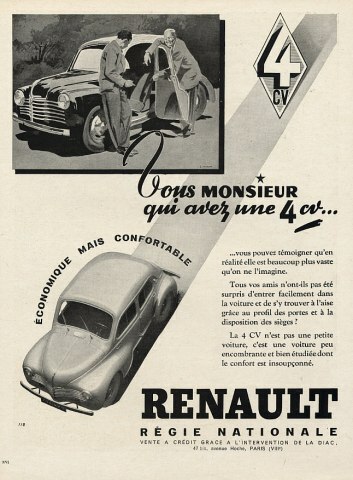 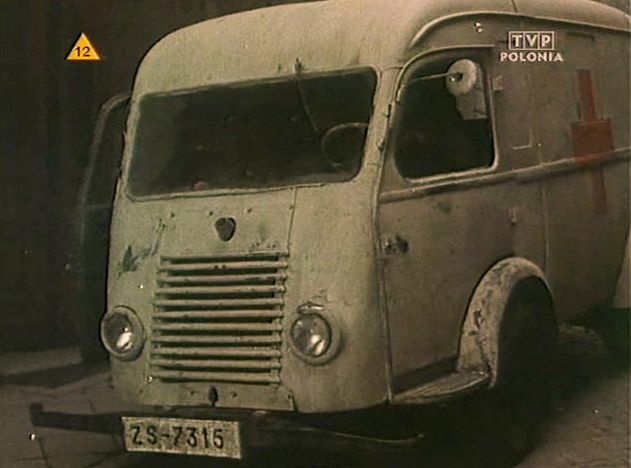 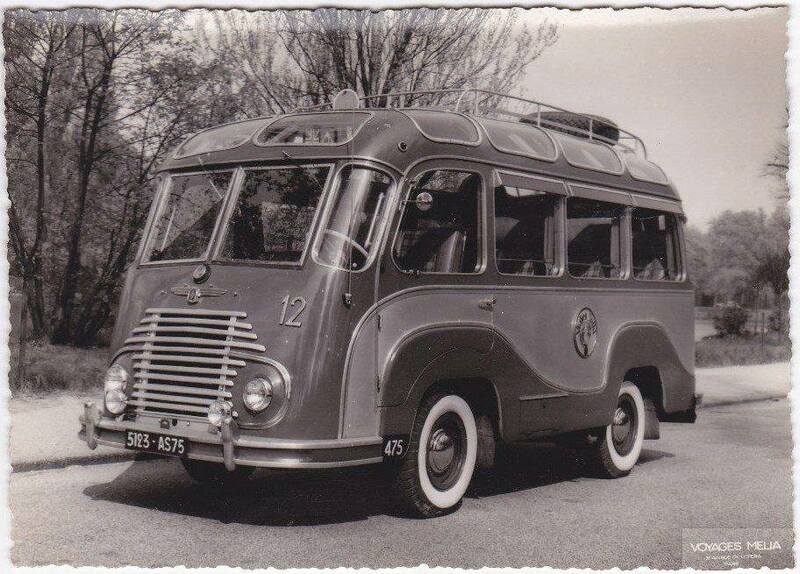 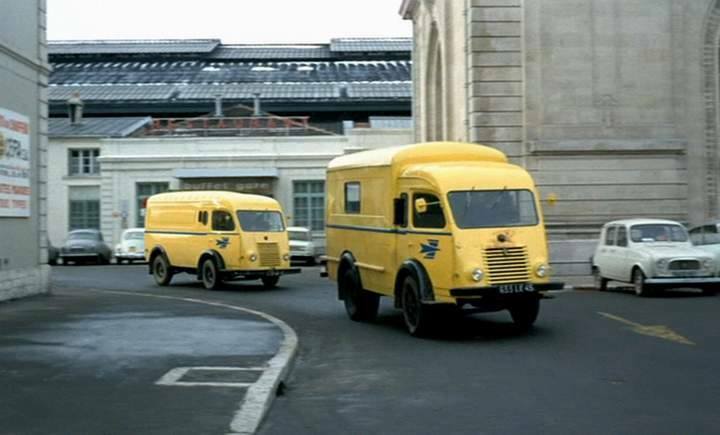 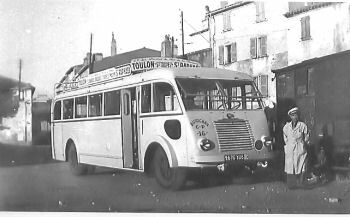 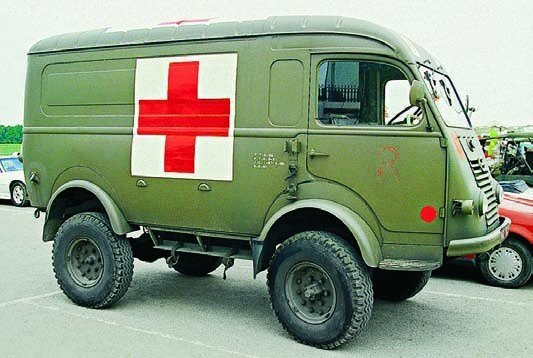 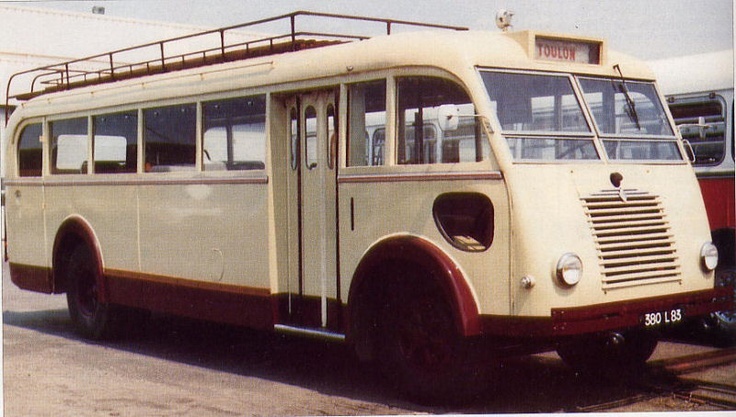 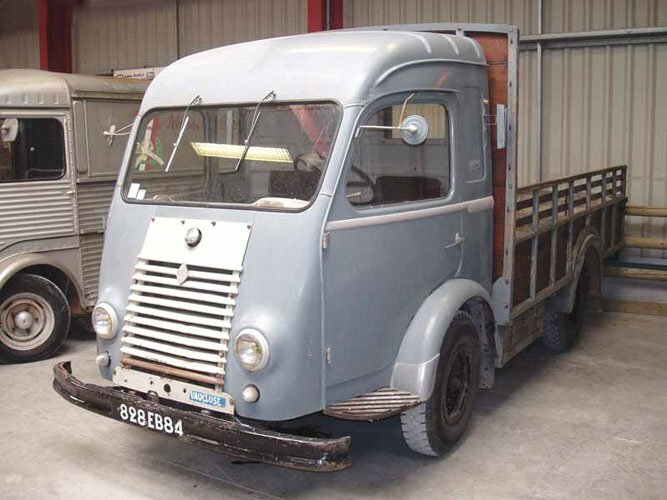 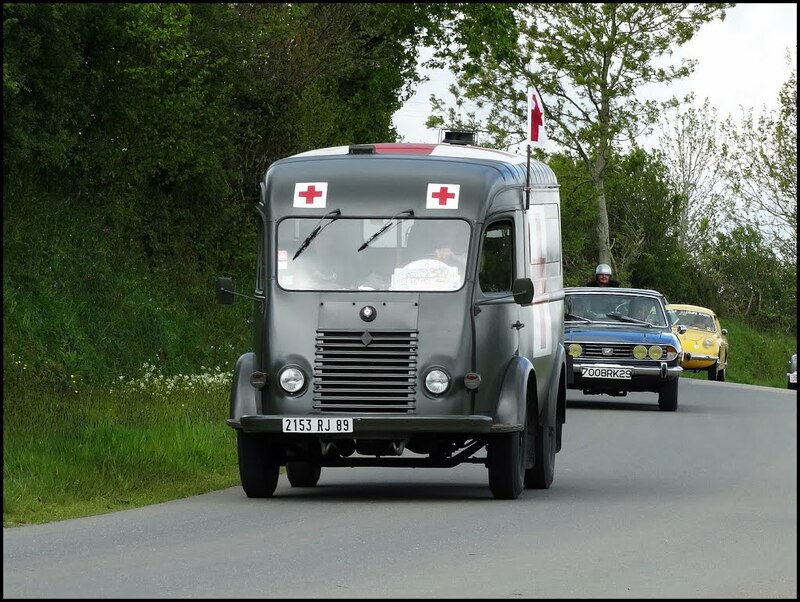 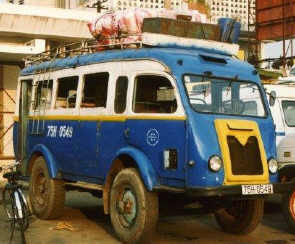 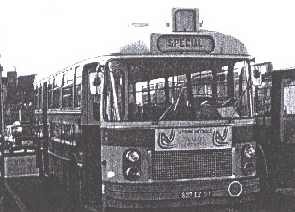 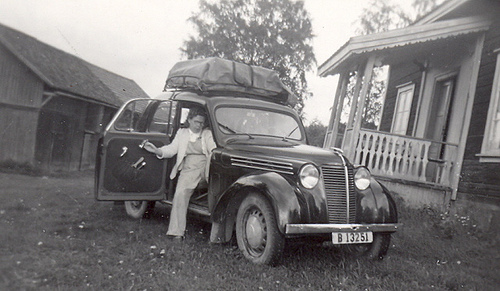 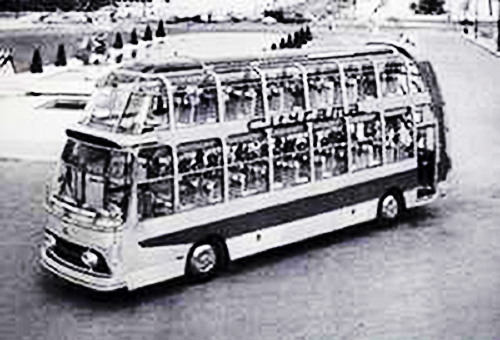 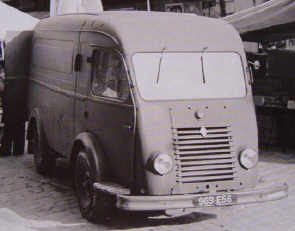 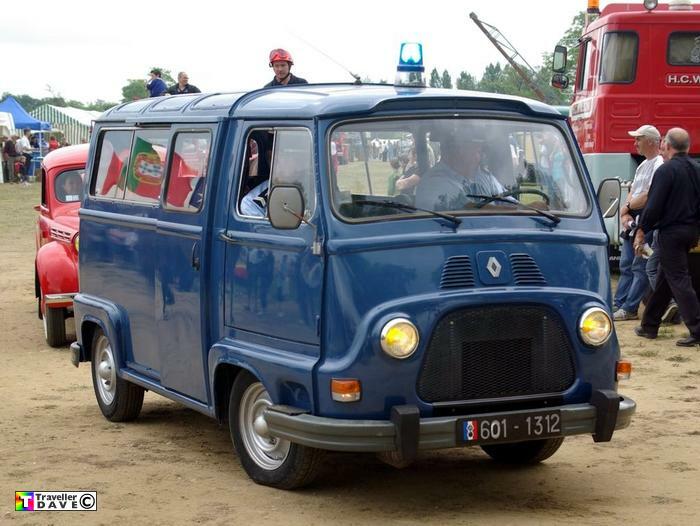 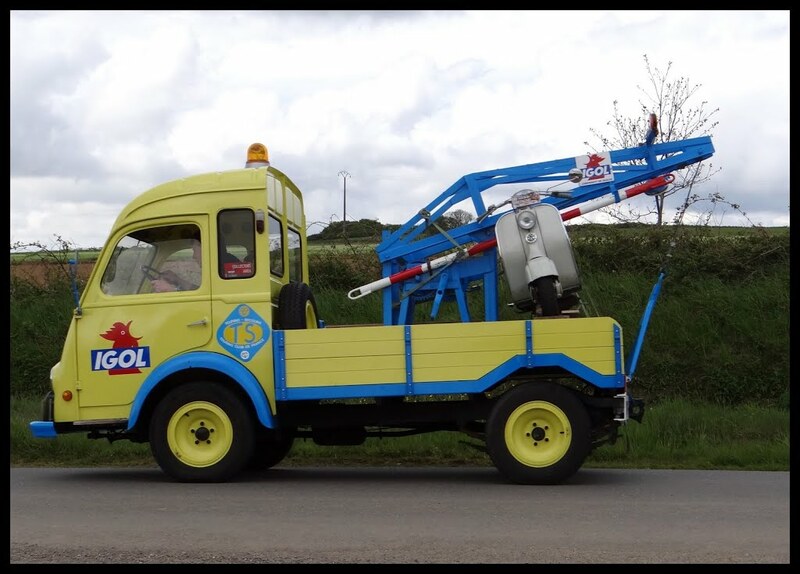 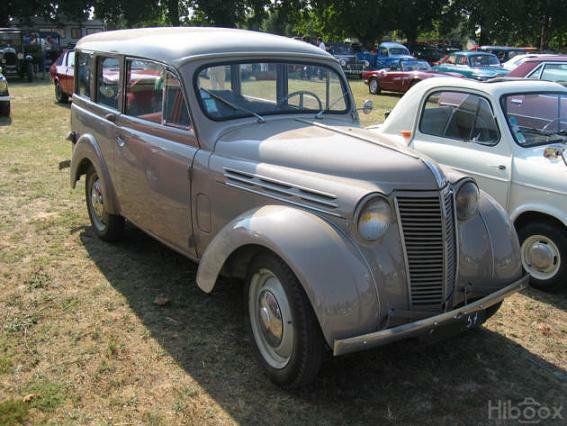 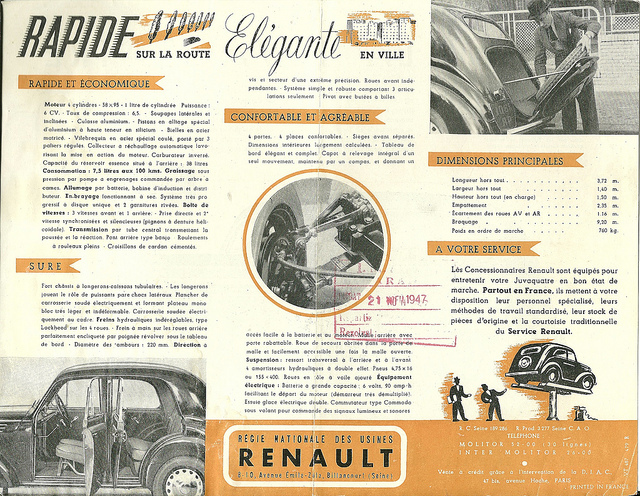 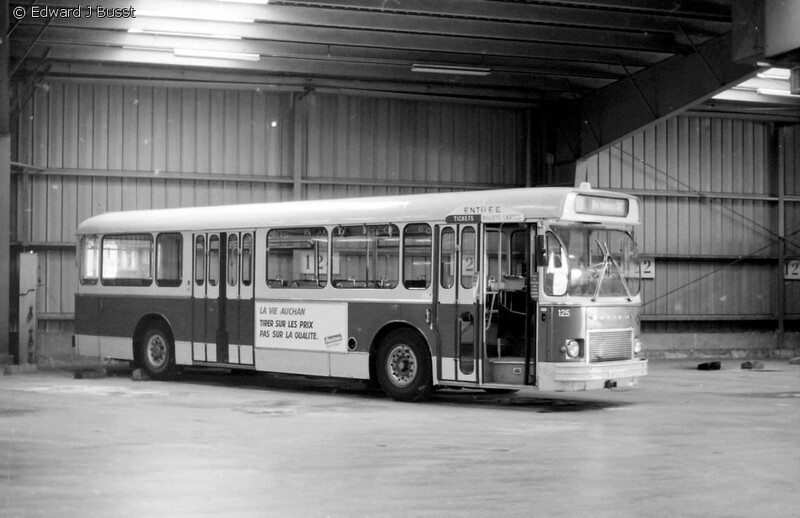 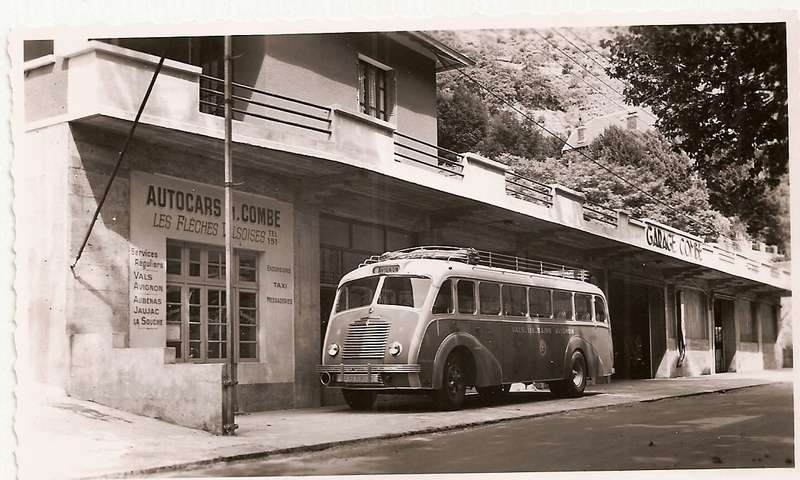 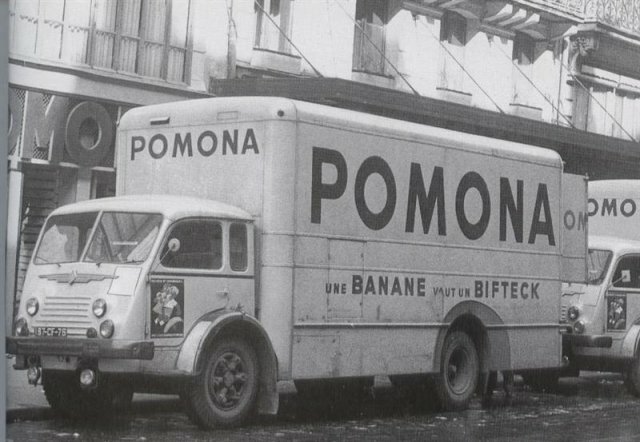 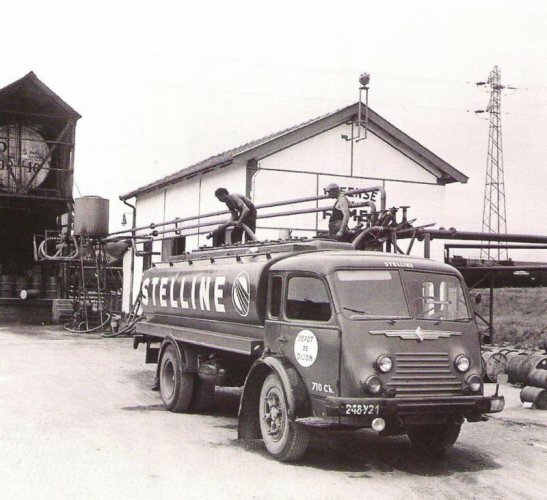 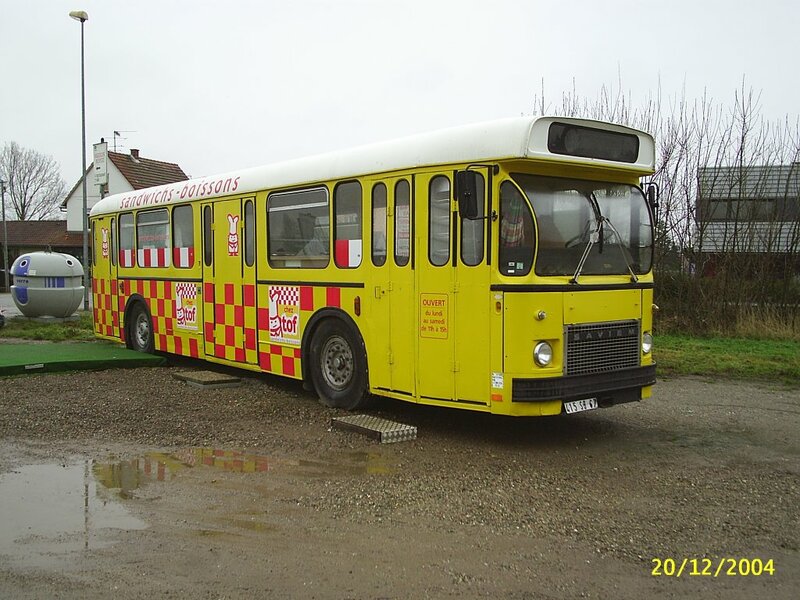 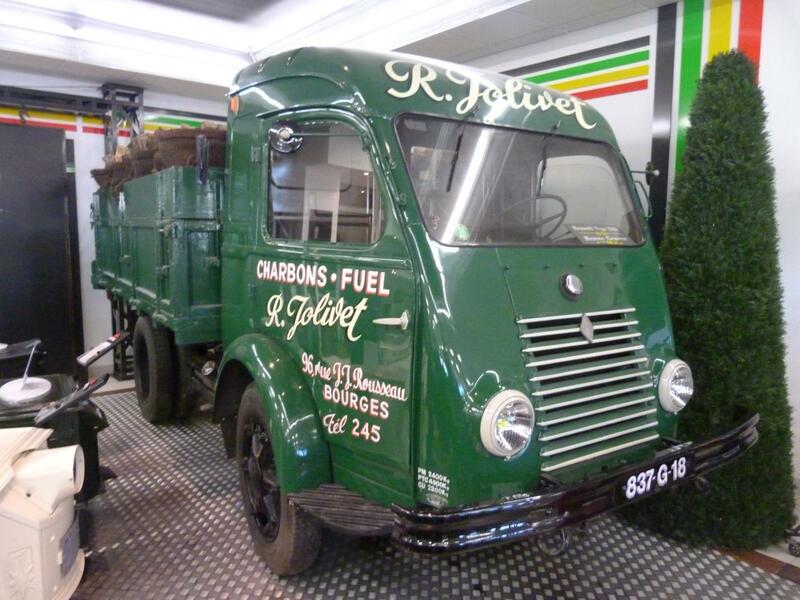 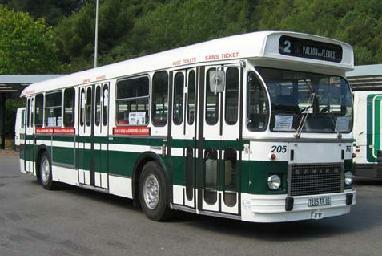 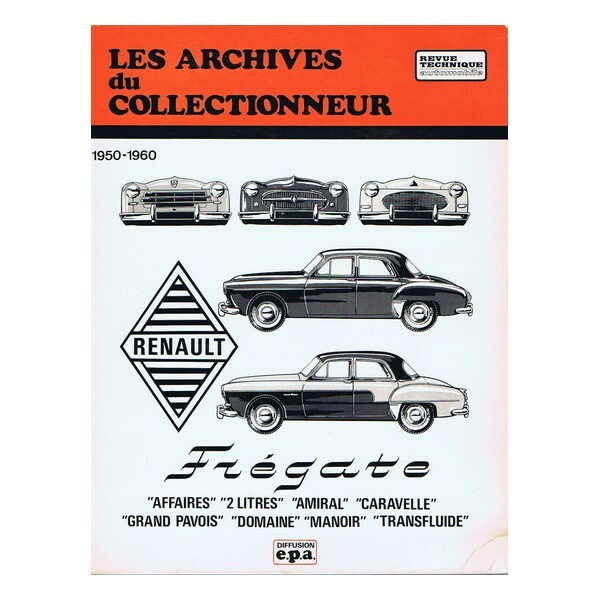 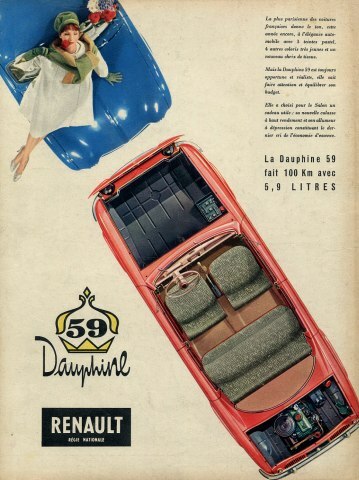 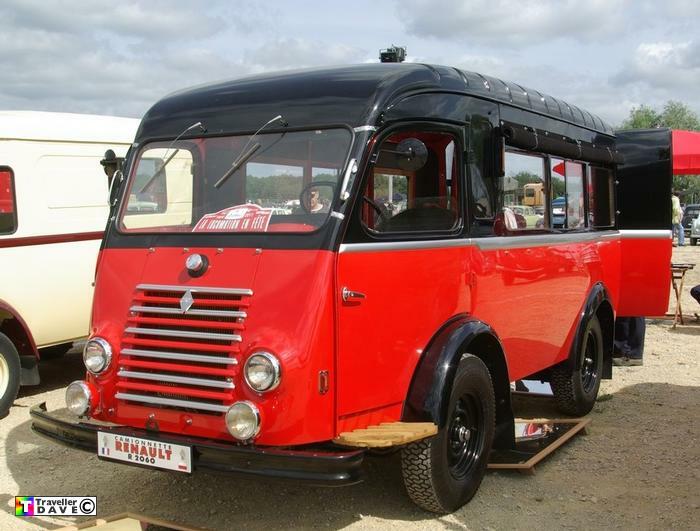 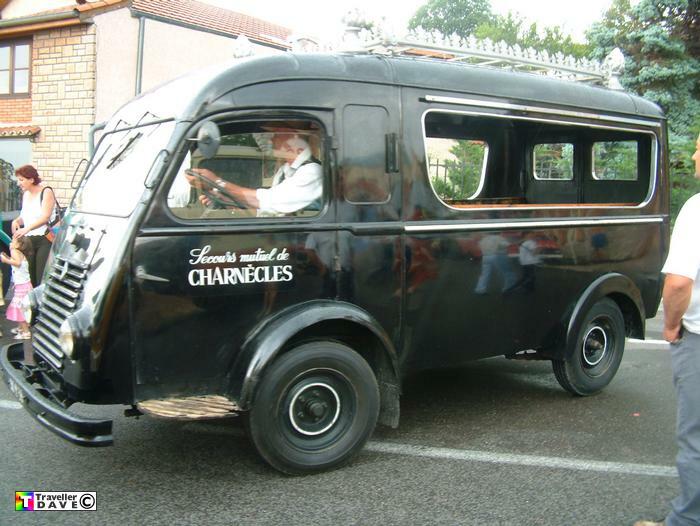 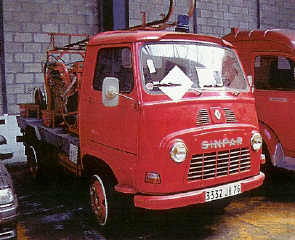 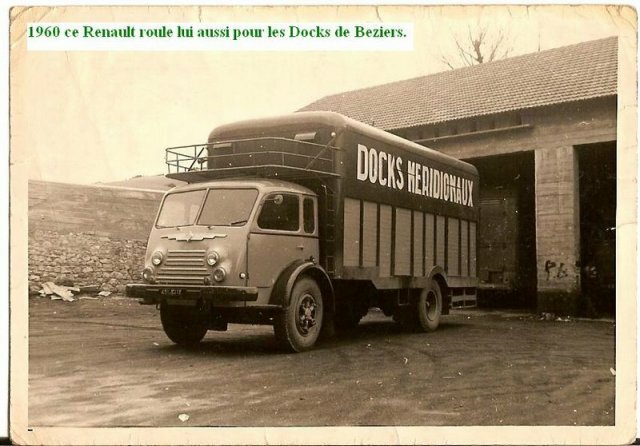 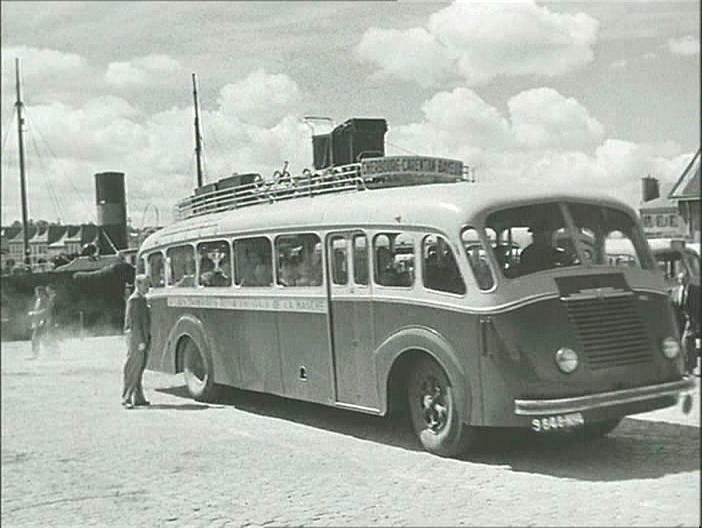 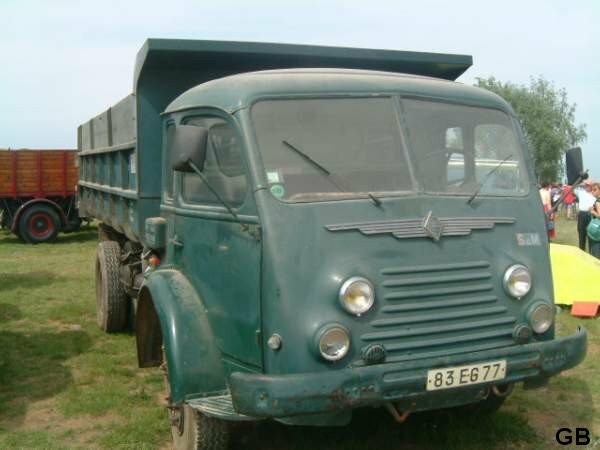 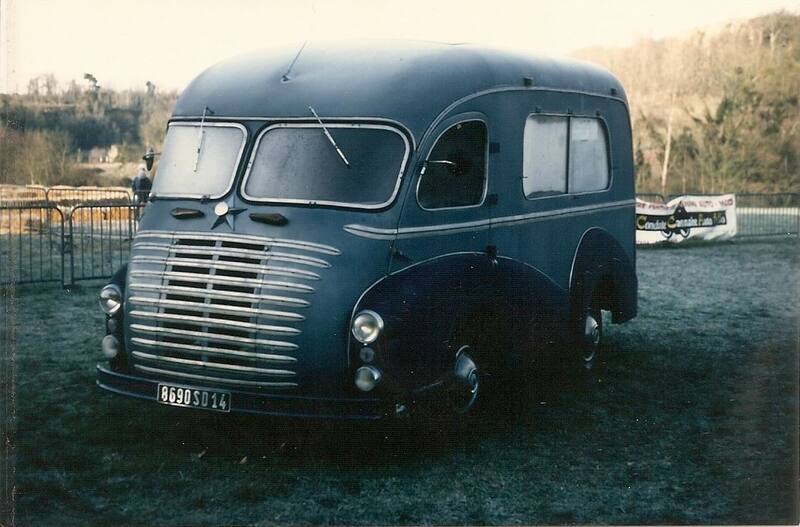 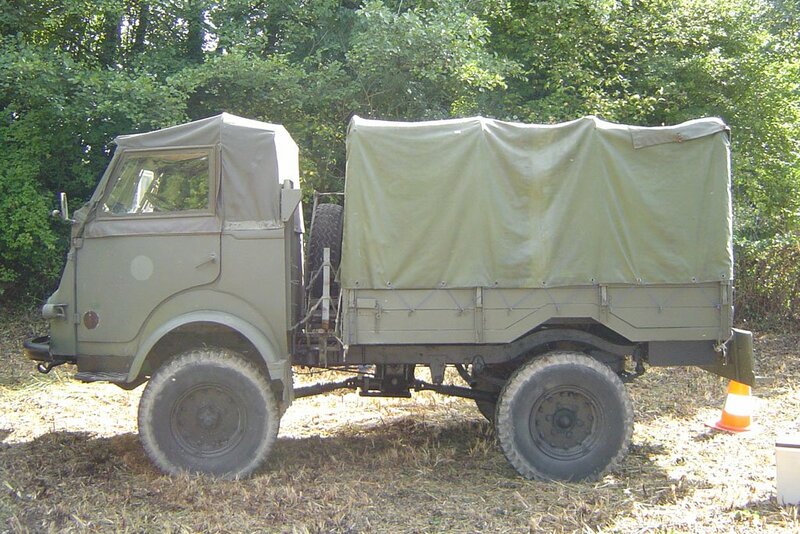 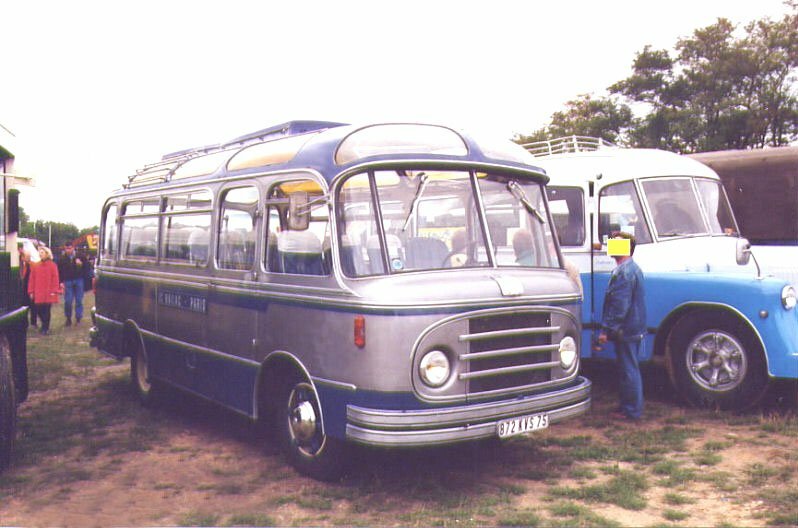 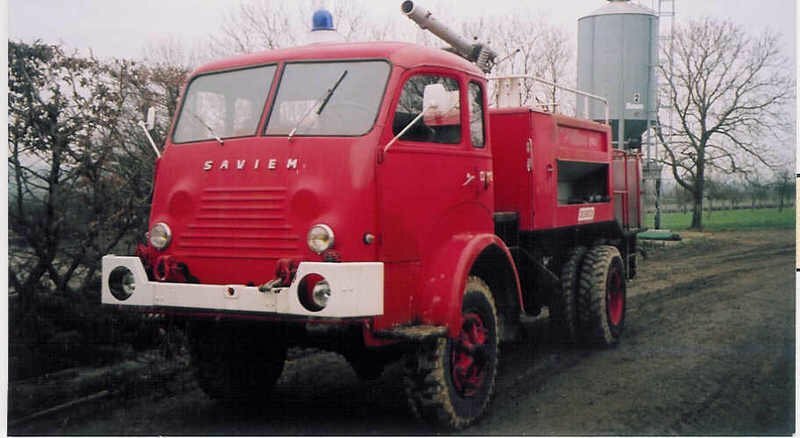 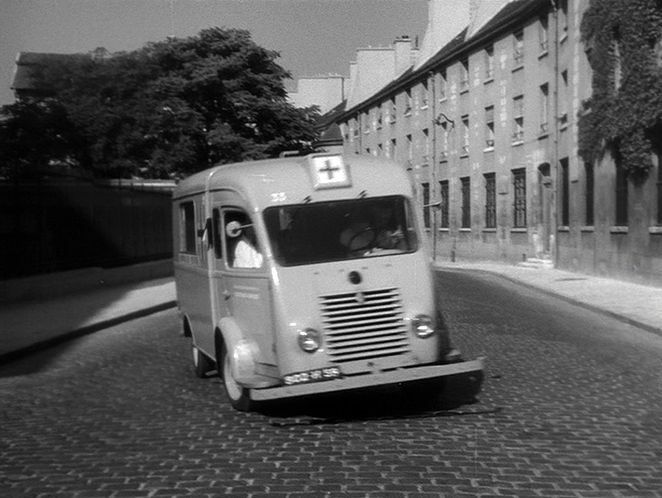 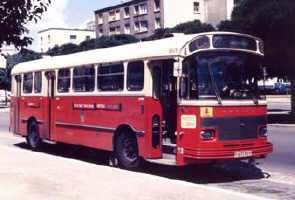 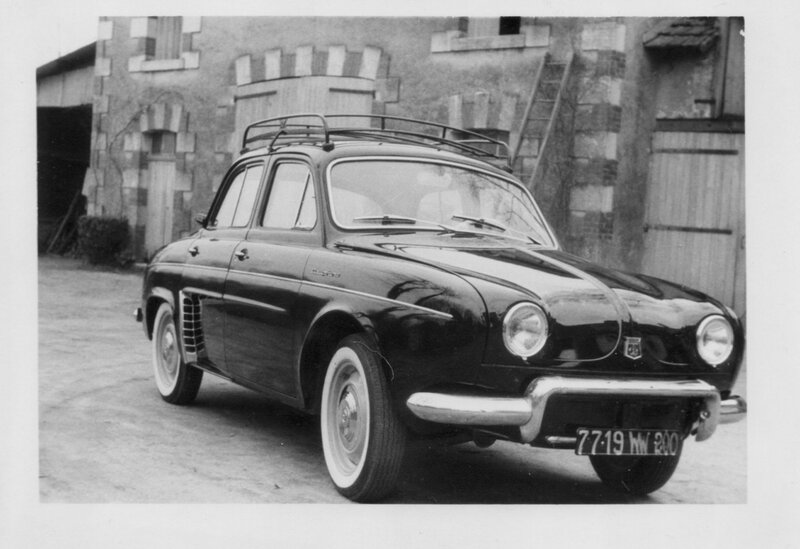 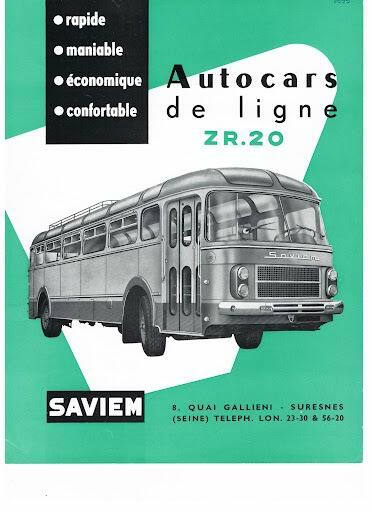 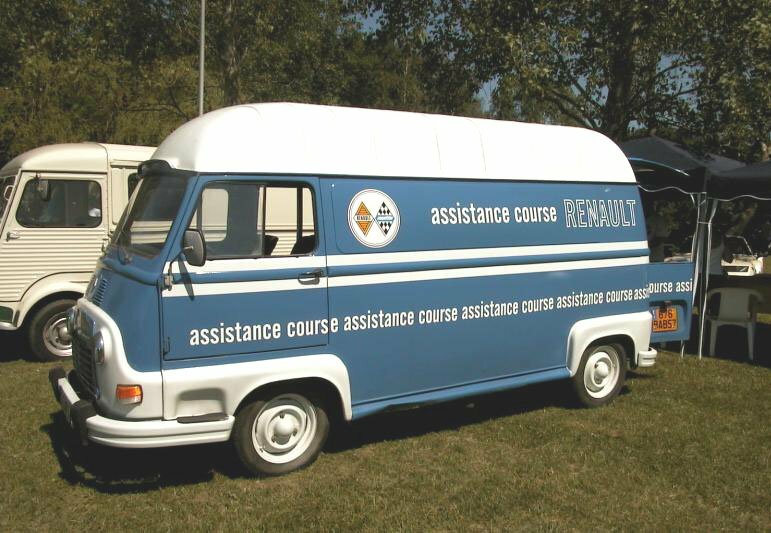 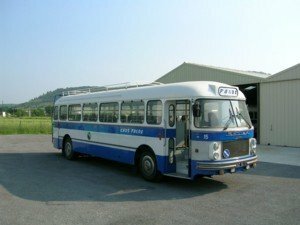 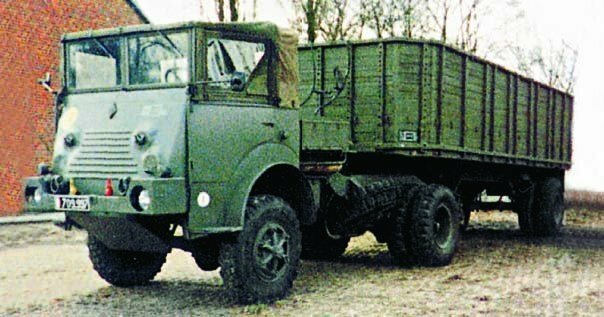 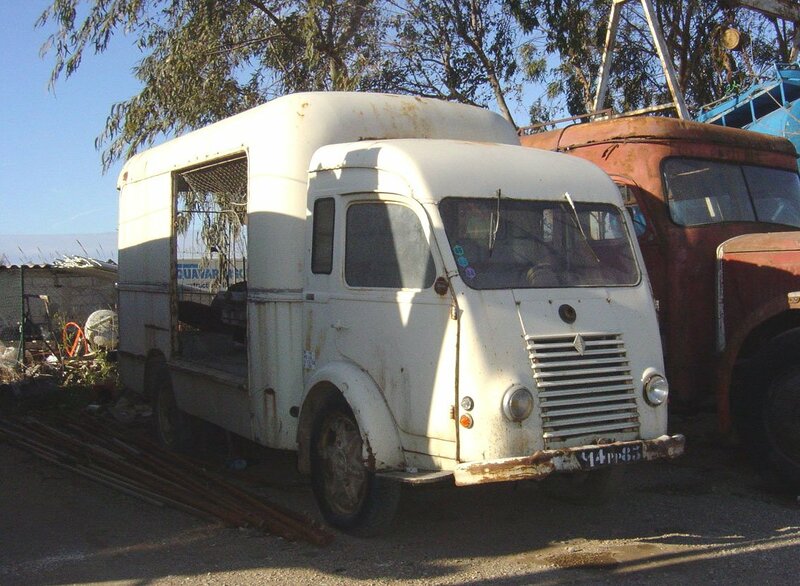 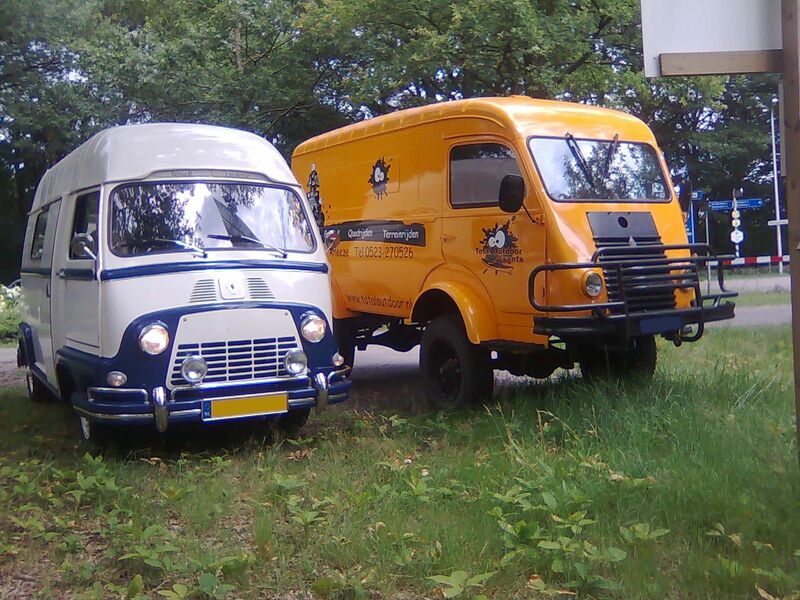 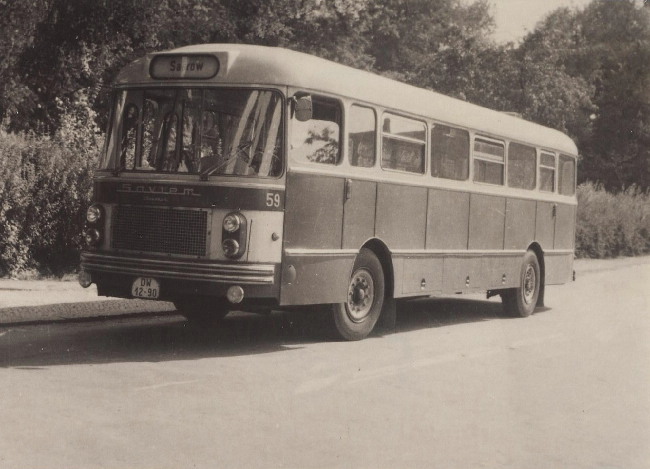 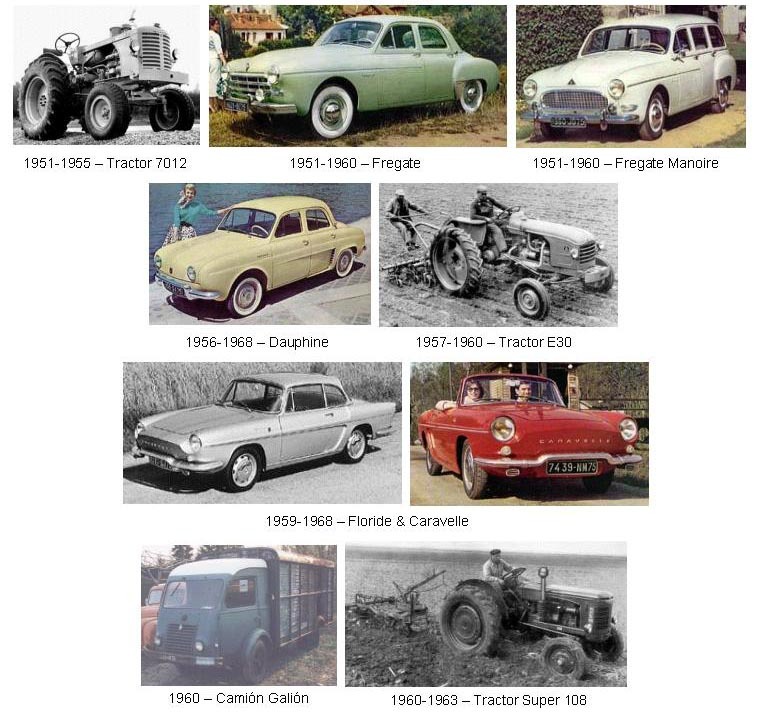 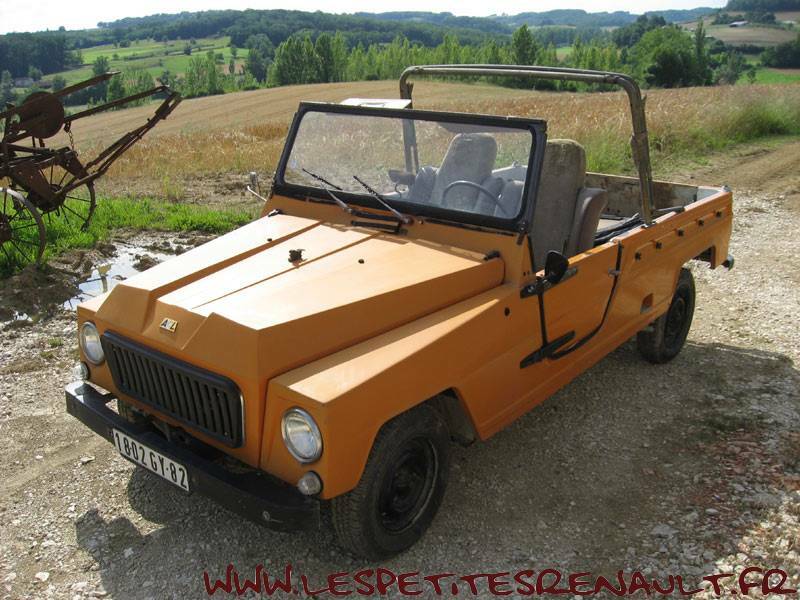 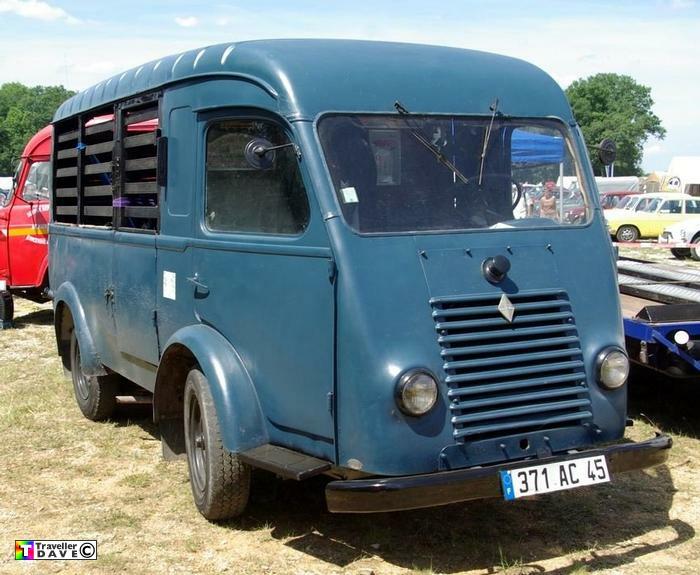 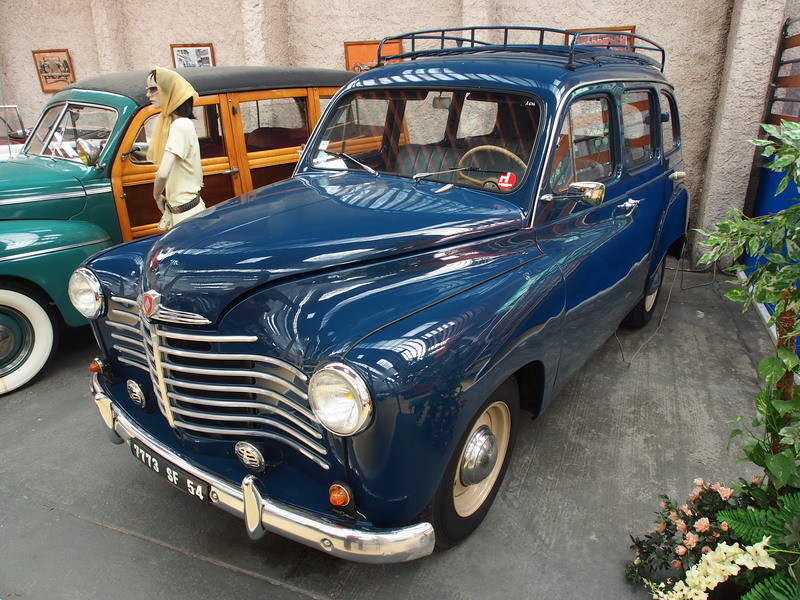 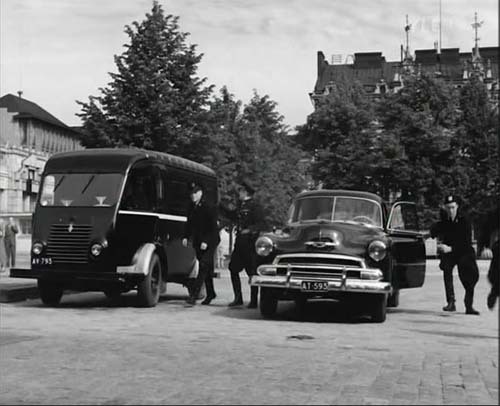 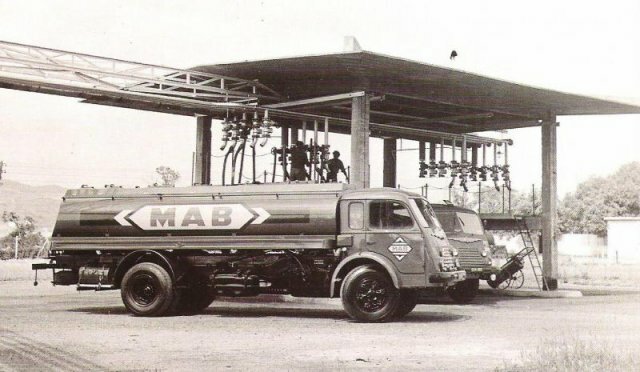 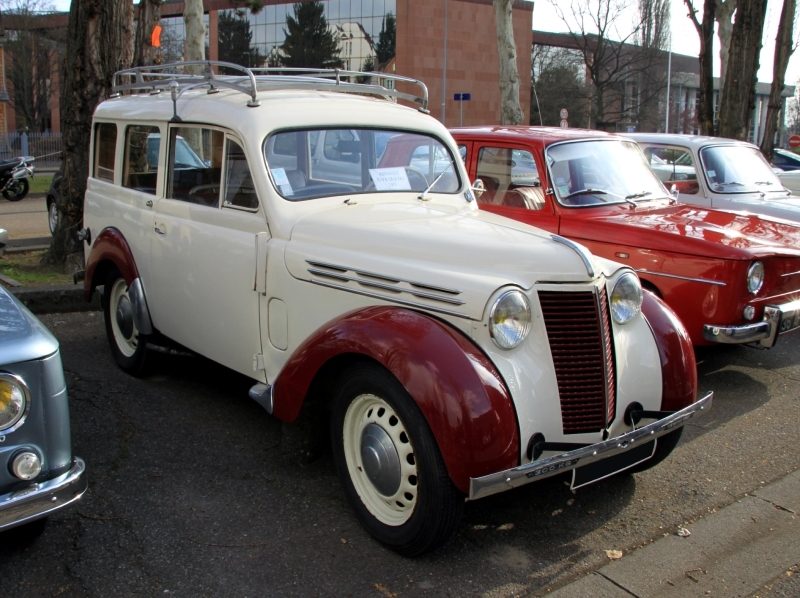 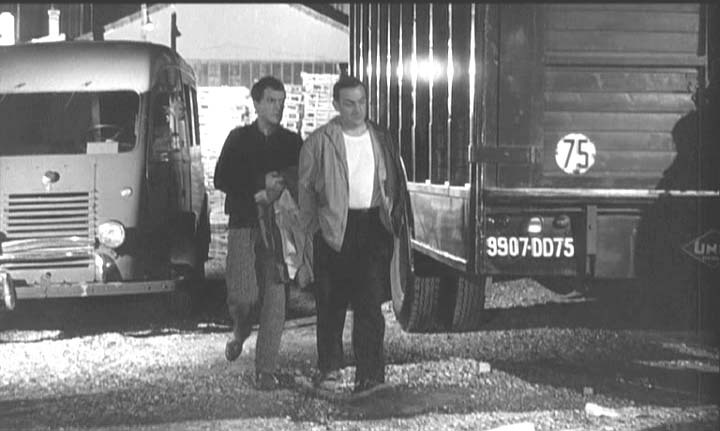 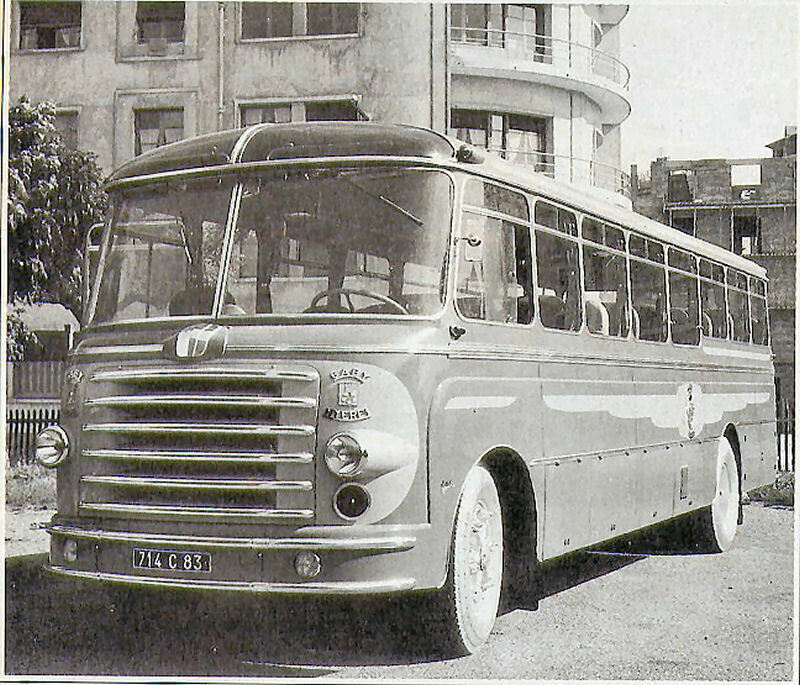 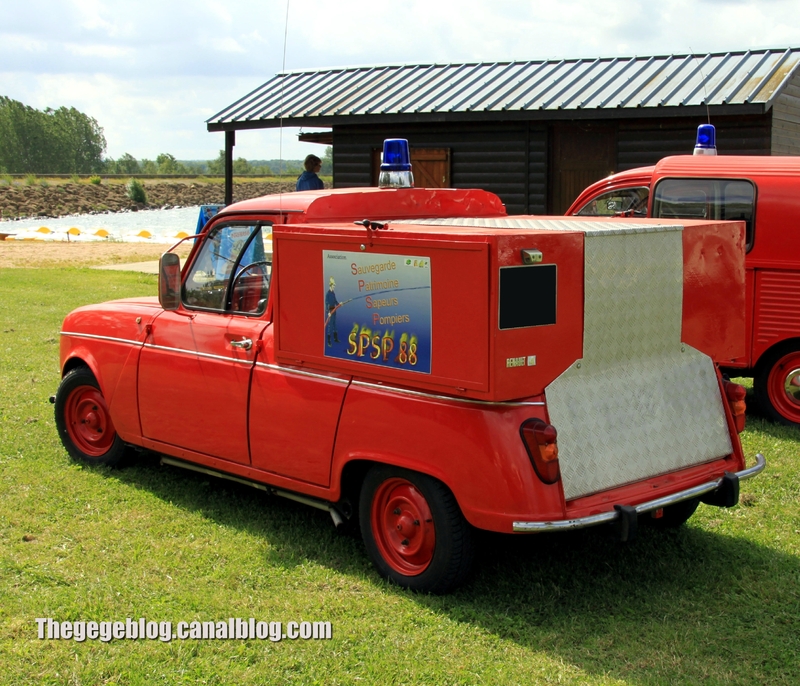 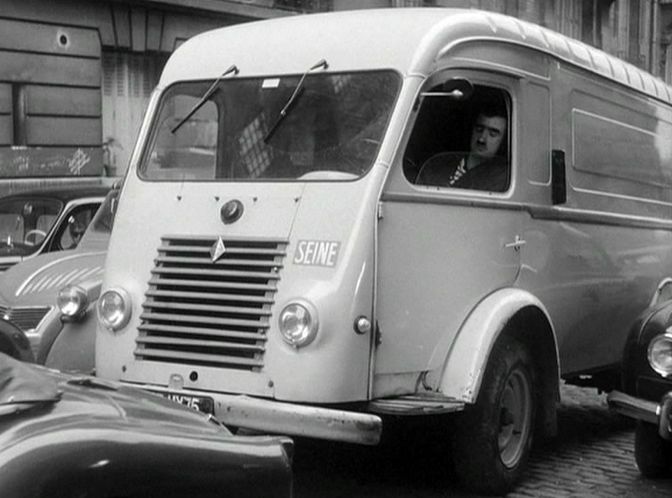 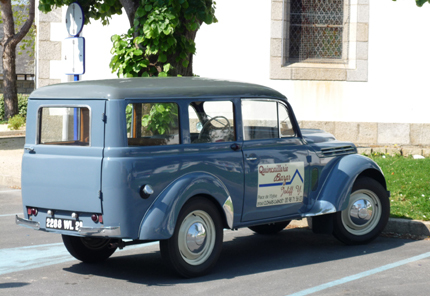 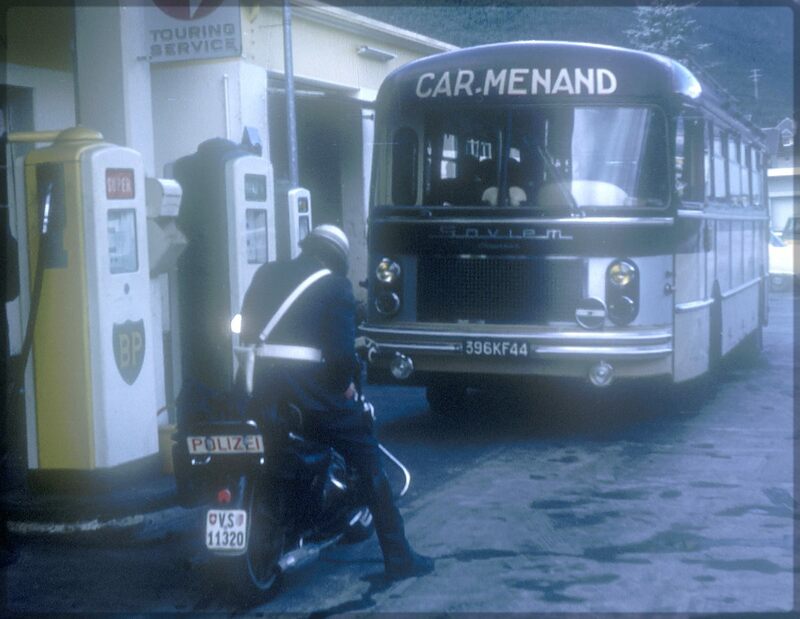 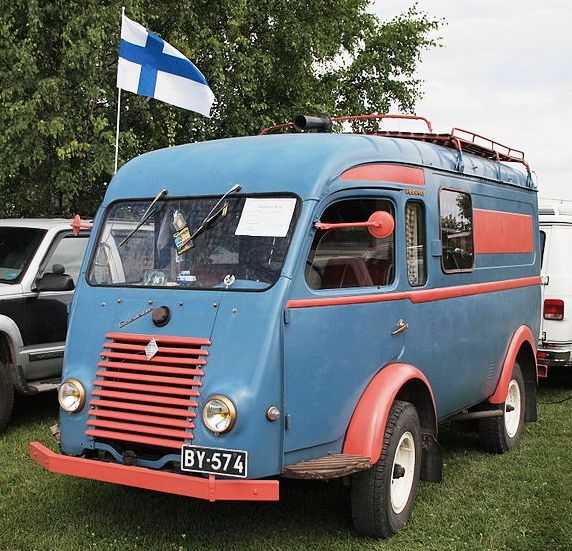 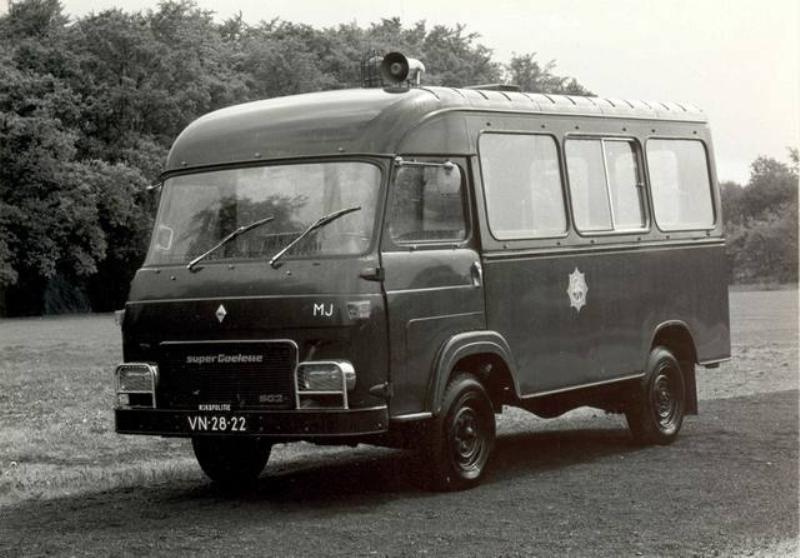 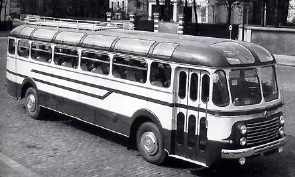 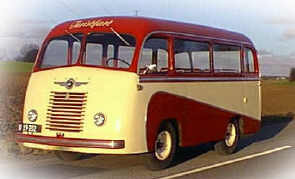 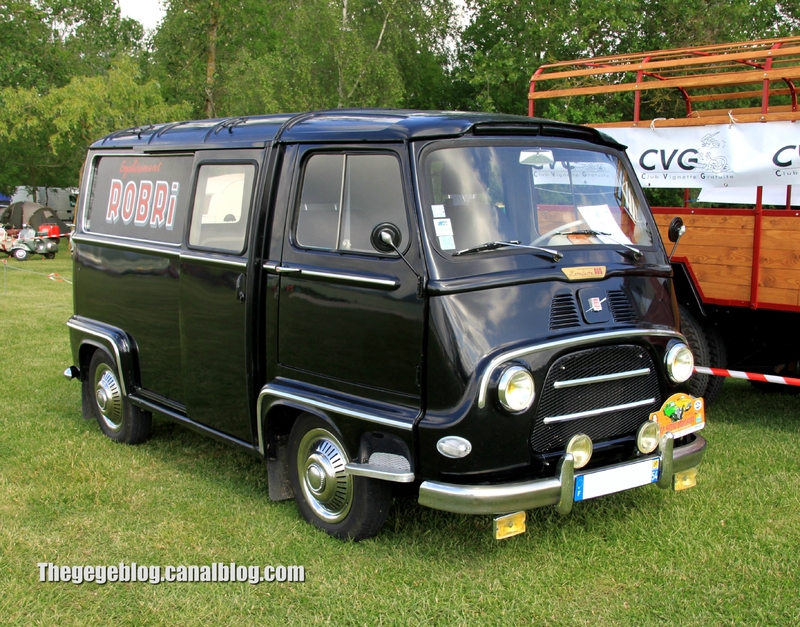 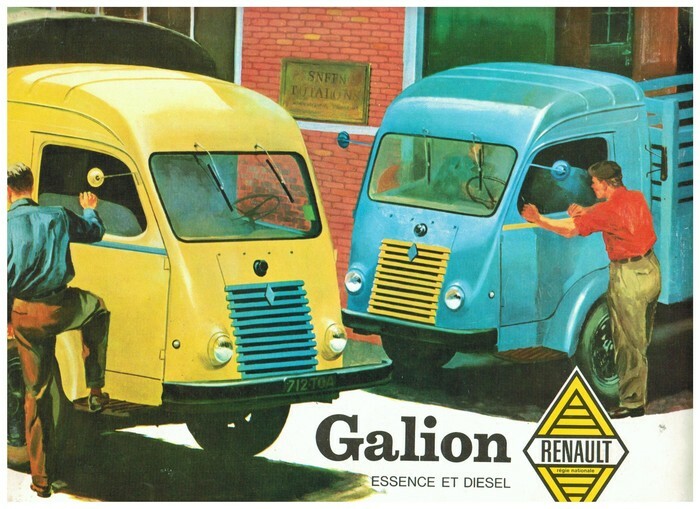 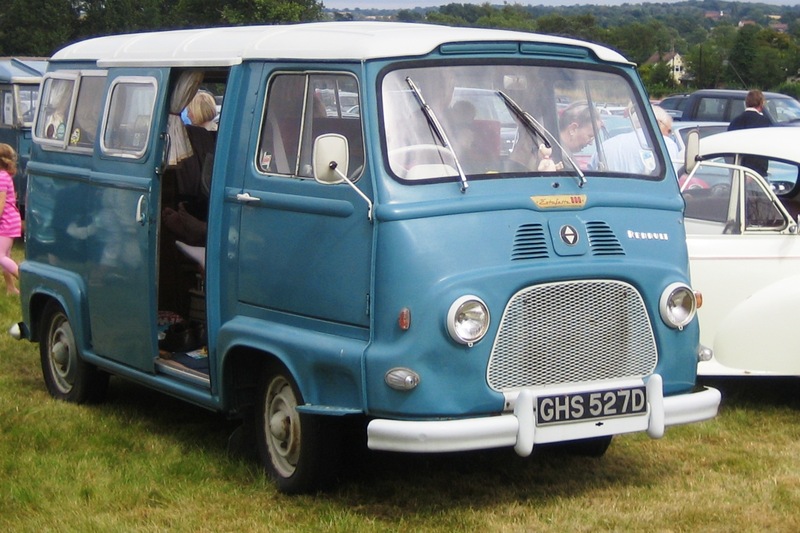 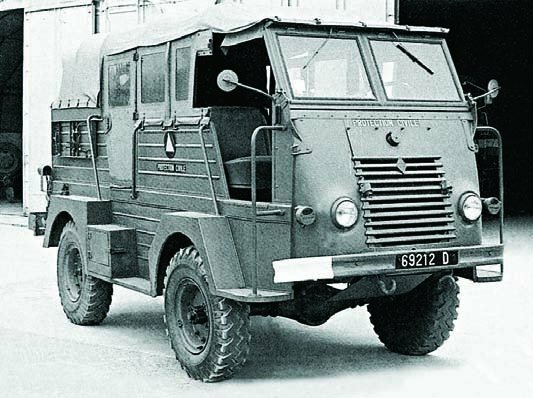 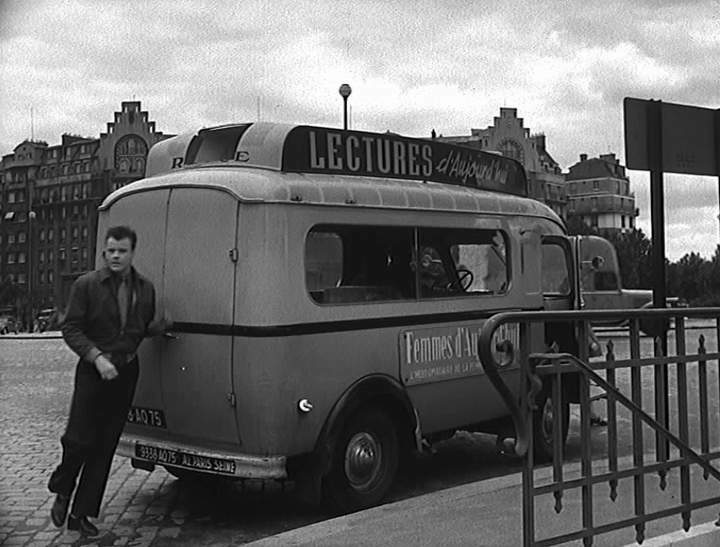 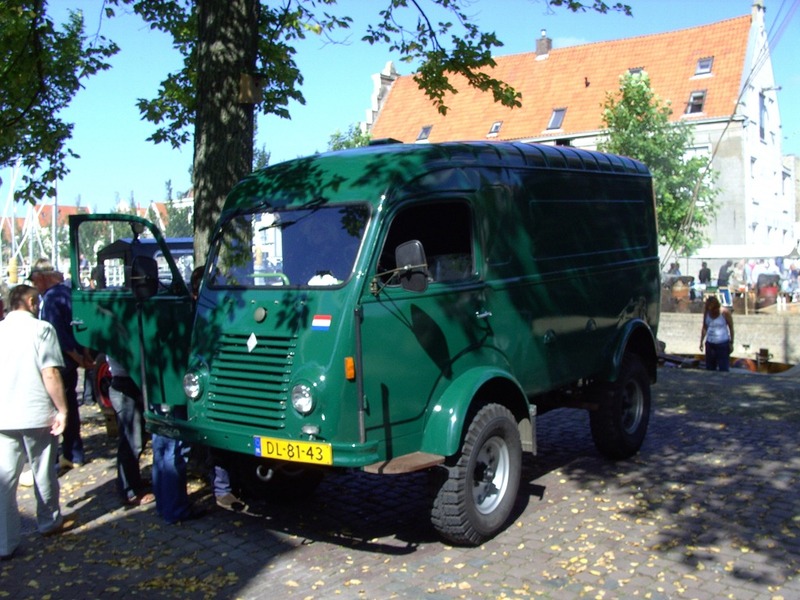 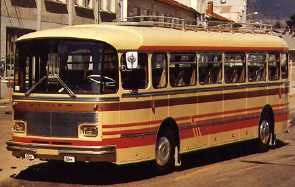 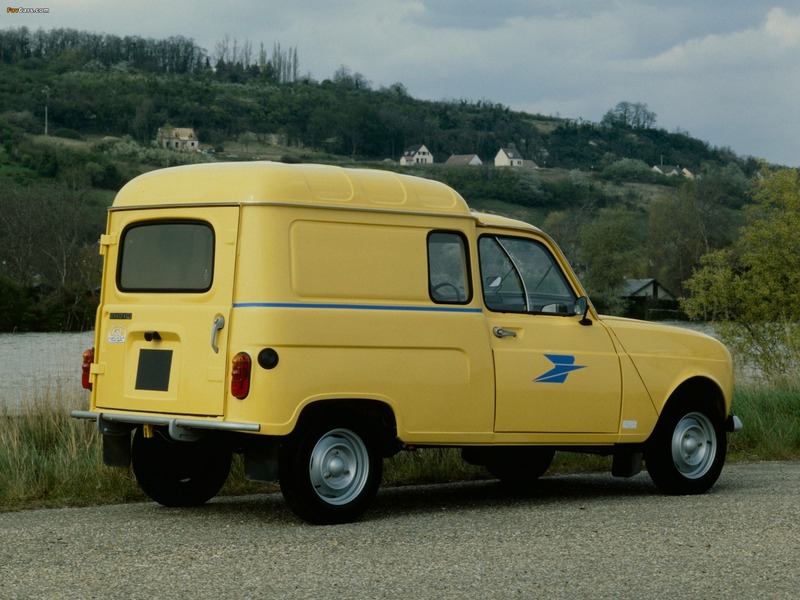 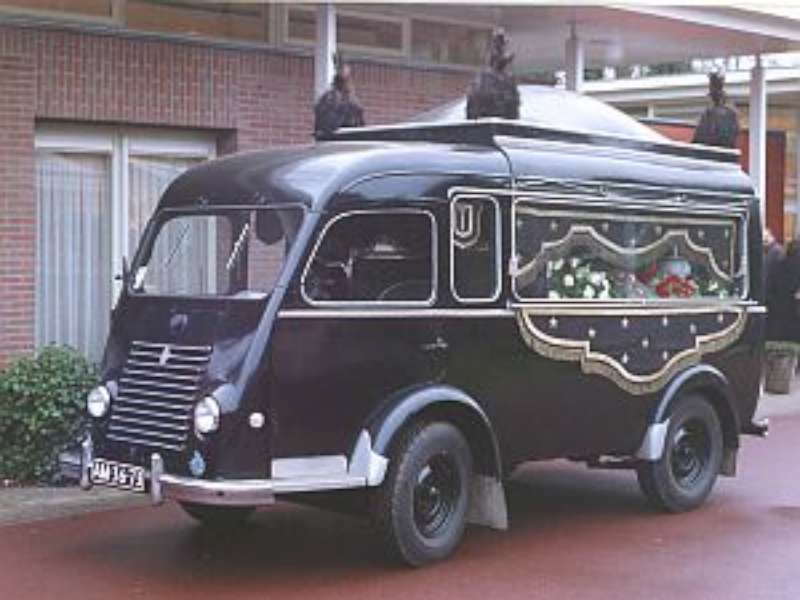 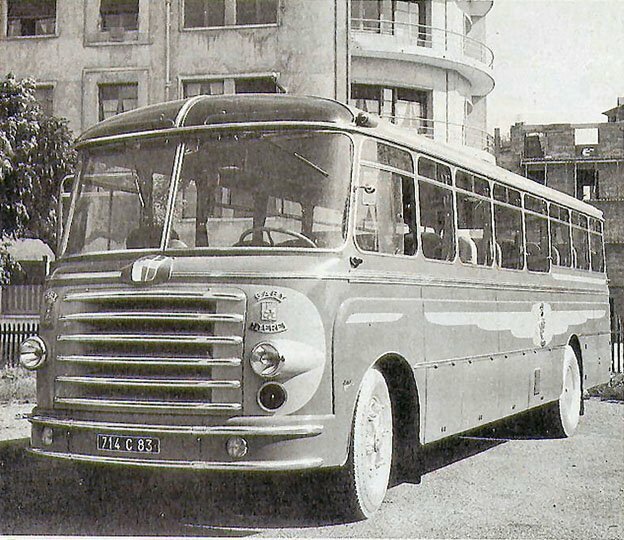 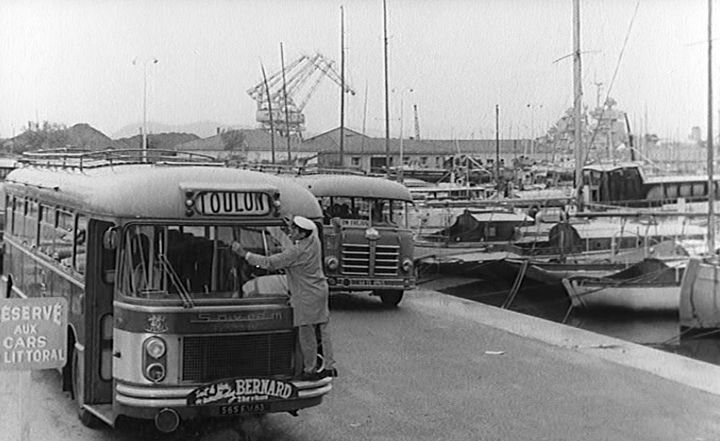 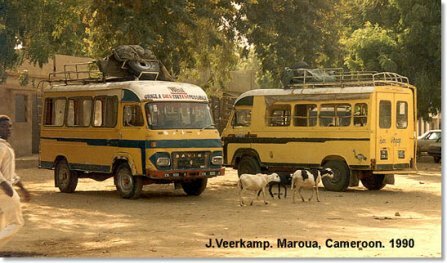 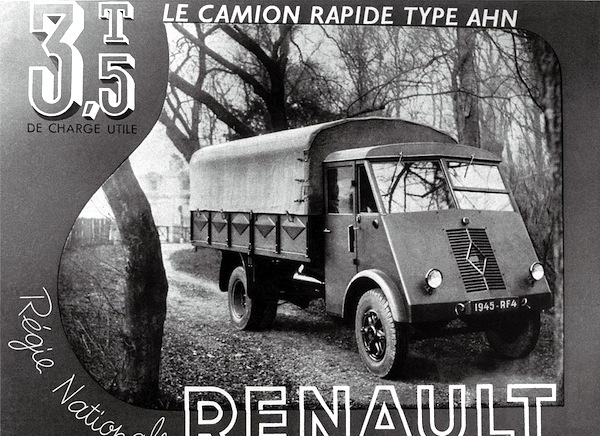 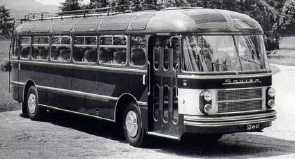 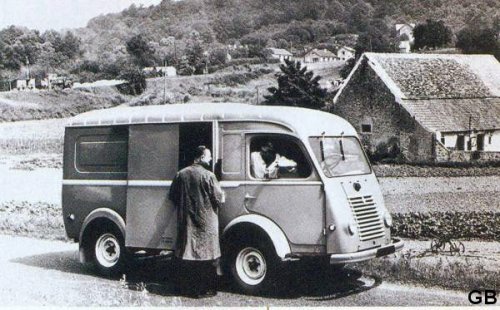 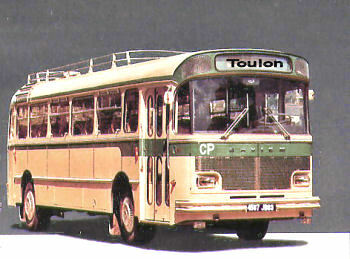 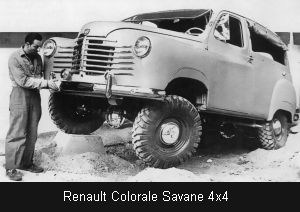 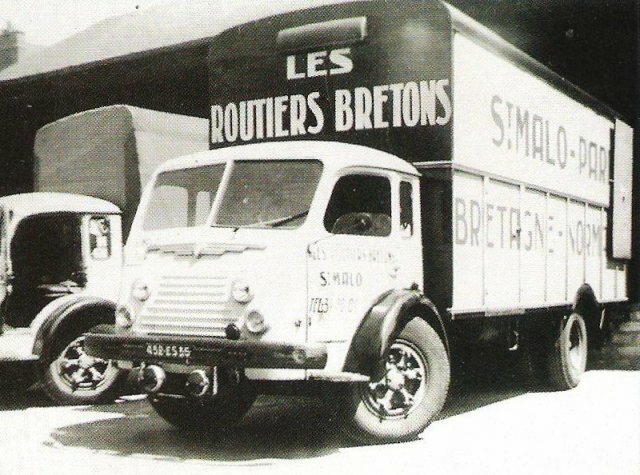 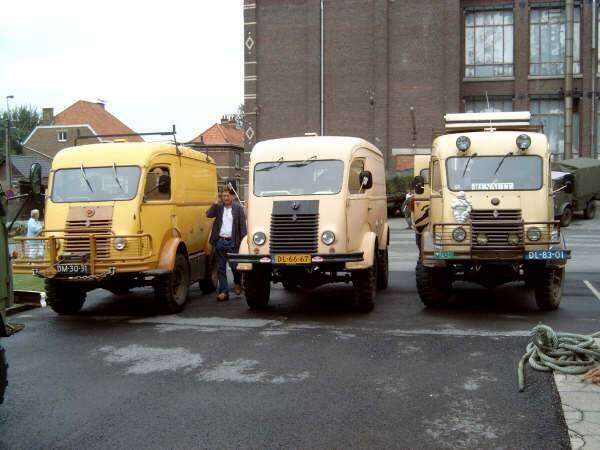 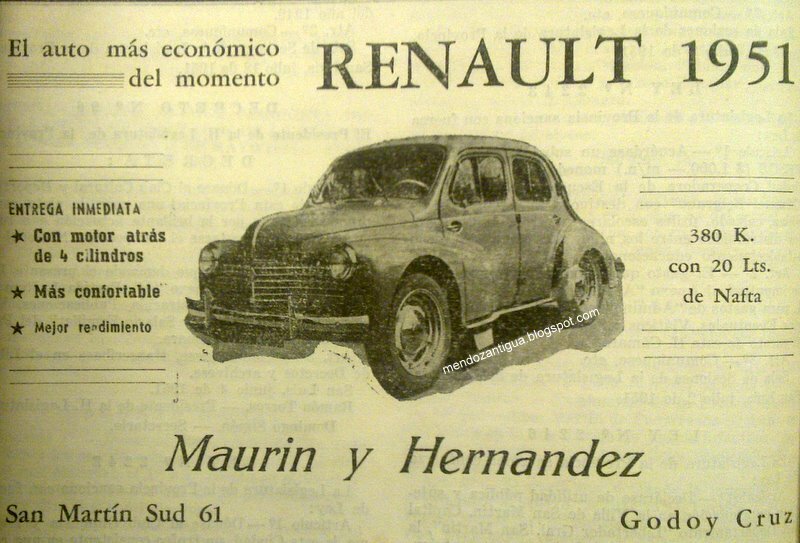 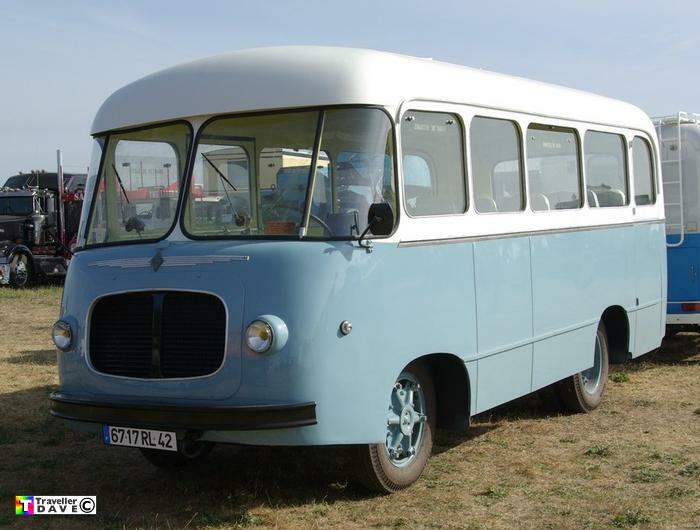 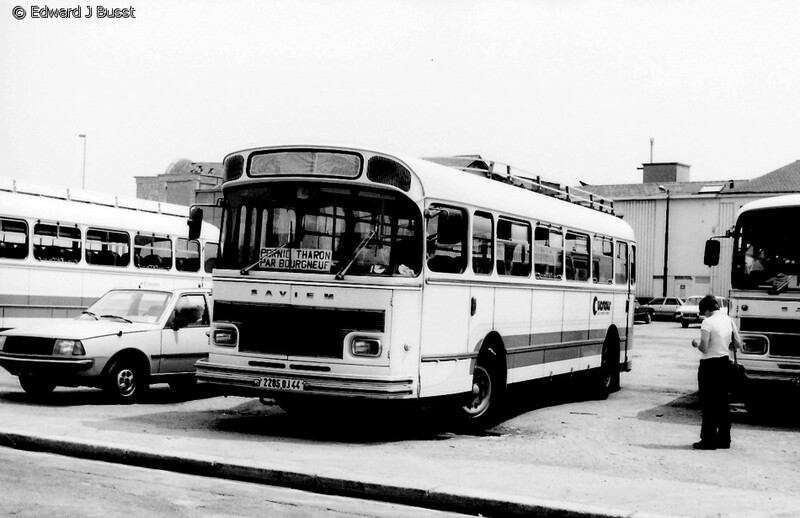 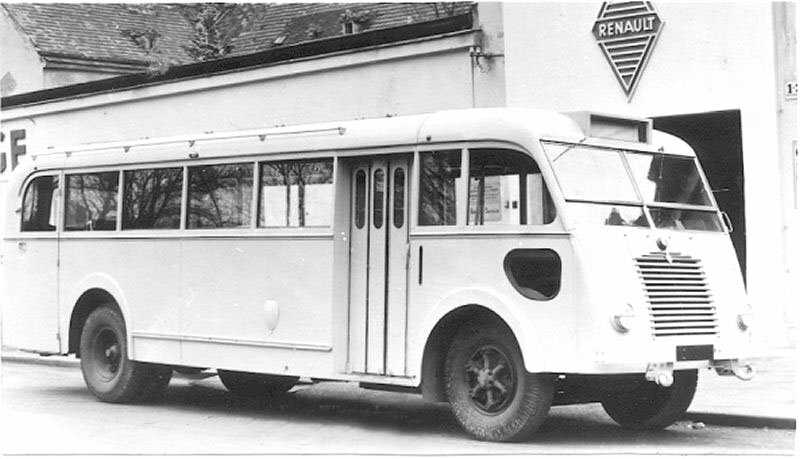 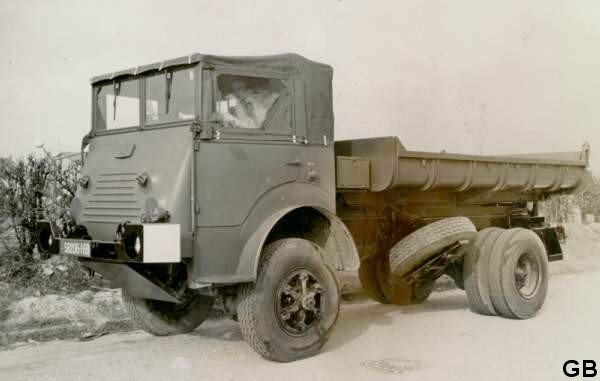 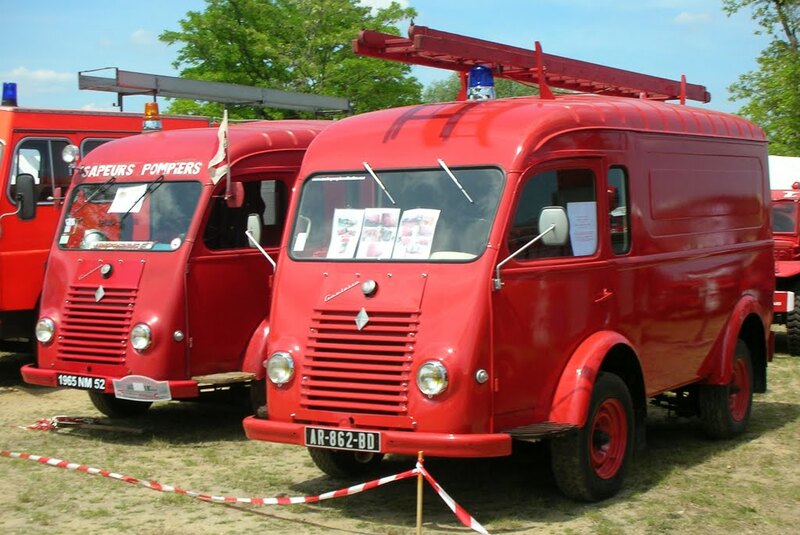 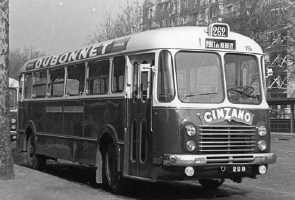 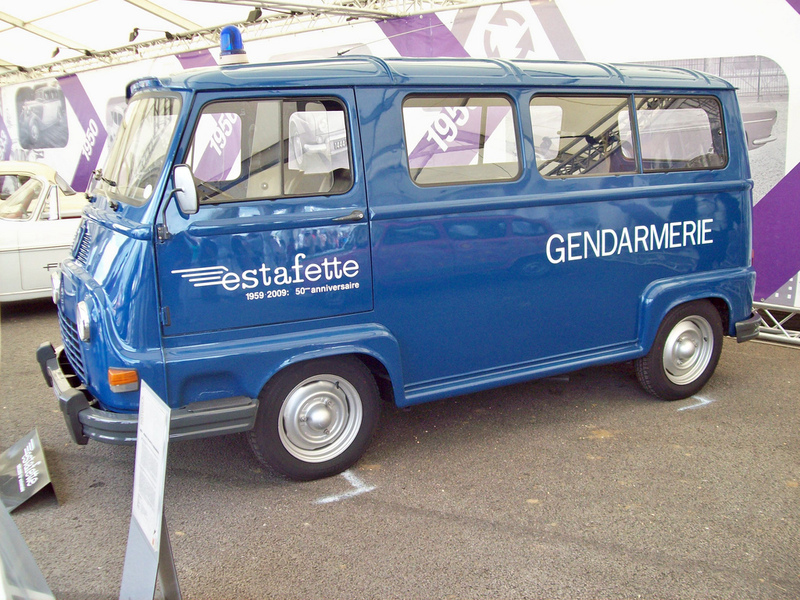 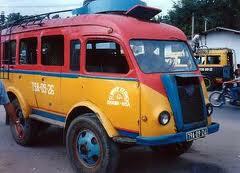 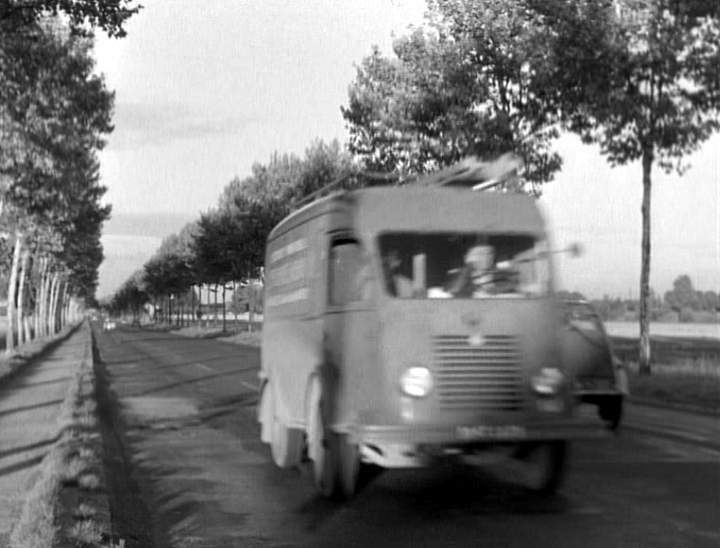 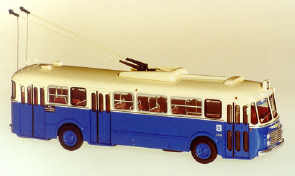 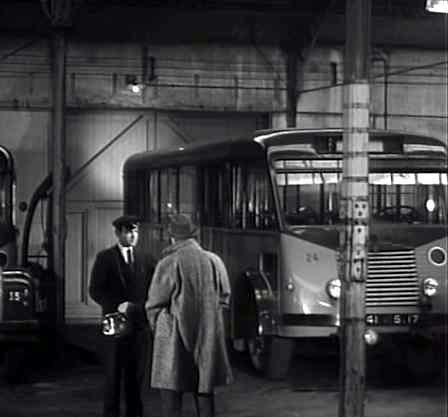 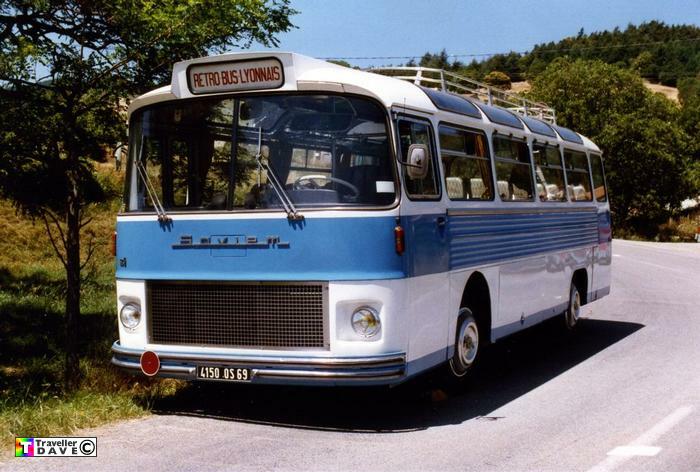 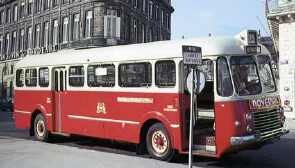 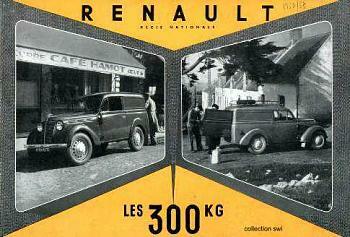 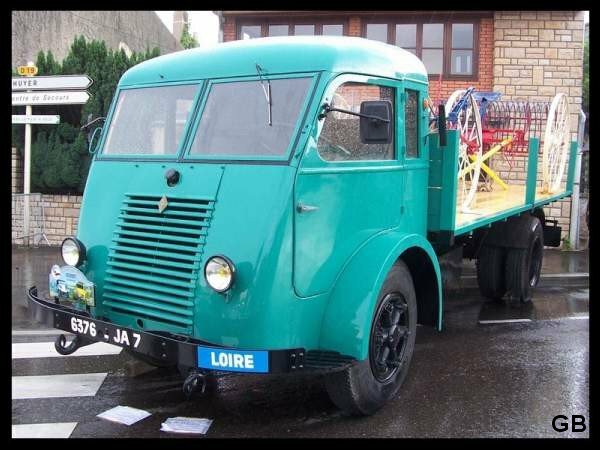 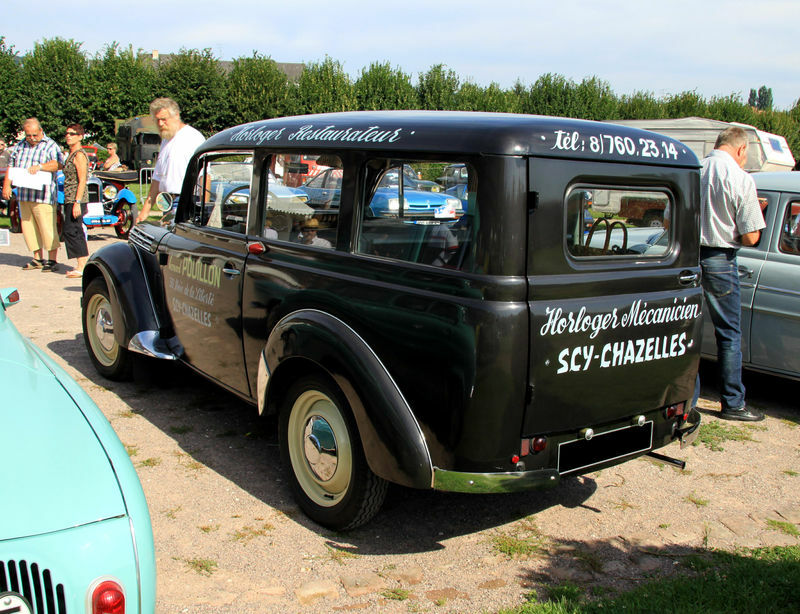 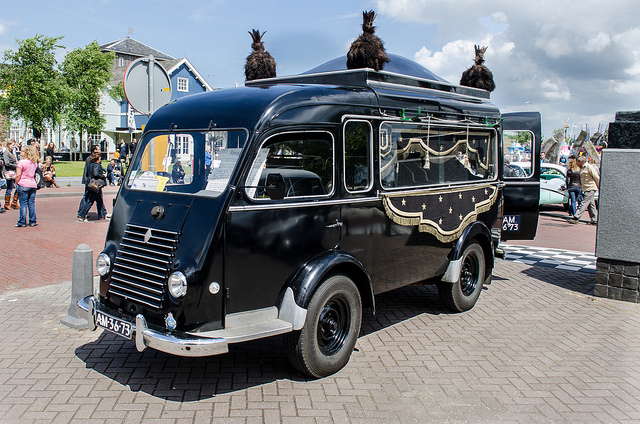 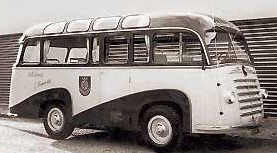 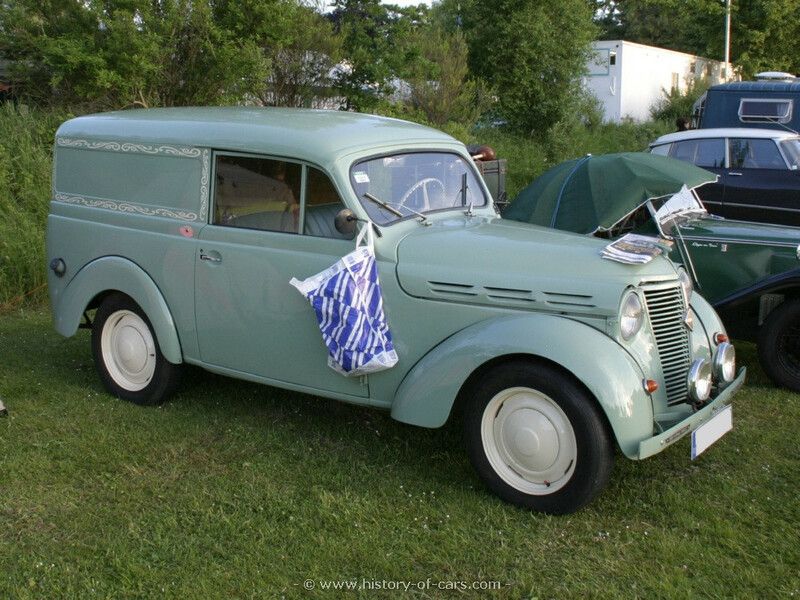 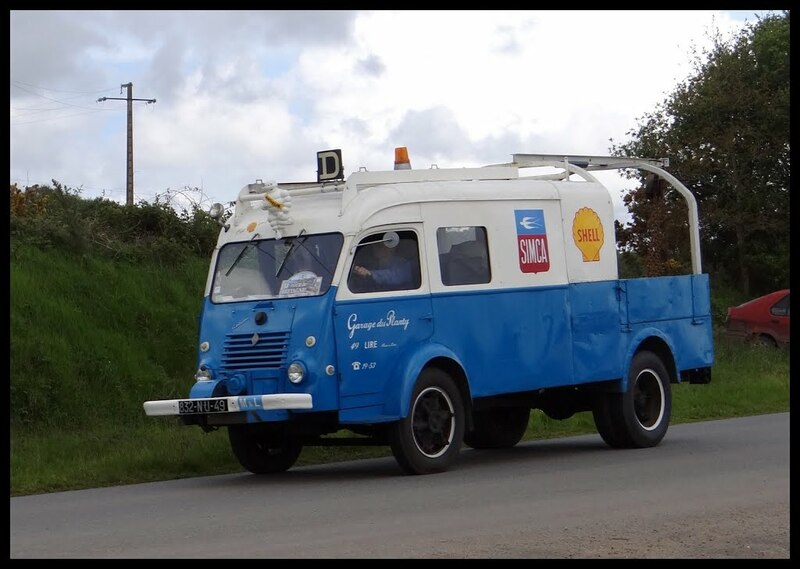 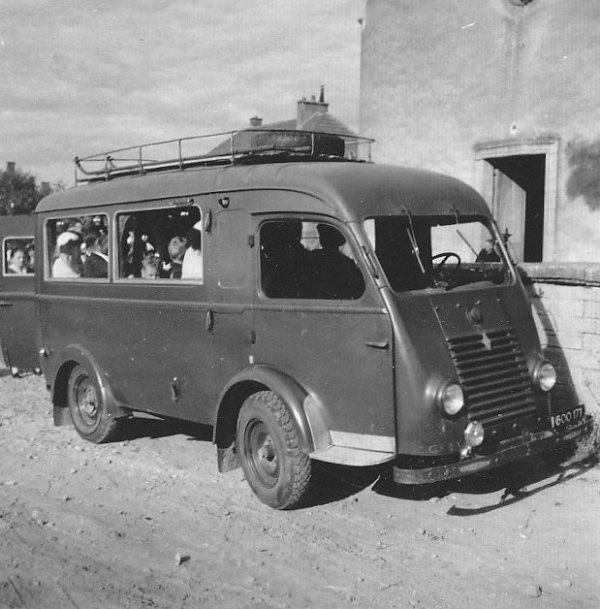 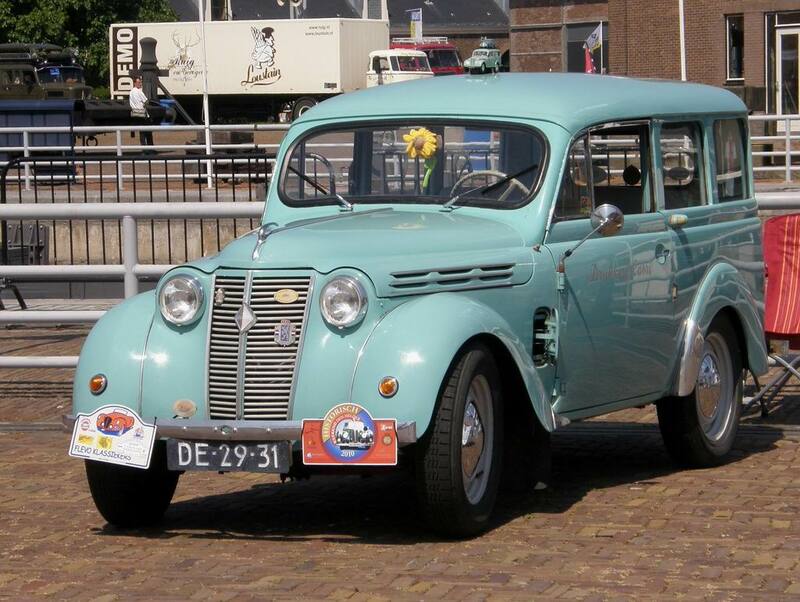 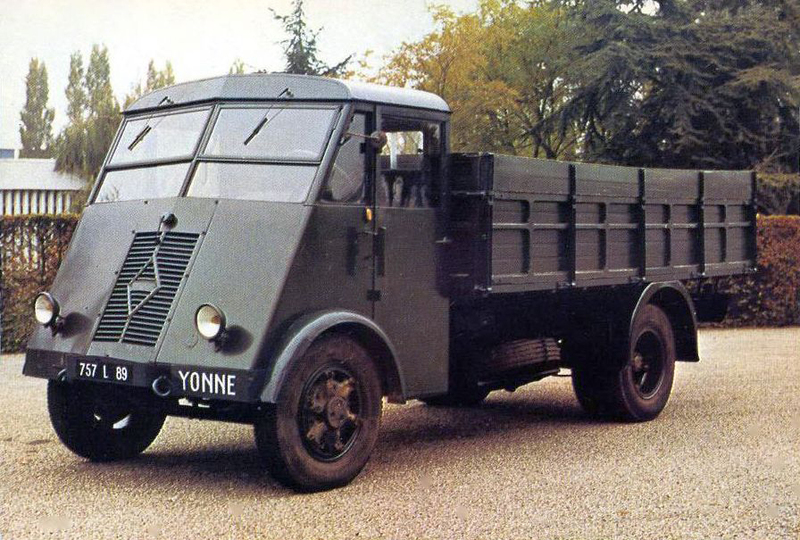 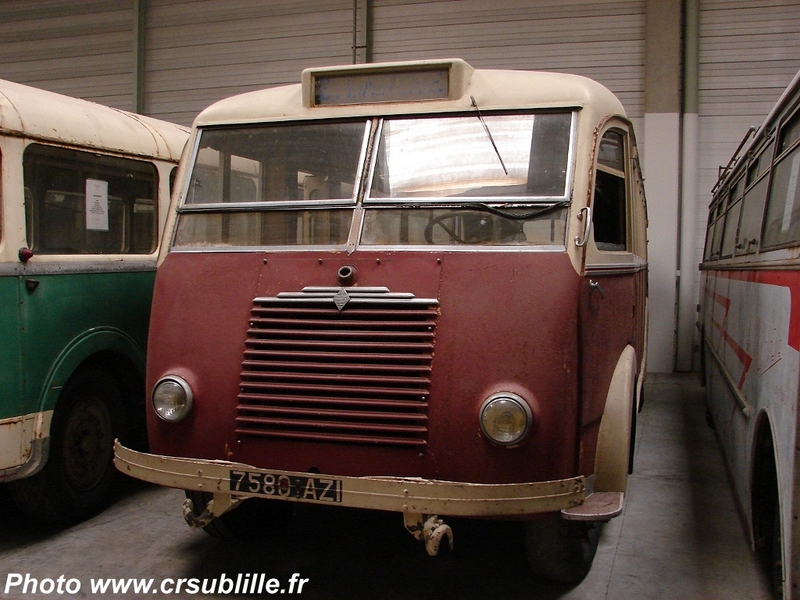 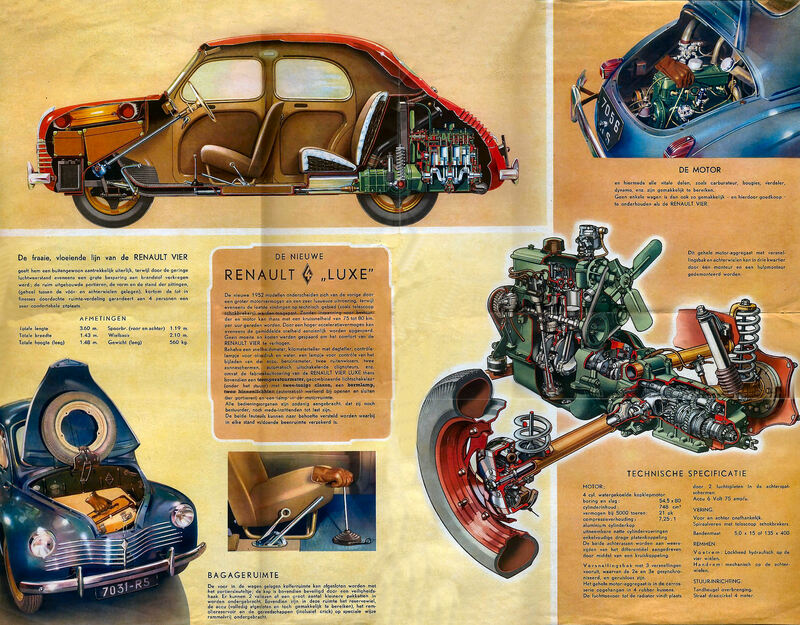 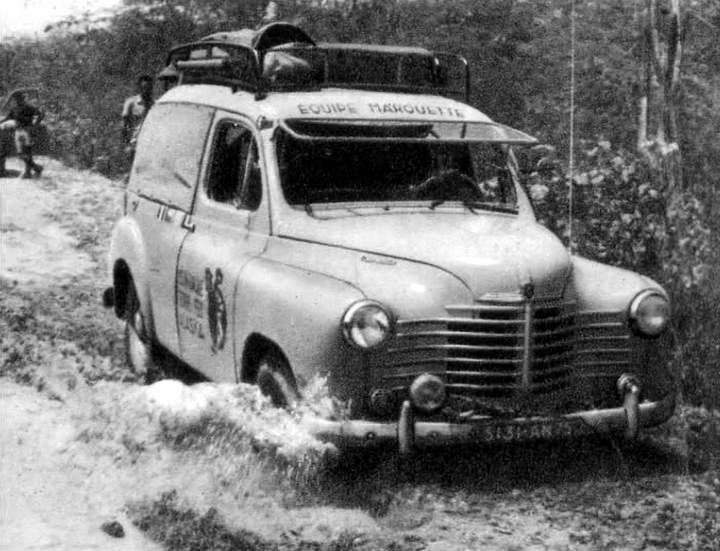 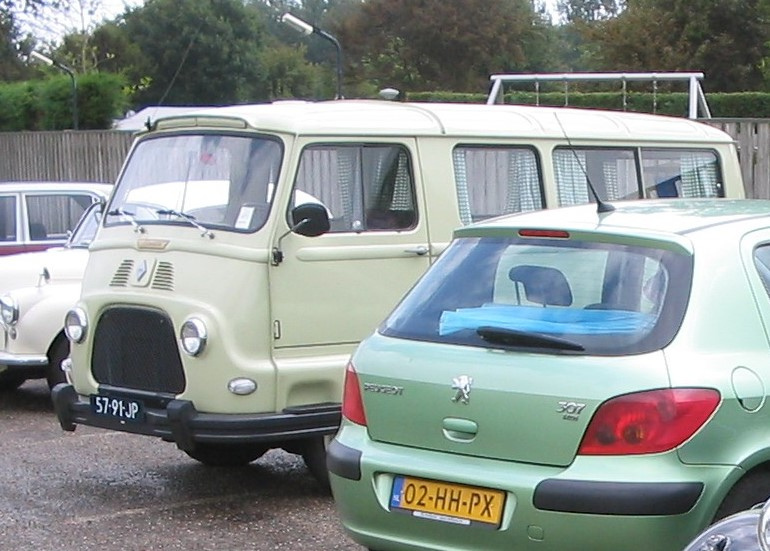 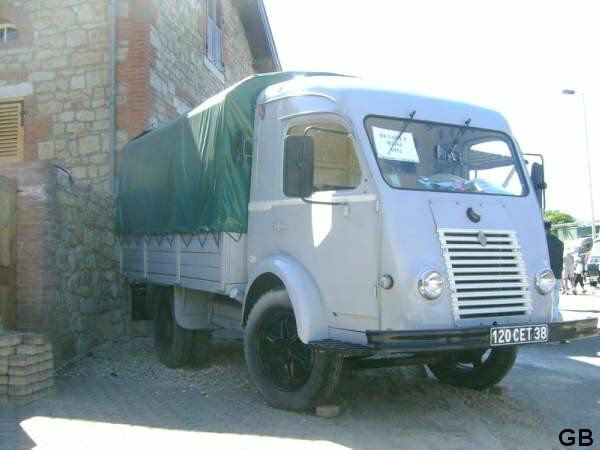 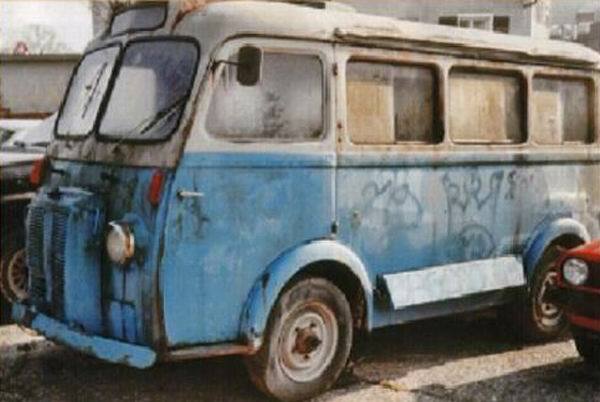 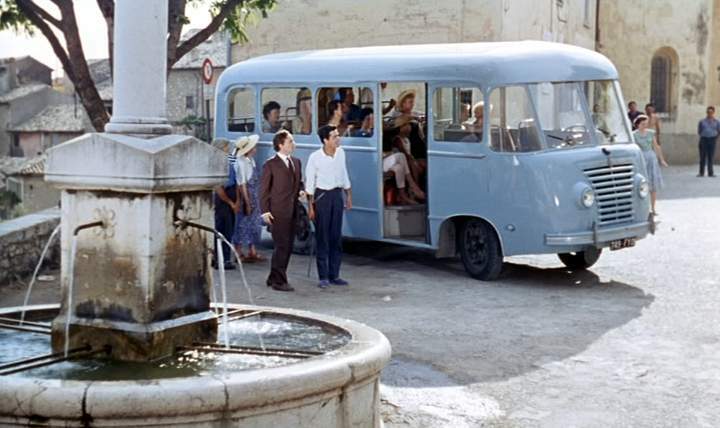 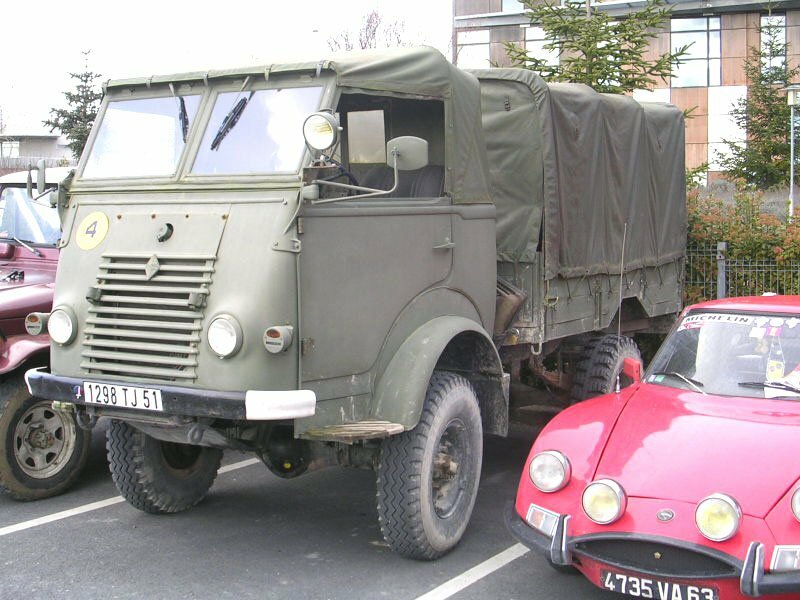 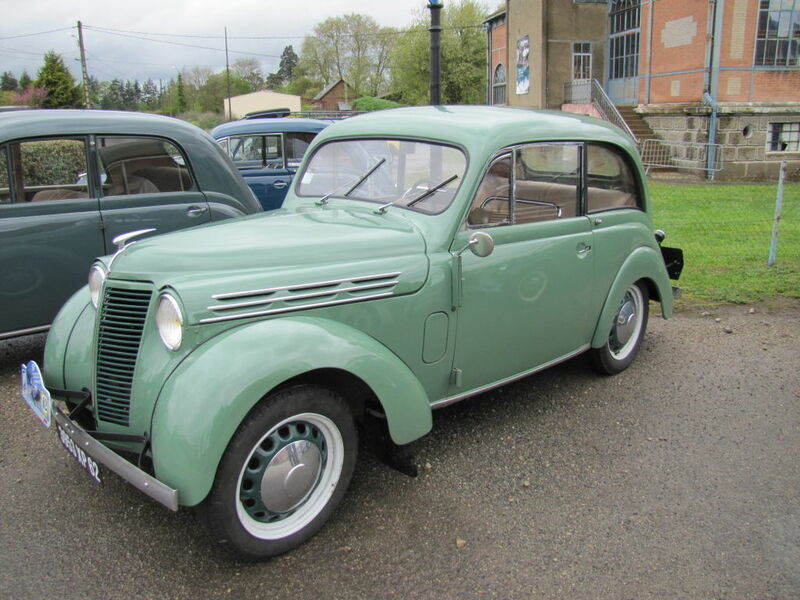 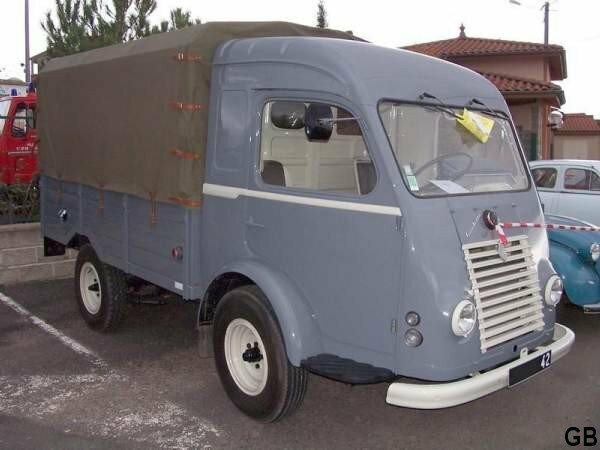 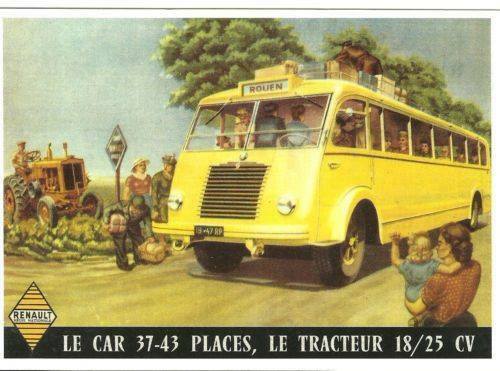 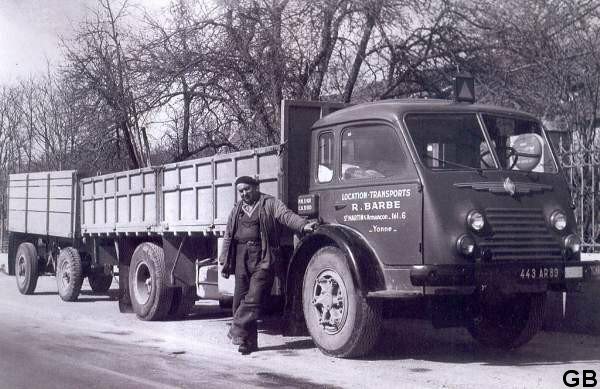 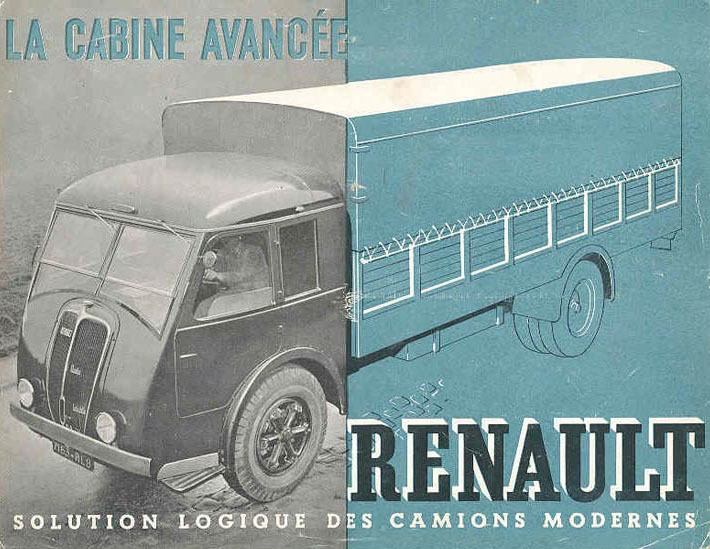 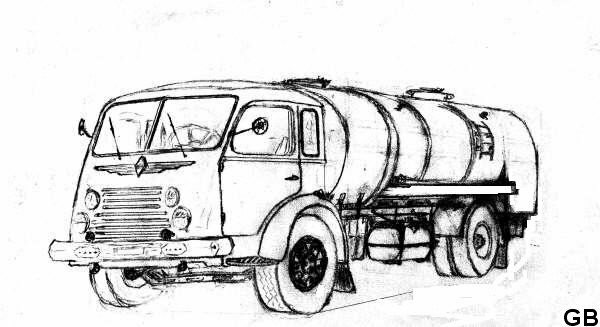 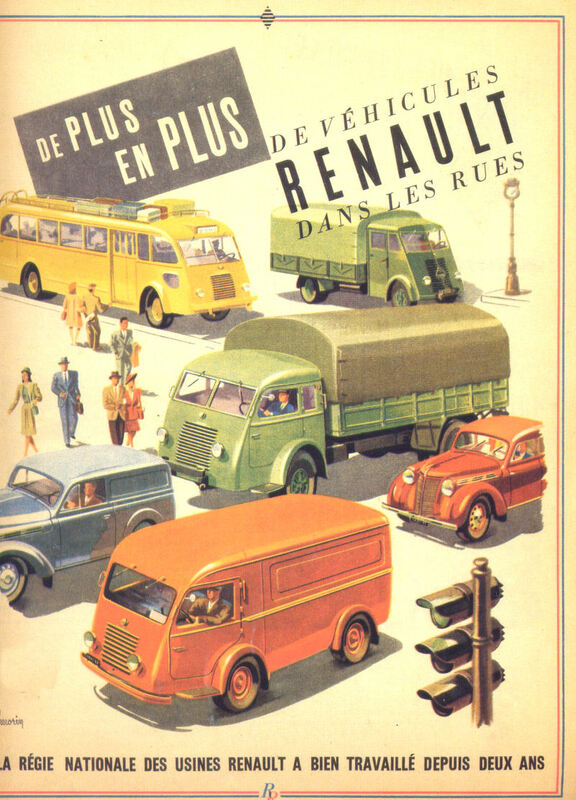 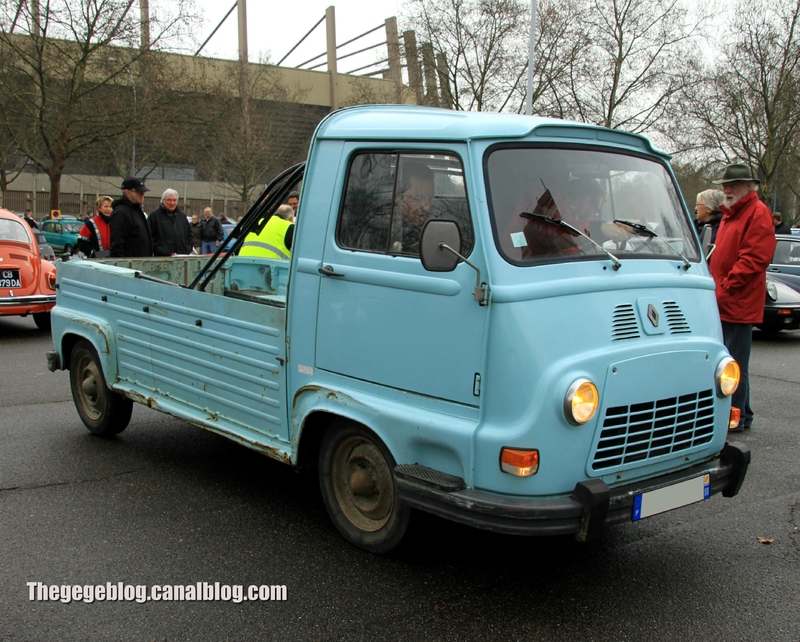 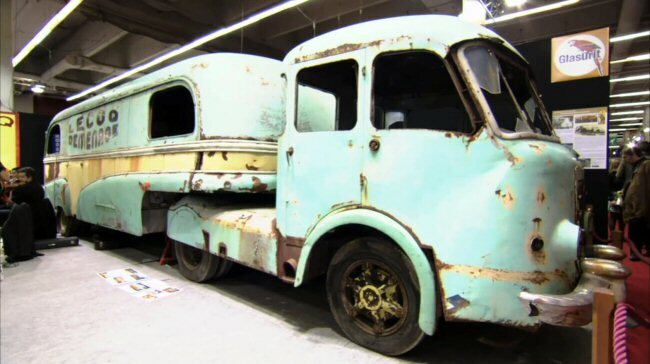 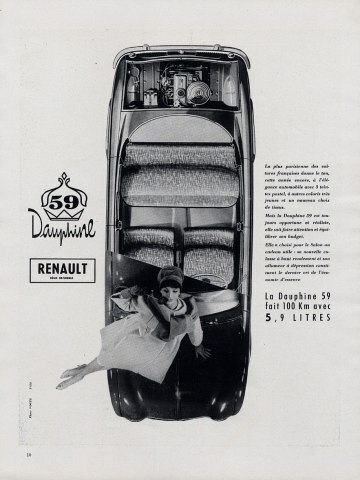 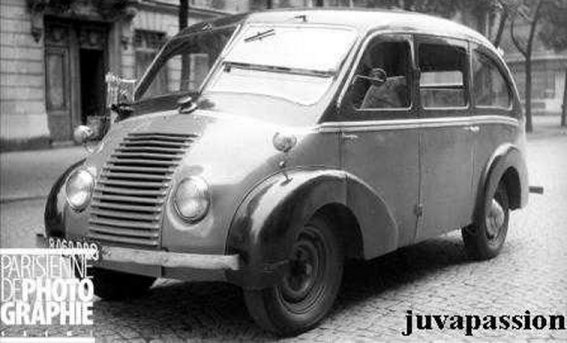 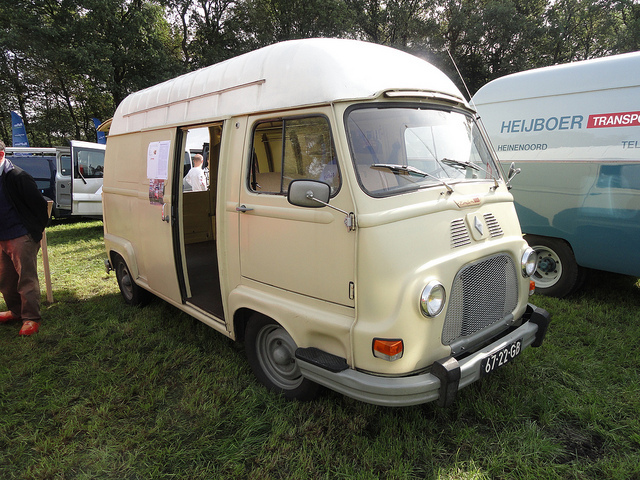 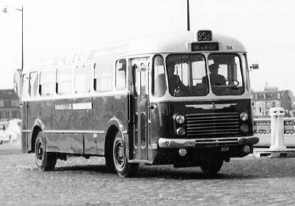 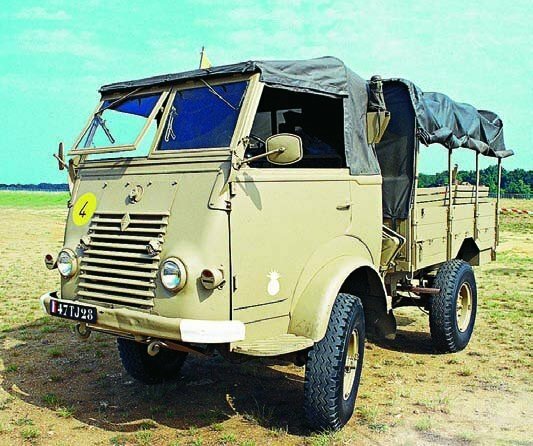 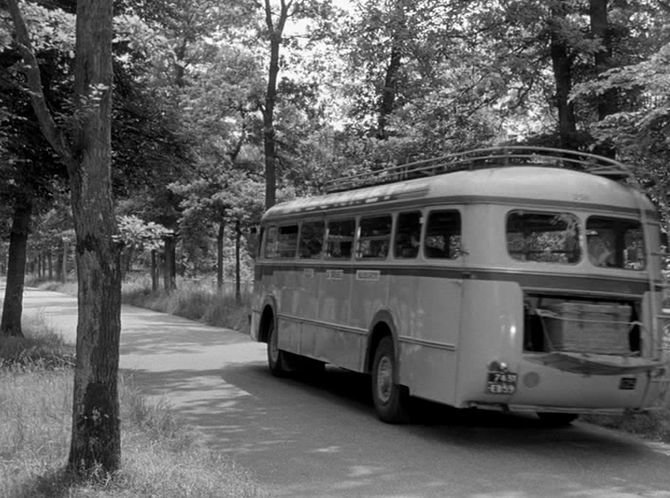 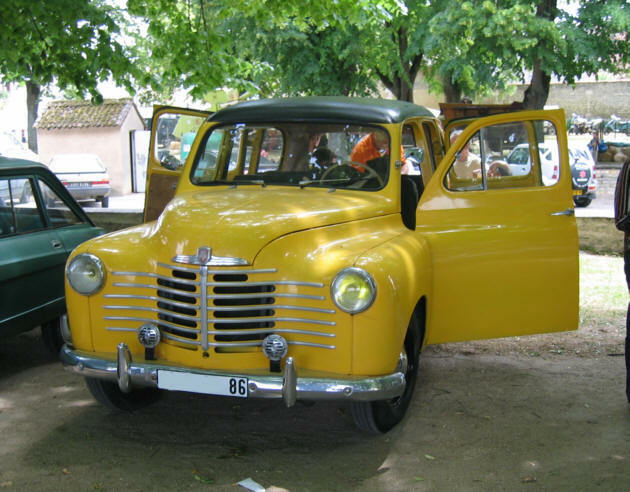 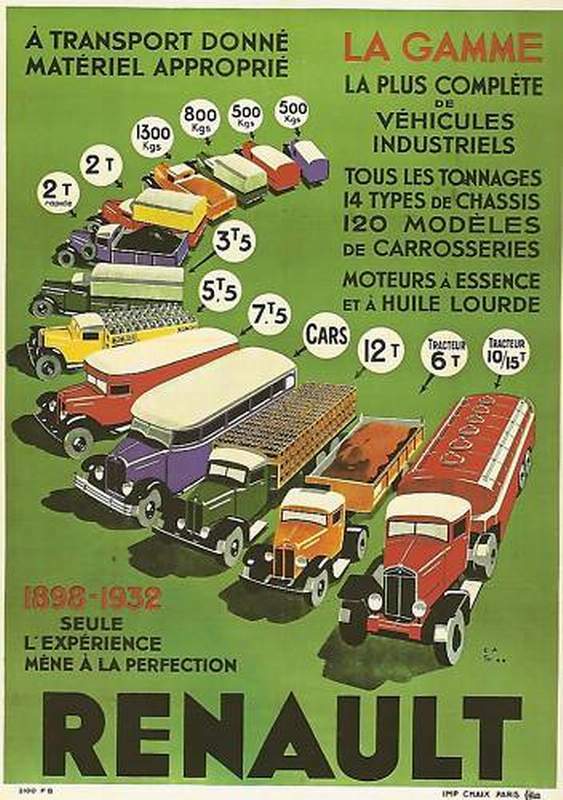 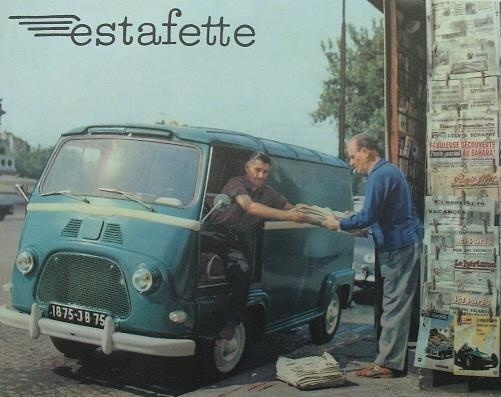 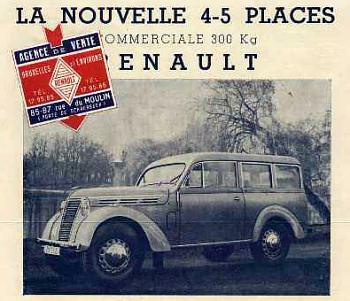 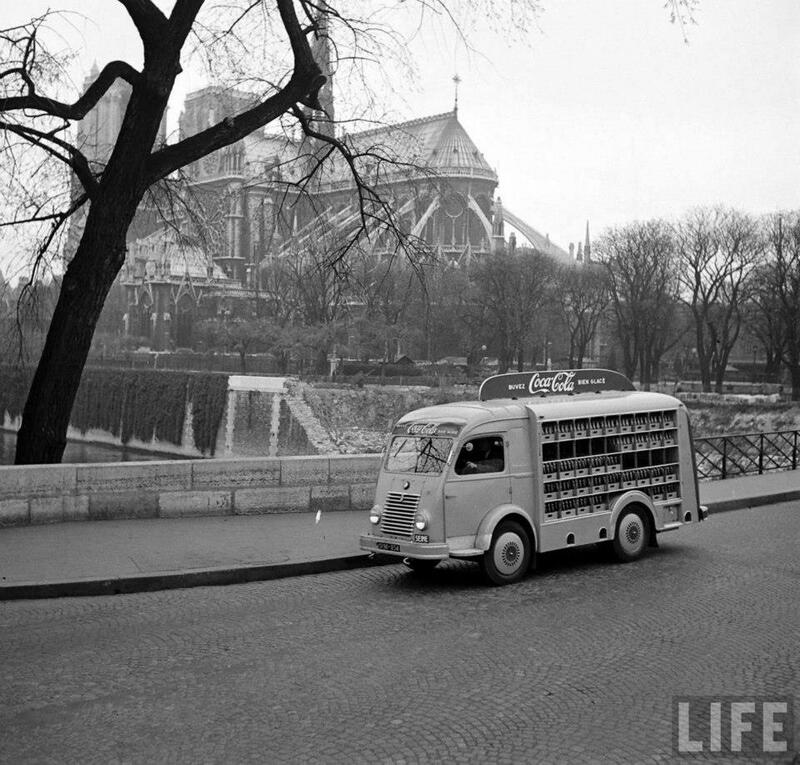 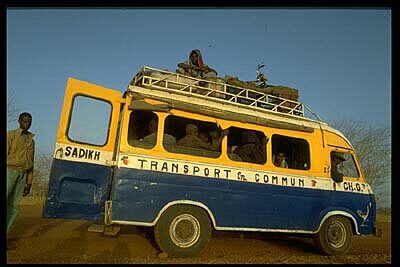 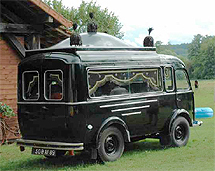 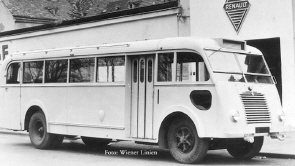 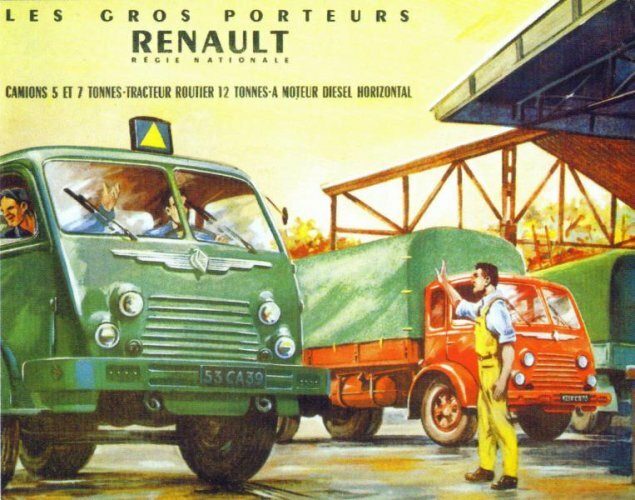 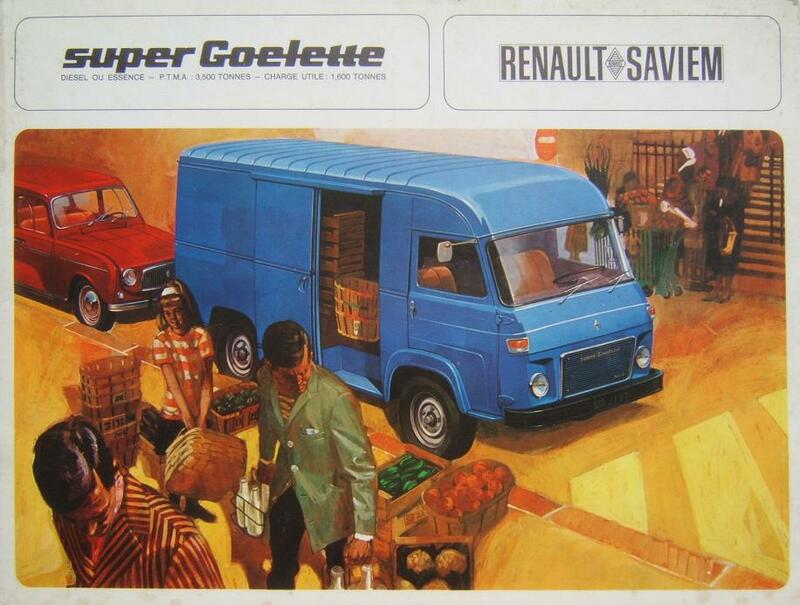 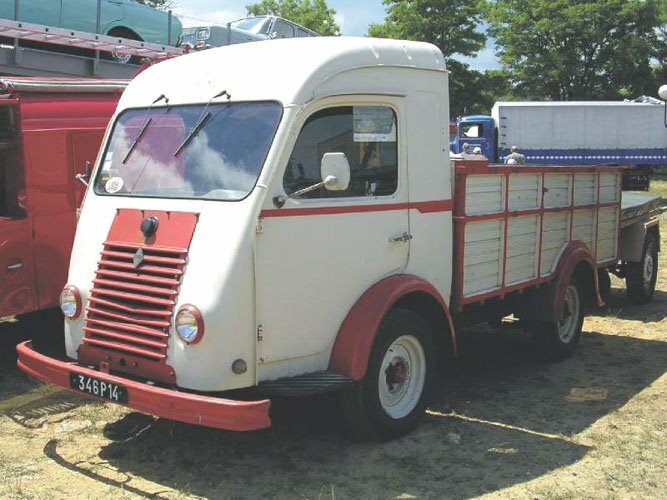 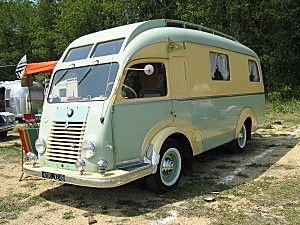 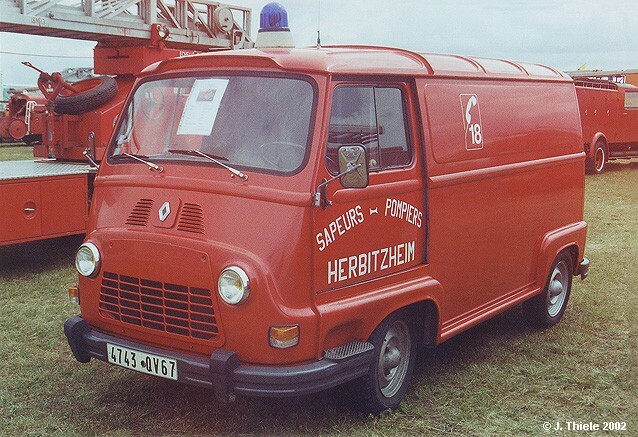 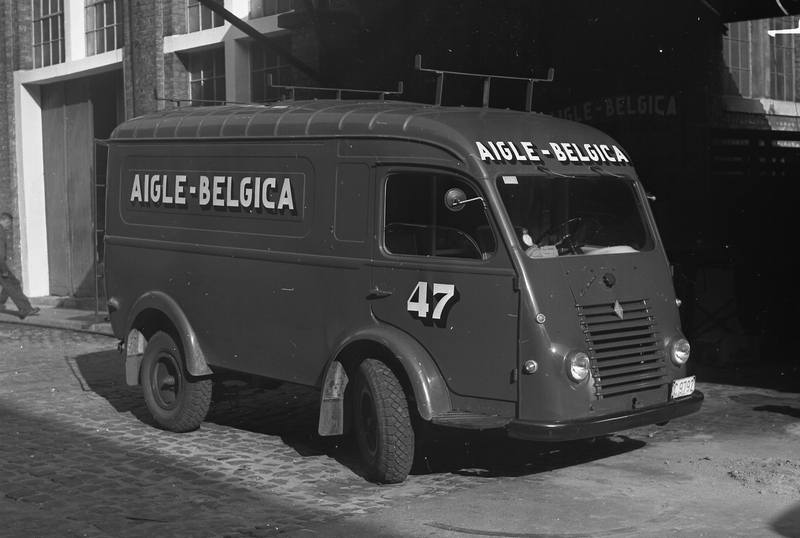 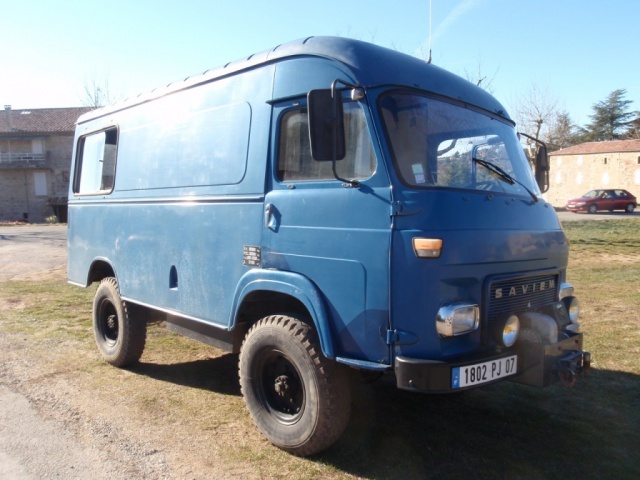 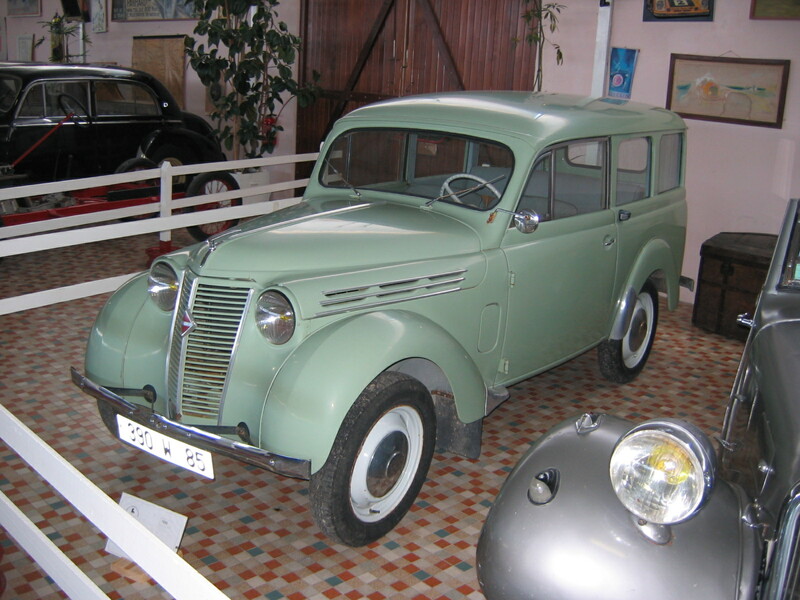 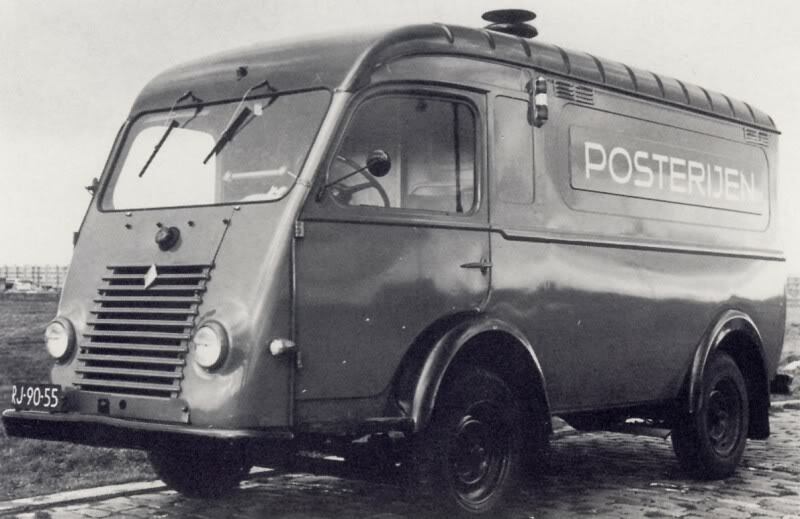 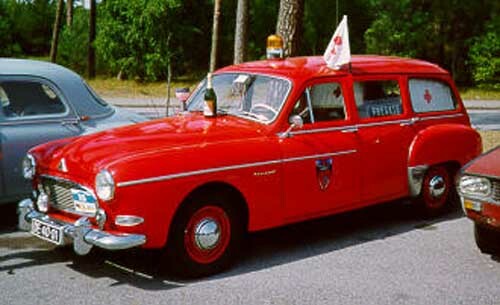 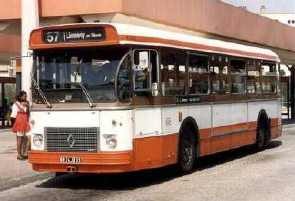 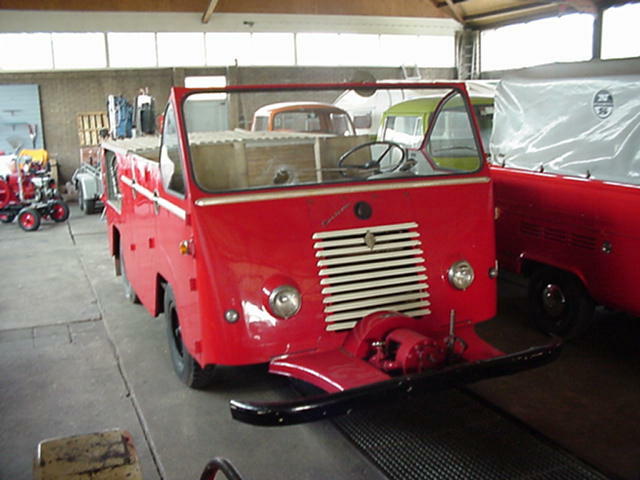 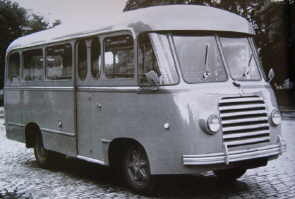 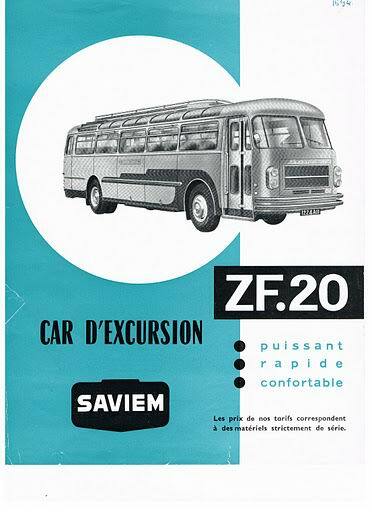 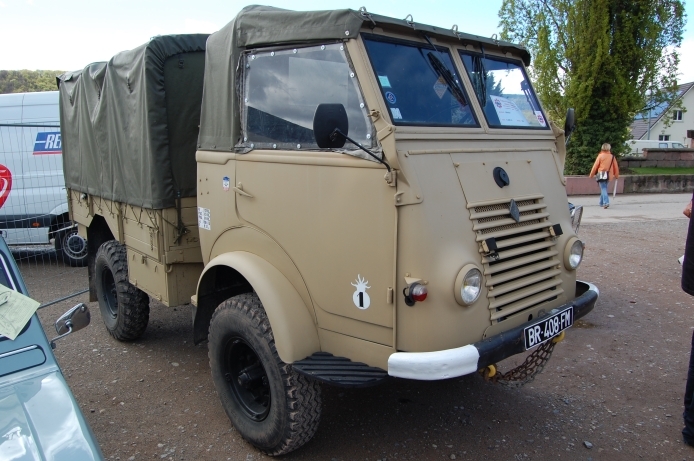 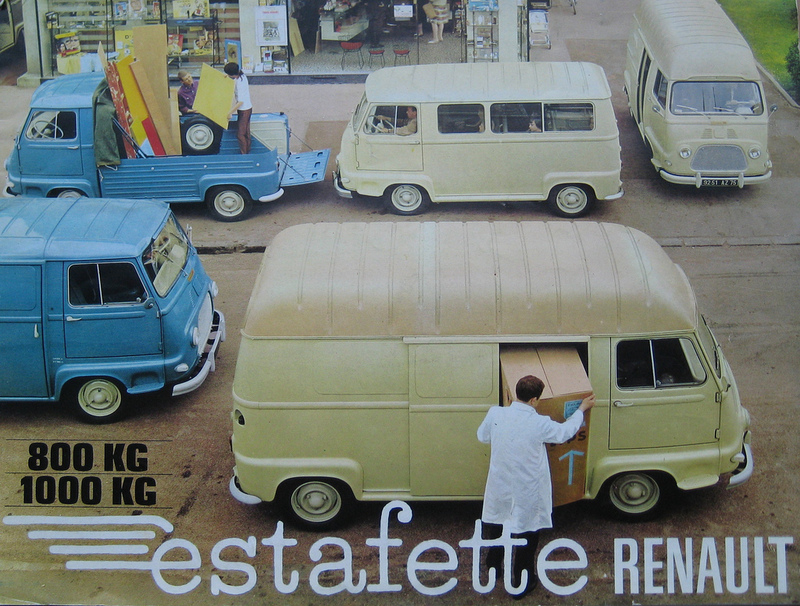 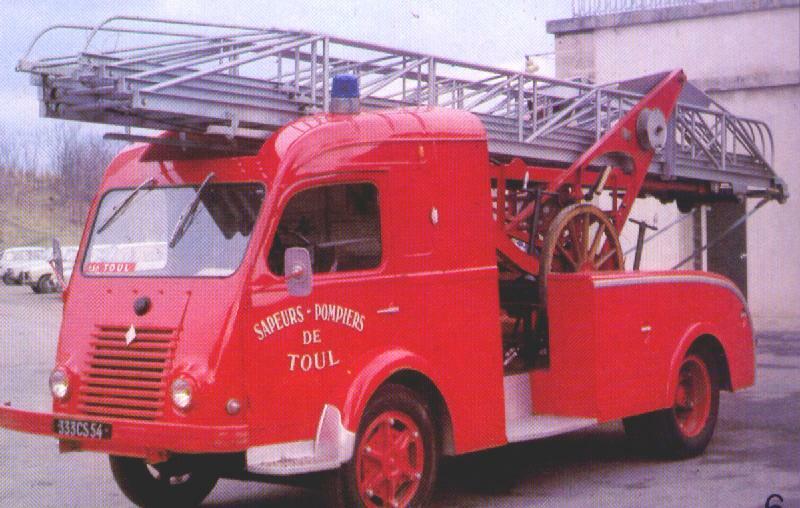 During the 1950s, Renault absorbed small French heavy vehicles’ manufacturers (Somua and Latil) and in 1955 merged them with its own truck and bus division to form the Société Anonyme de Véhicules Industriels et d’Equipements Mécaniques (Saviem). 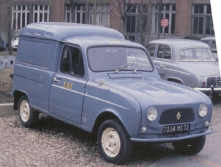 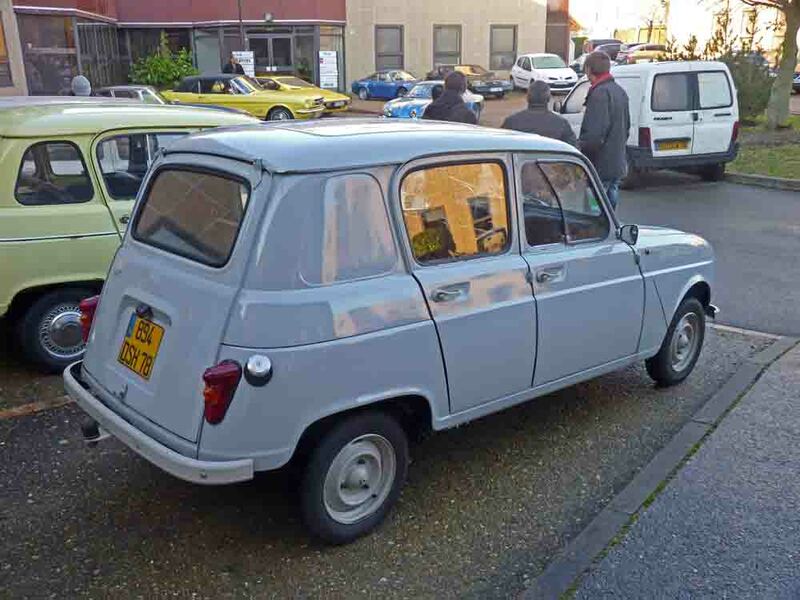 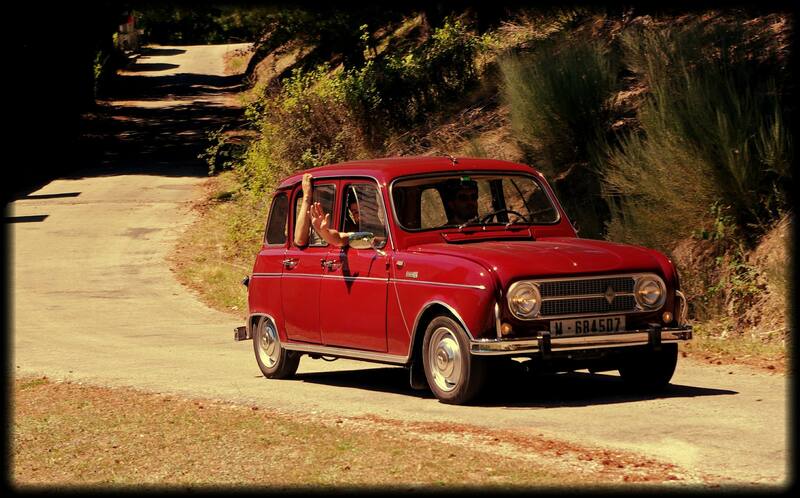 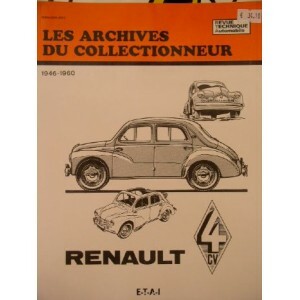 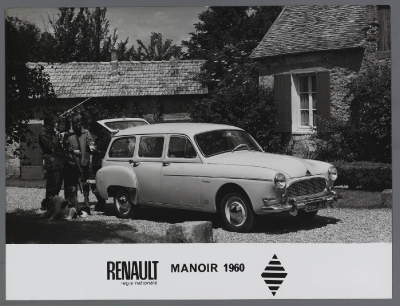 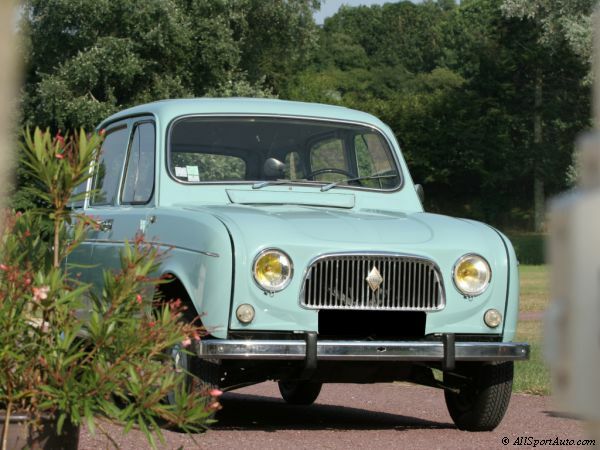 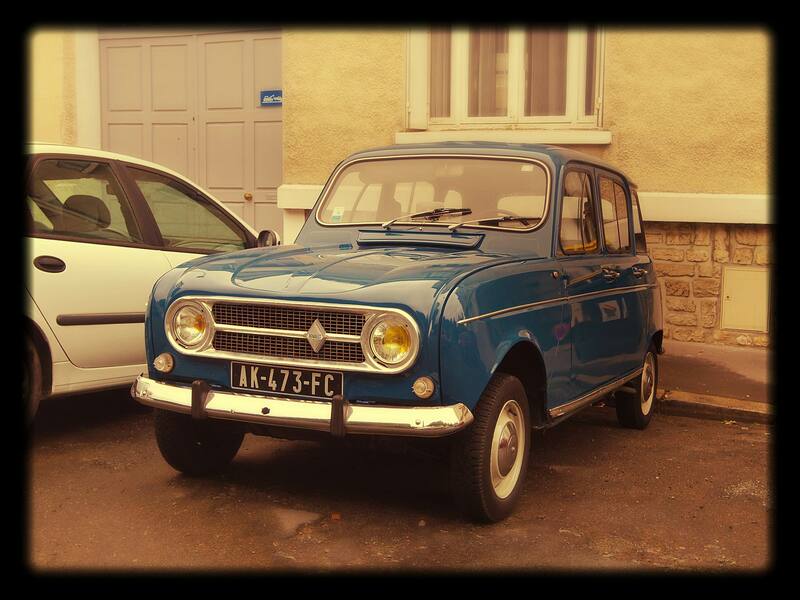 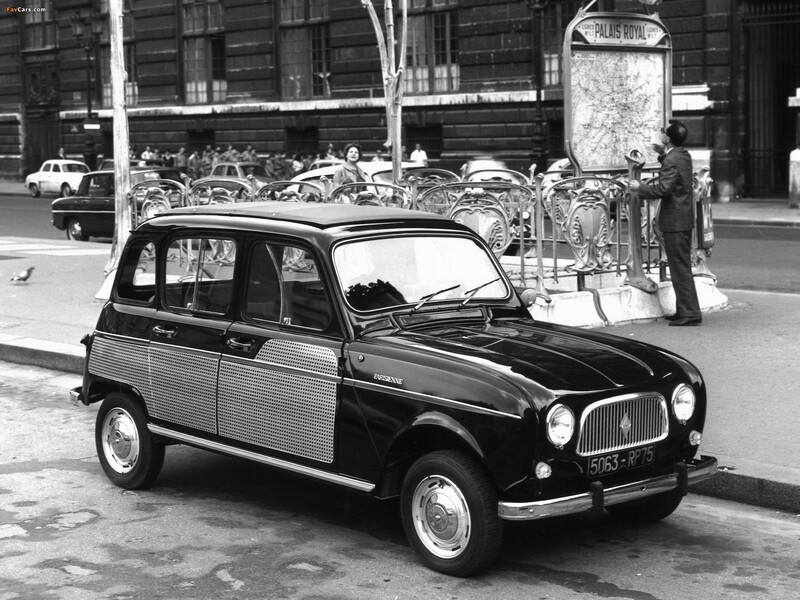 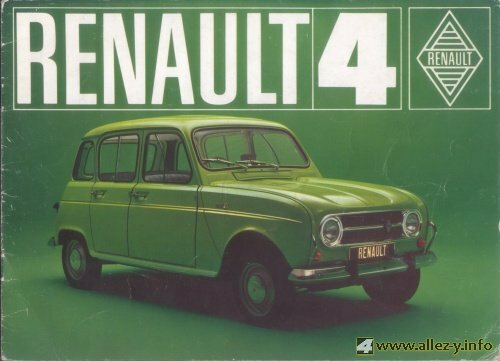 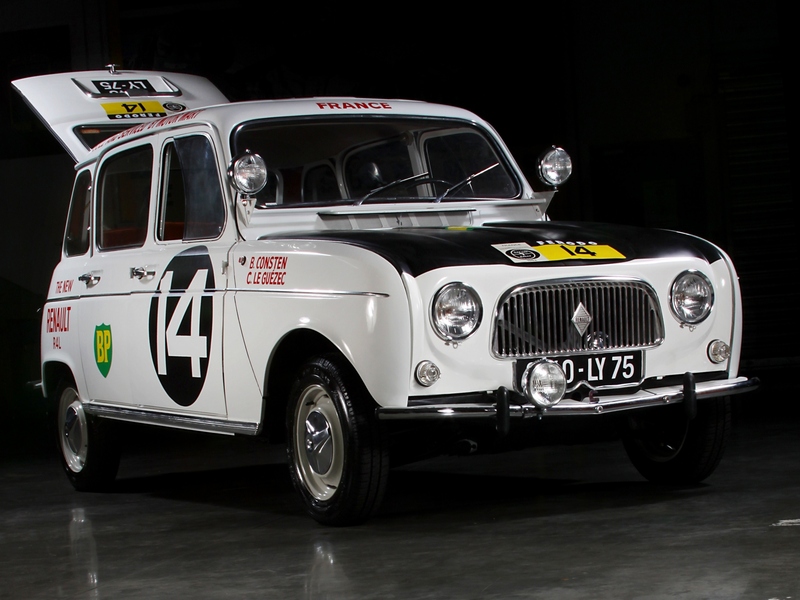 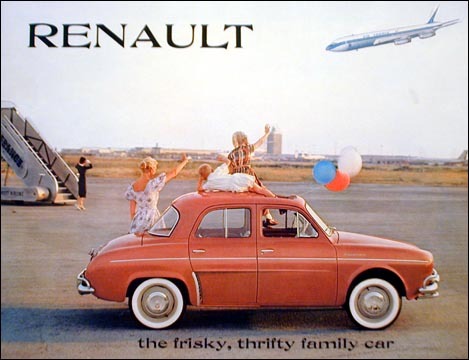 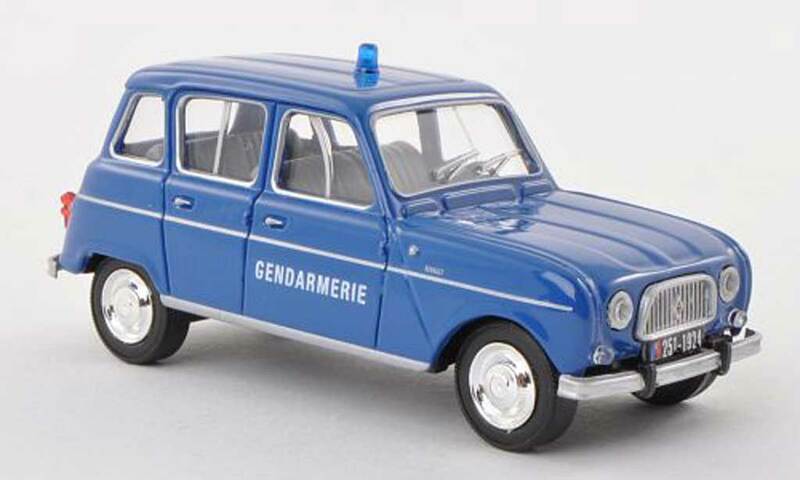 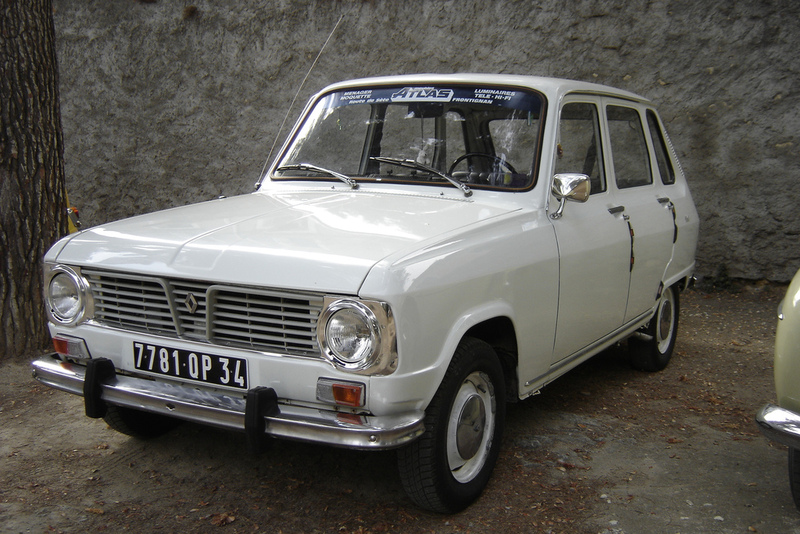 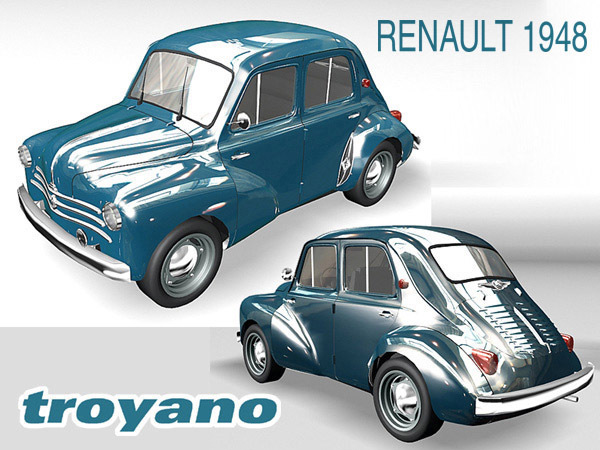 Renault subsequently launched two cars which became very successful – the Renault 4 (1961–1992), a practical competitor for the likes of the Citroën 2CV, and Renault 8. 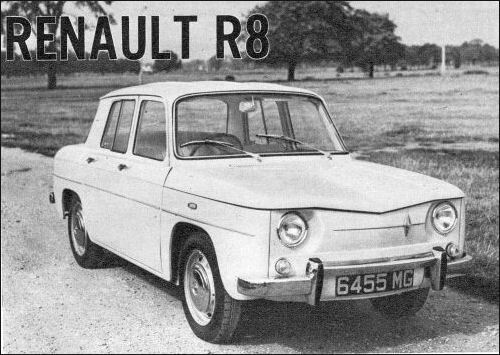 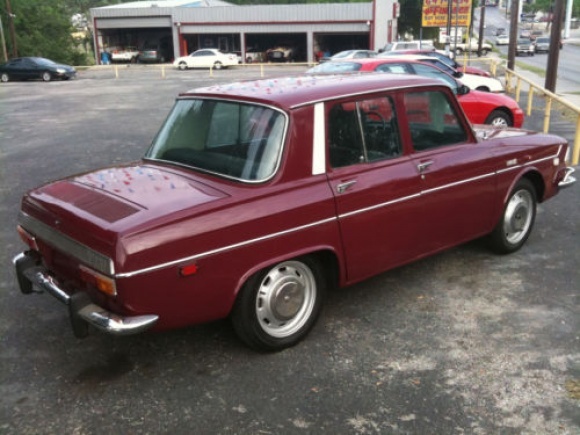 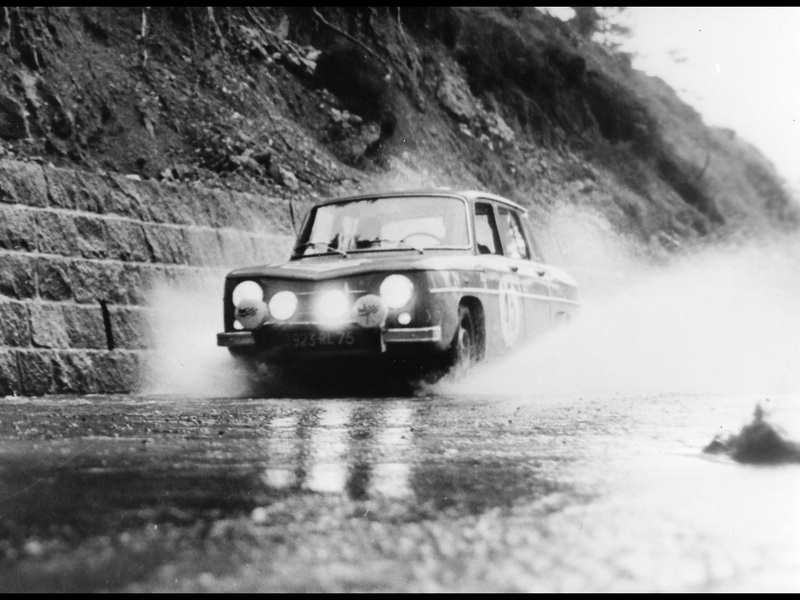 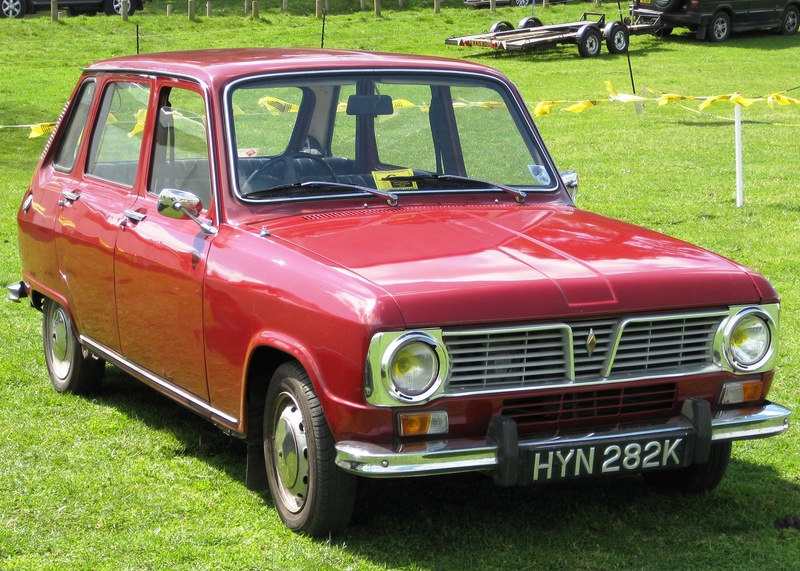 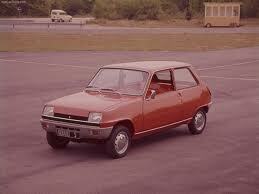 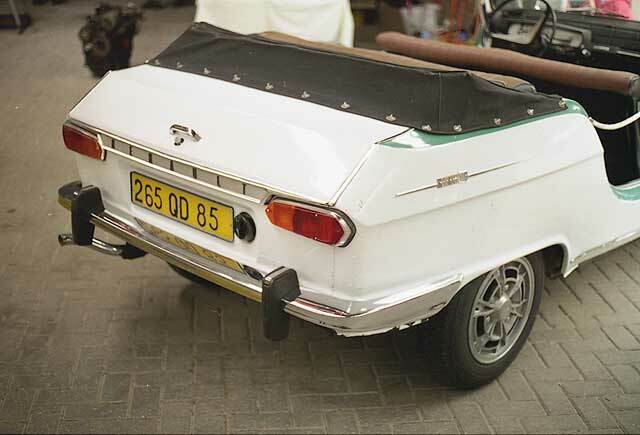 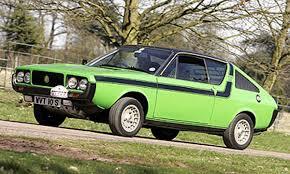 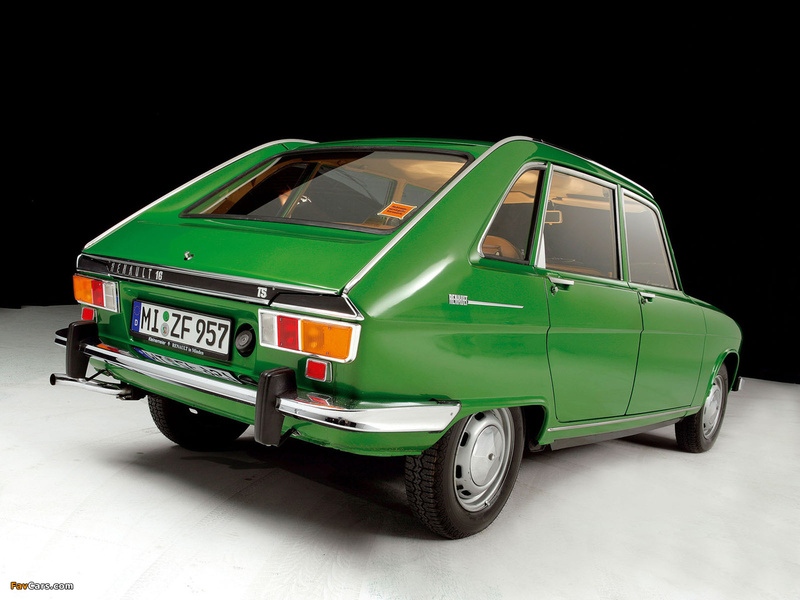 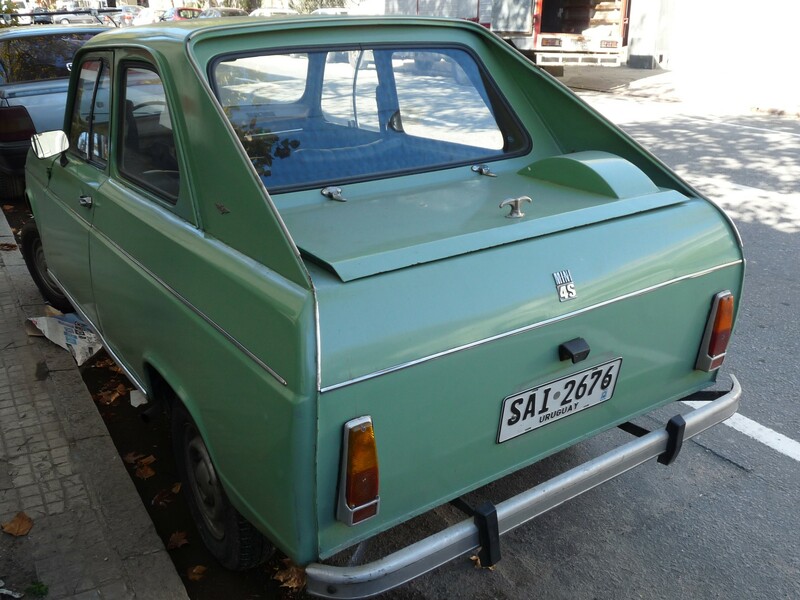 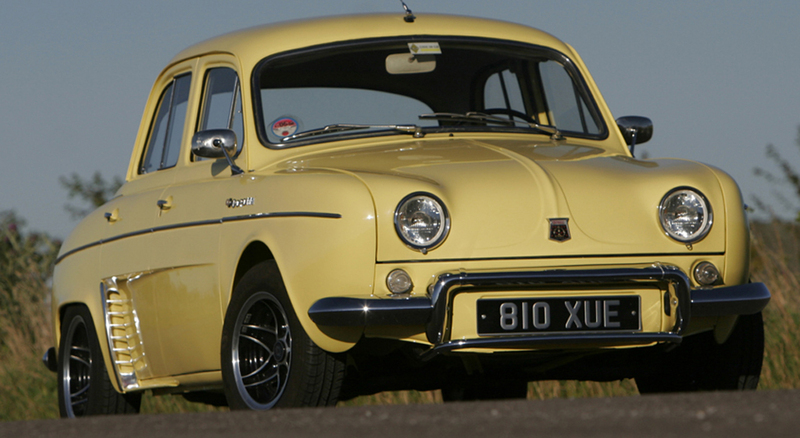 The larger rear-engined Renault 10 followed the success of the R8, and was the last of the rear-engined Renaults. 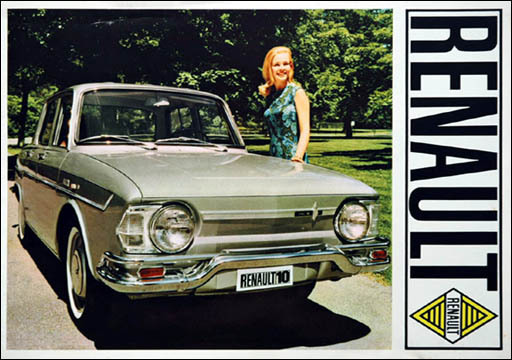 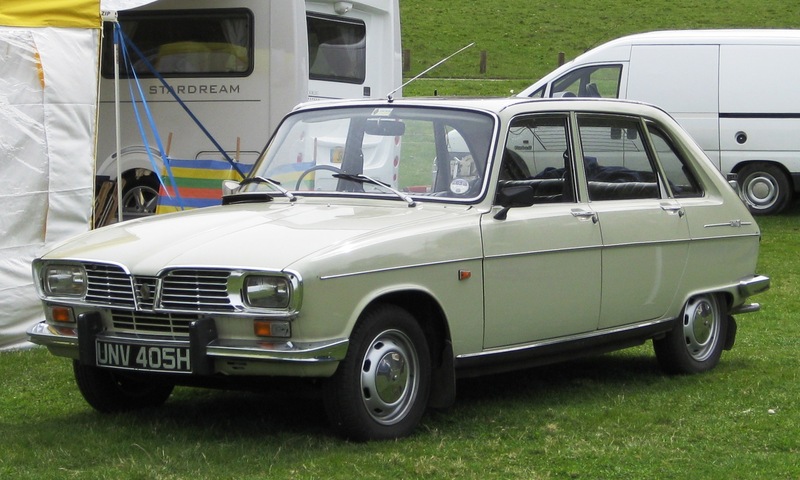 The company achieved success with the more modern and more upmarket Renault 16, a pioneering hatchback launched in 1966, followed by the smaller Renault 6. 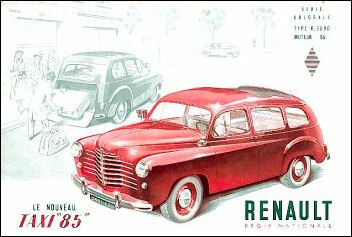 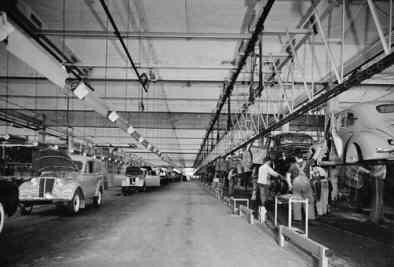 On 16 January 1970 the manufacturer celebrated the 25th anniversary of its 1945 rebirth as the newly nationalised Régie Nationale des Usines Renault. 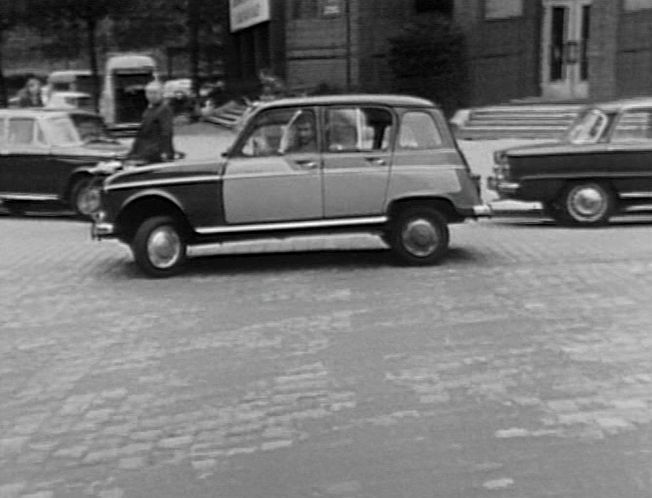 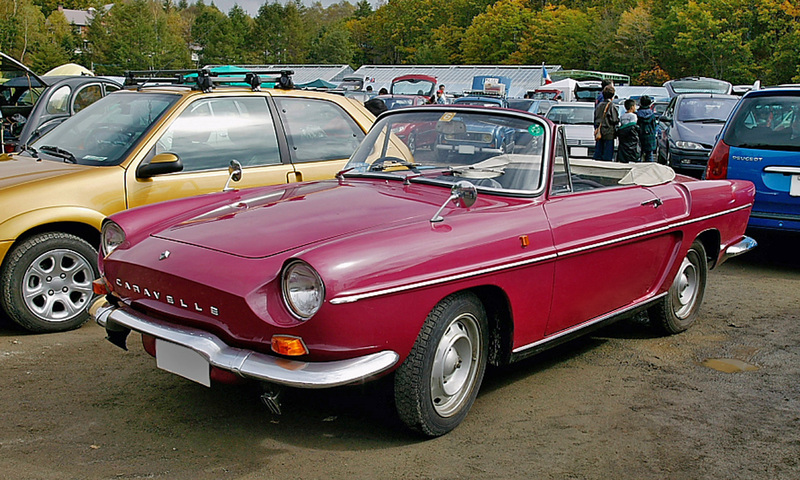 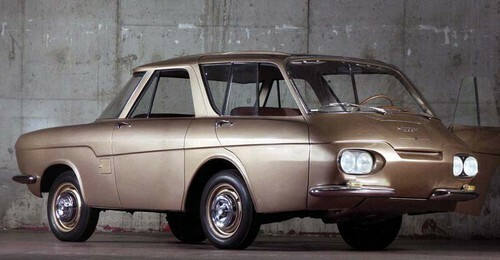 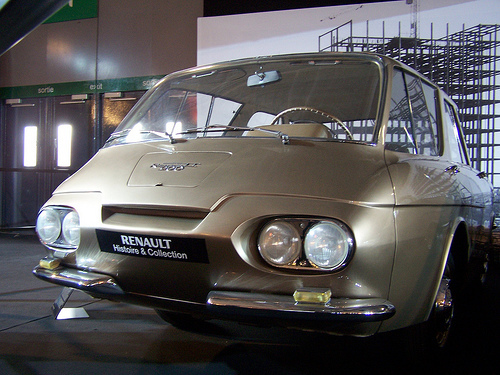 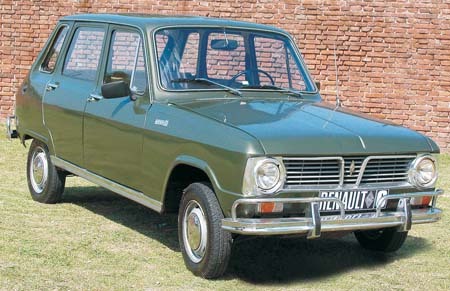 The 1960s had been a decade of aggressive growth for France’s largest auto-maker: a few months earlier, in October 1969, the manufacturer had launched the Renault 12, combining most of the engineering philosophy of its market-defining hatch-backs with the more conservative “three-box” design which many buyers continued to prefer. 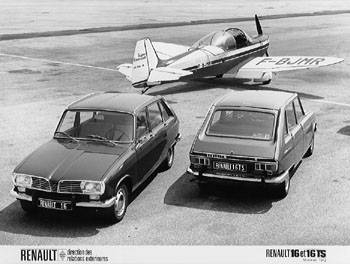 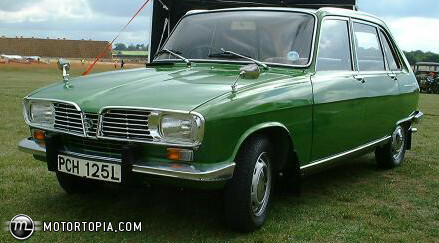 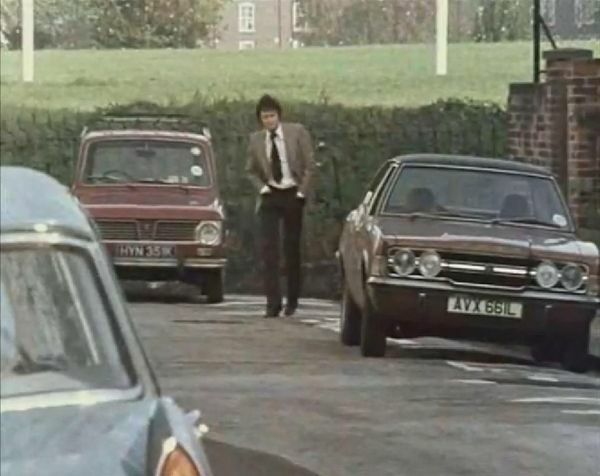 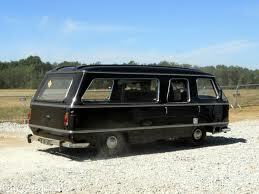 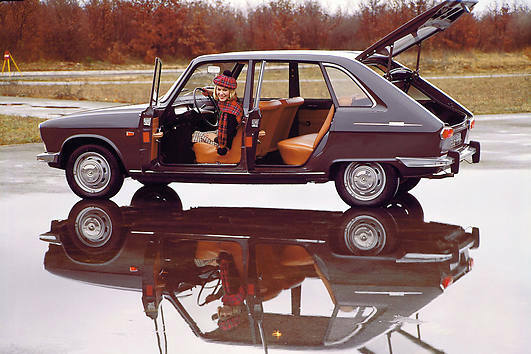 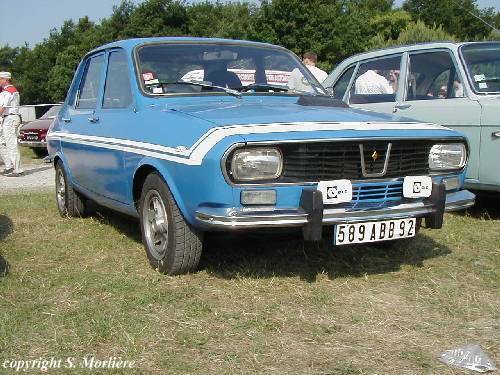 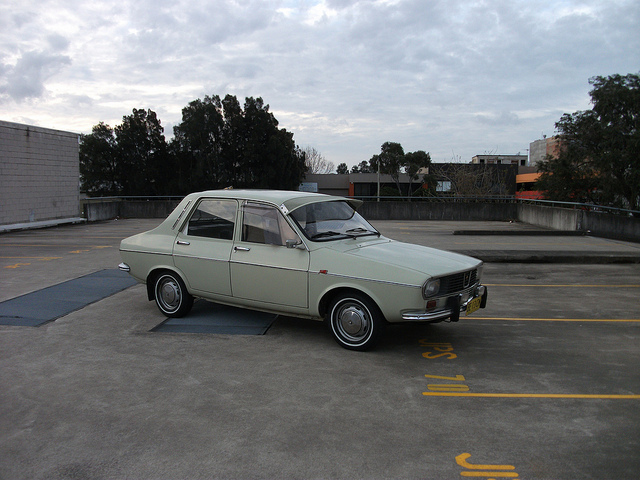 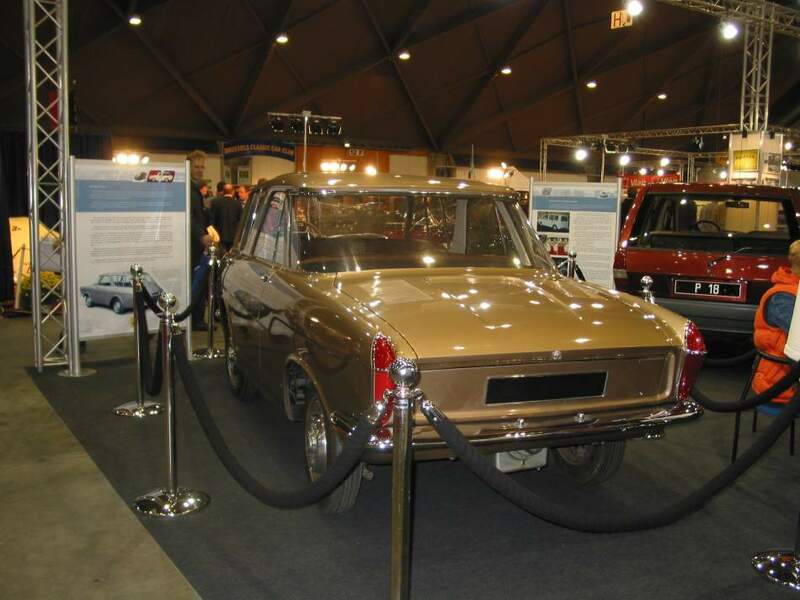 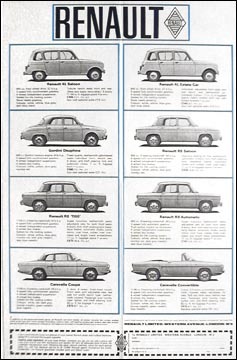 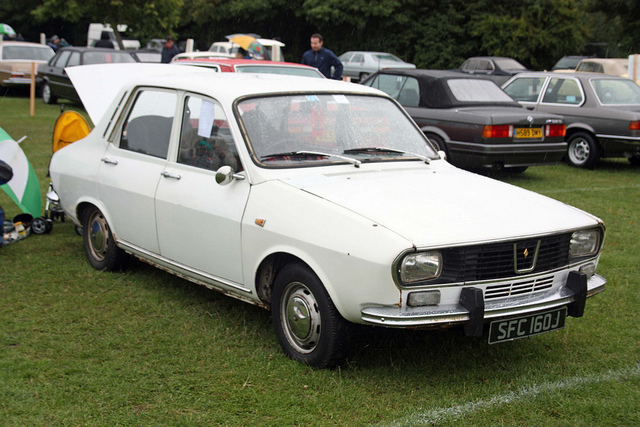 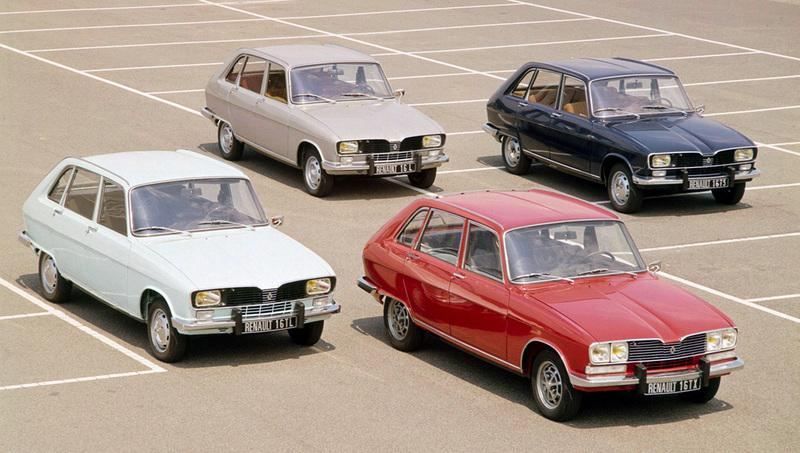 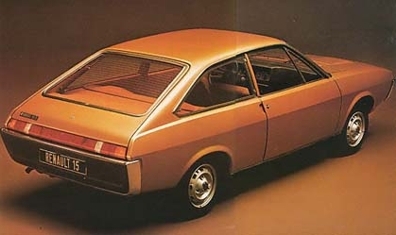 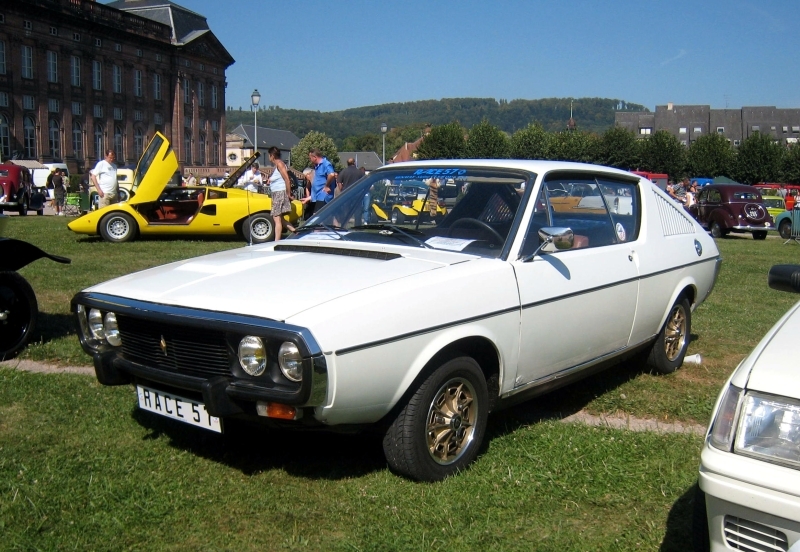 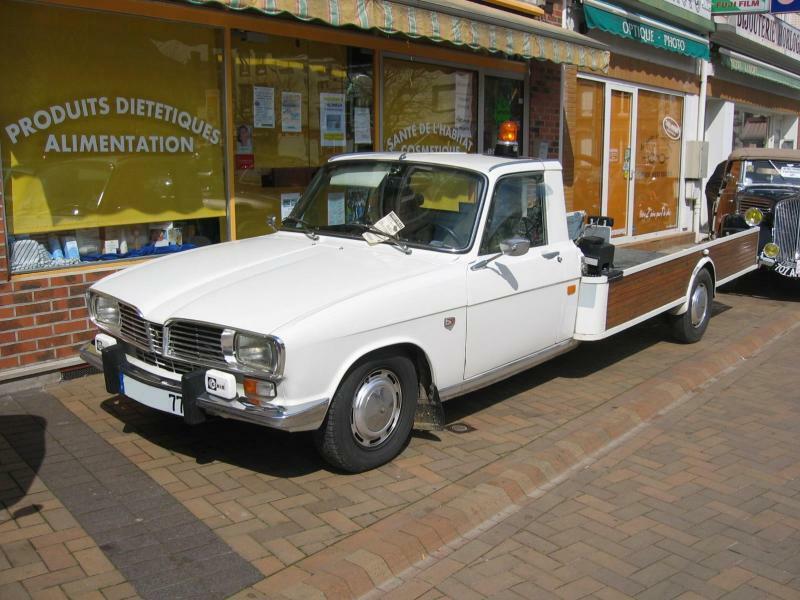 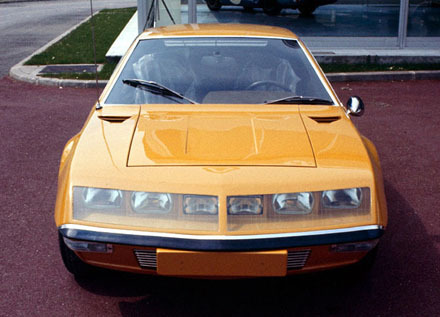 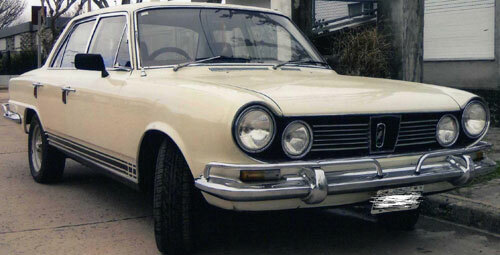 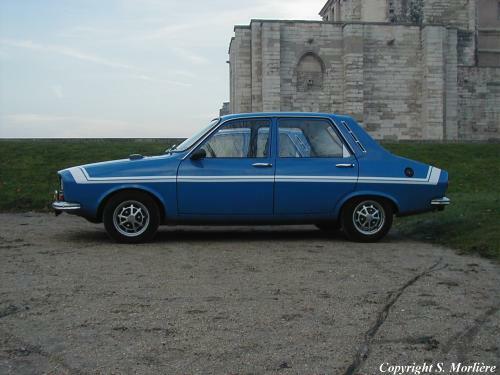 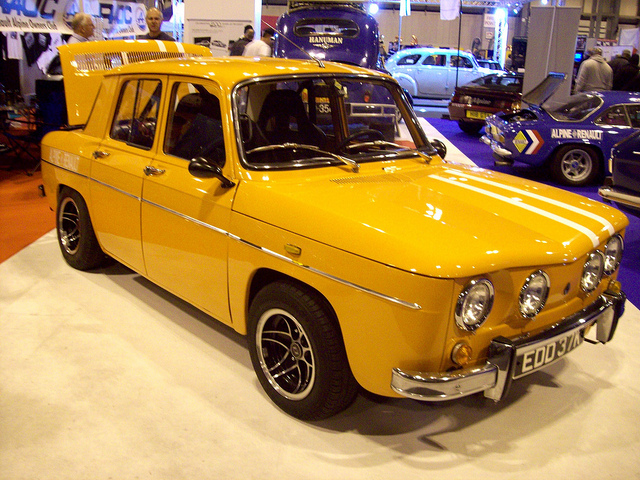 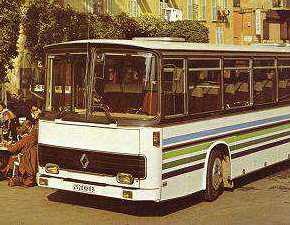 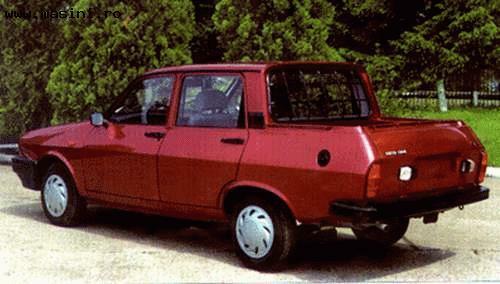 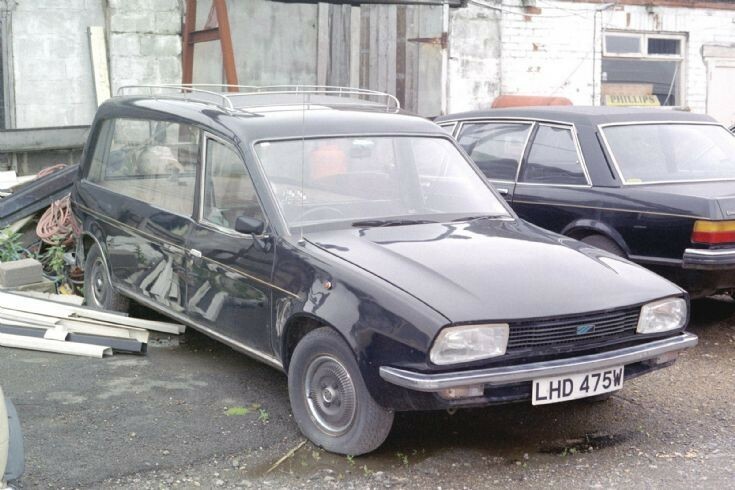 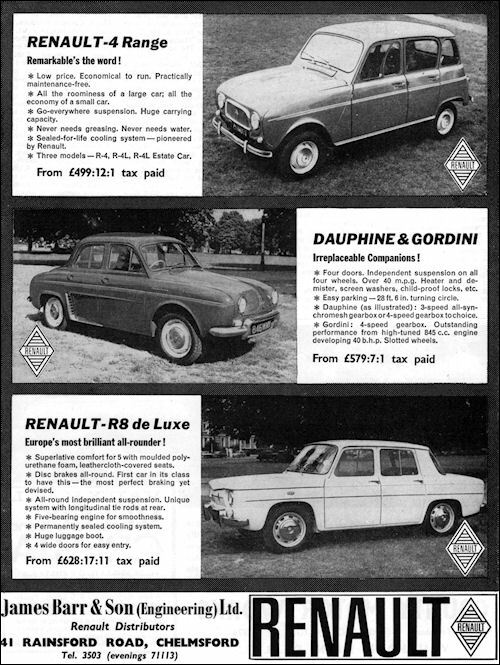 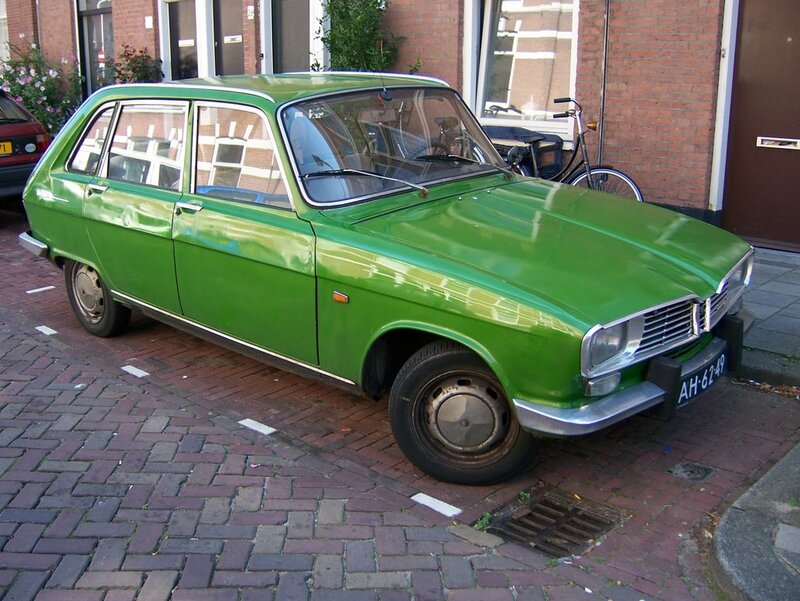 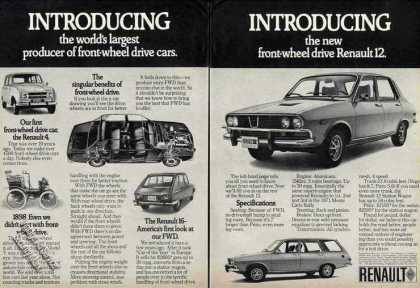 The four-door Renault 12 model slotted into the Renault range between the Renault 6 and Renault 16. 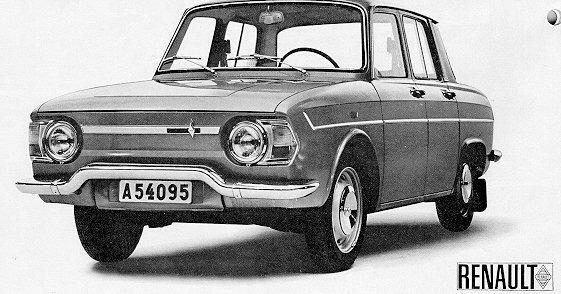 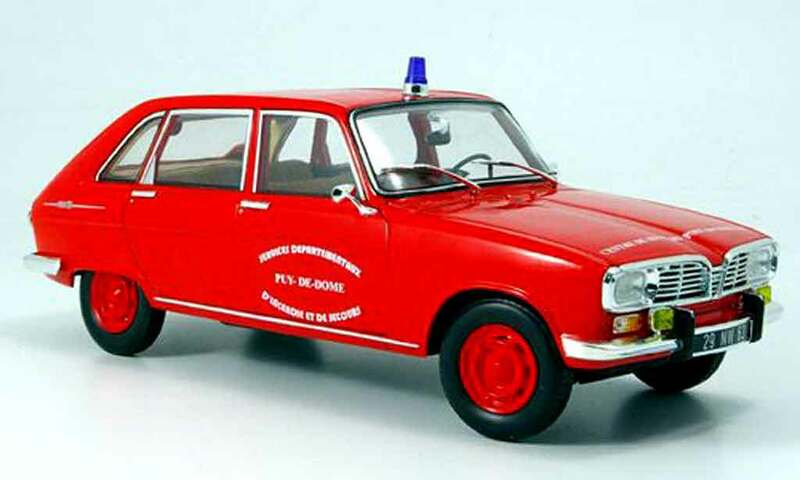 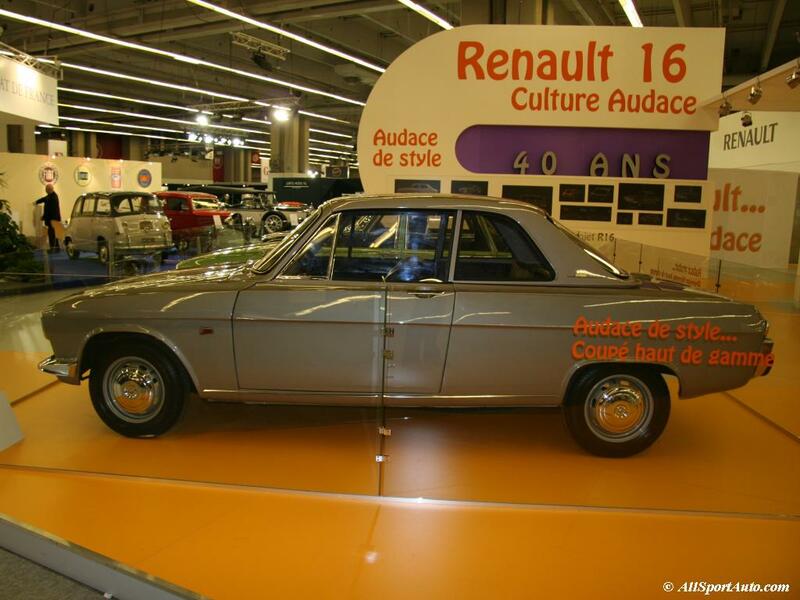 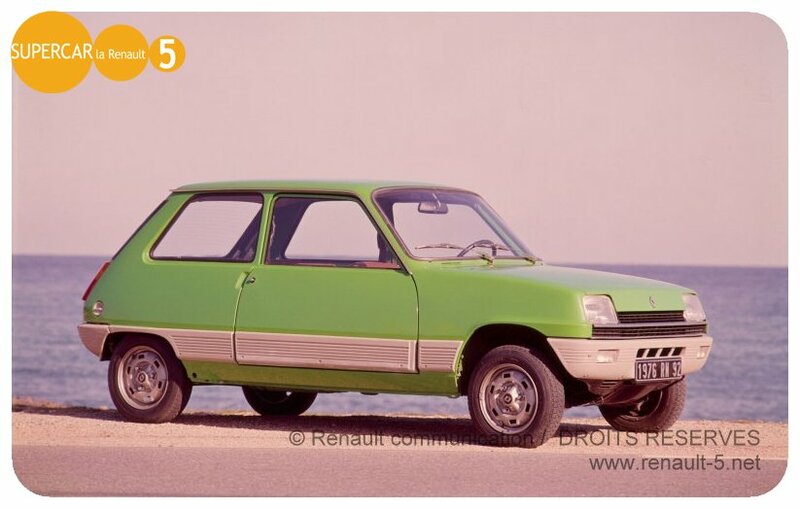 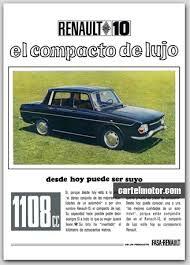 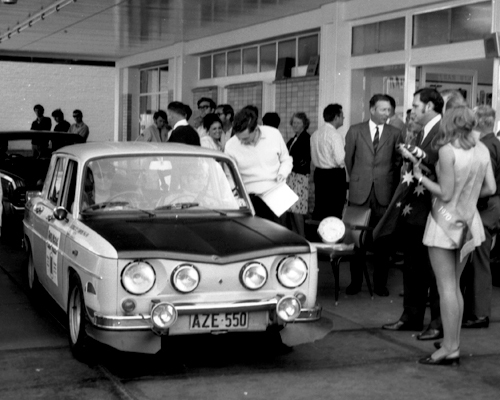 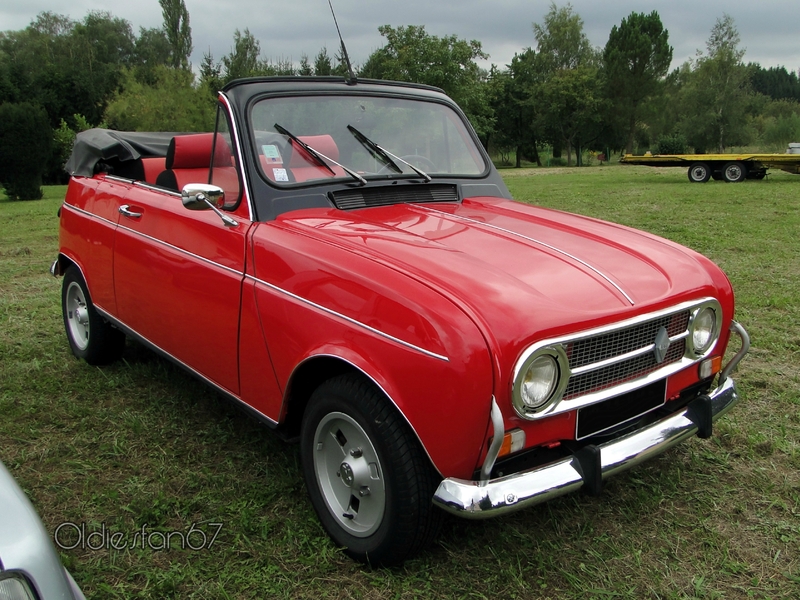 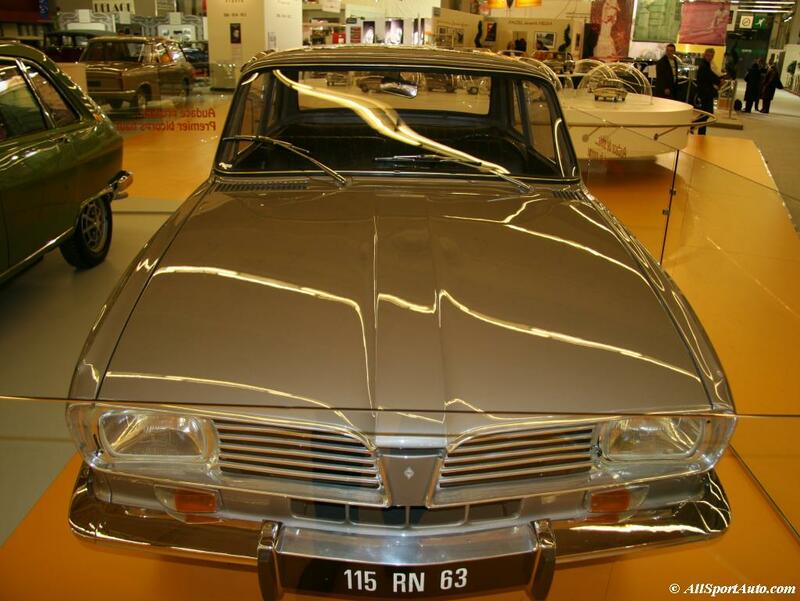 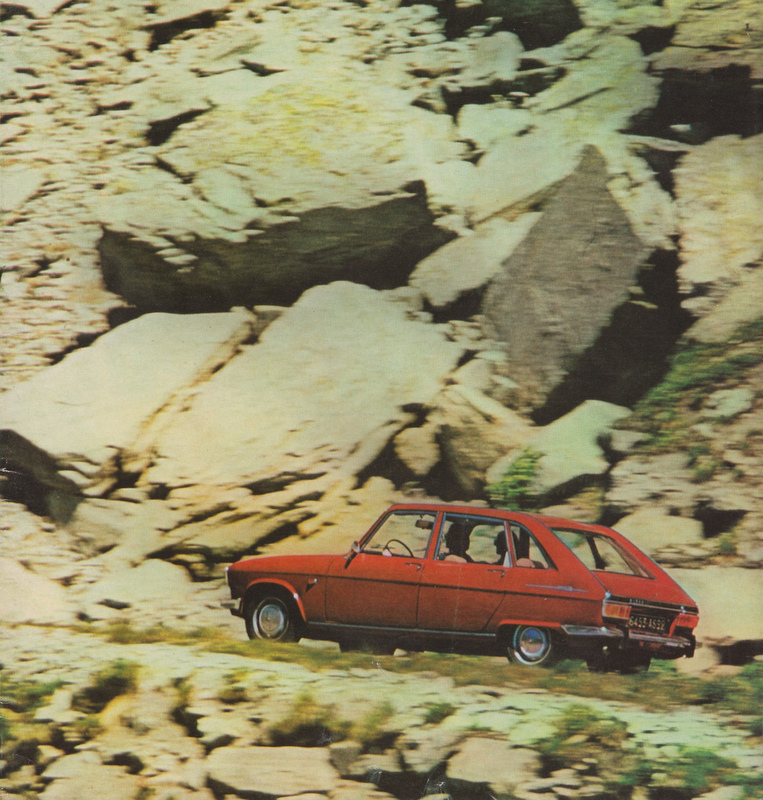 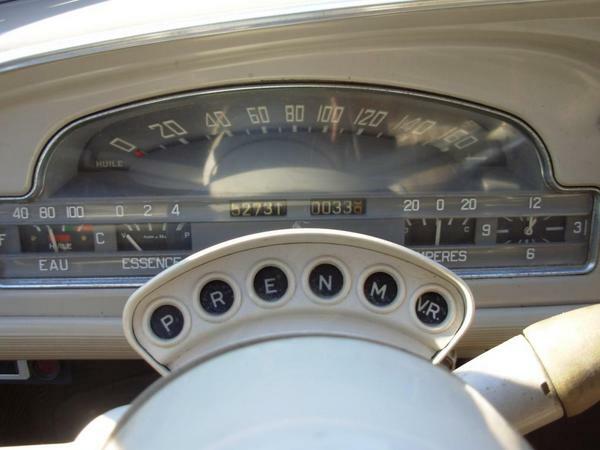 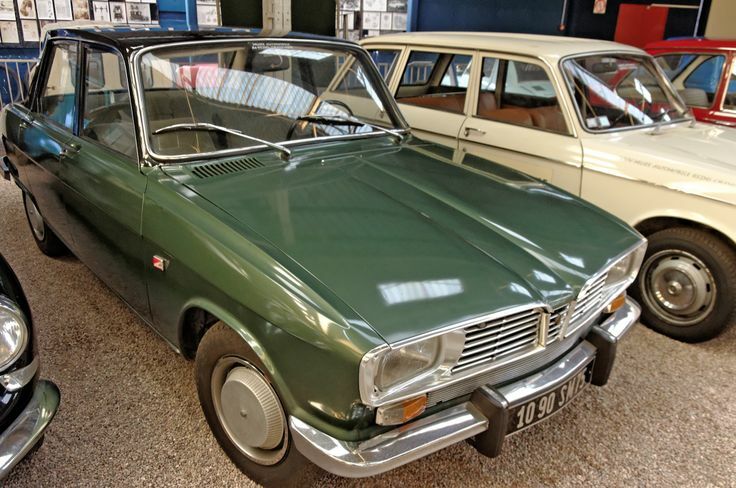 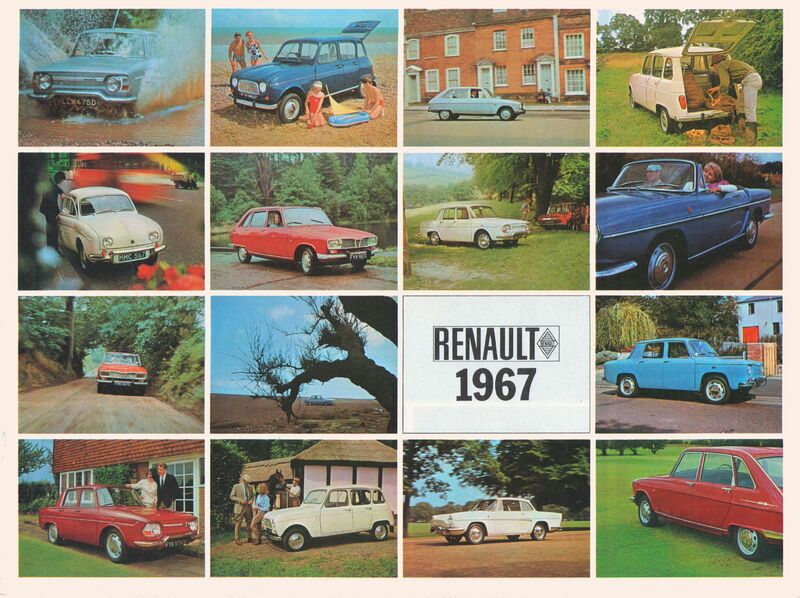 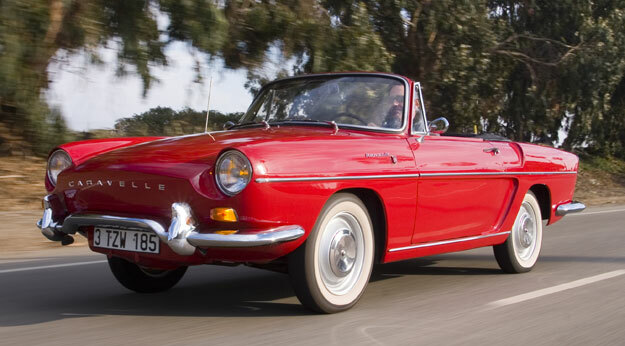 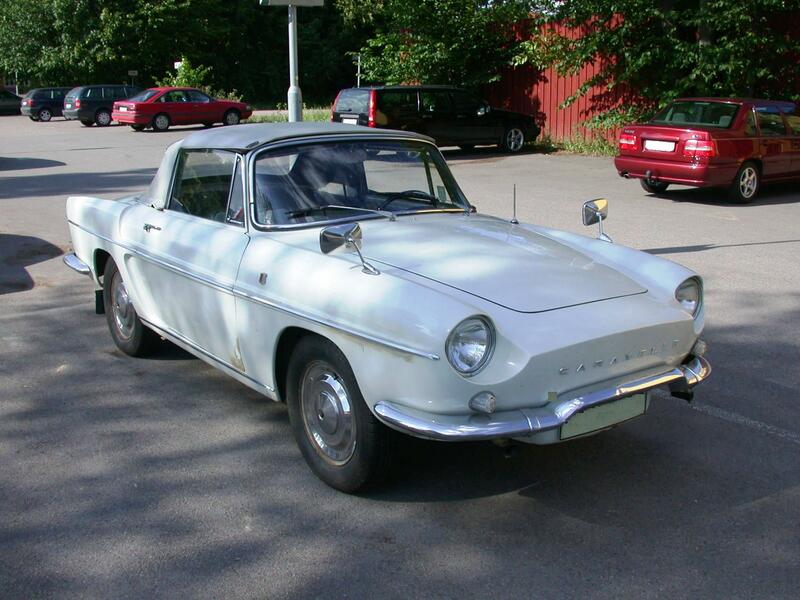 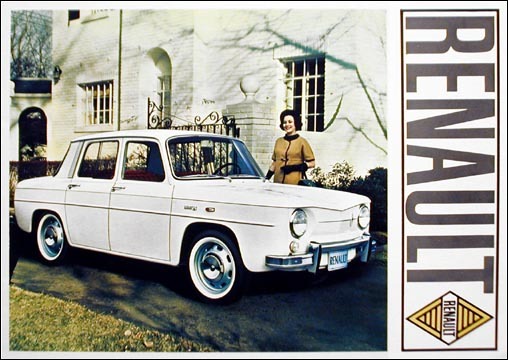 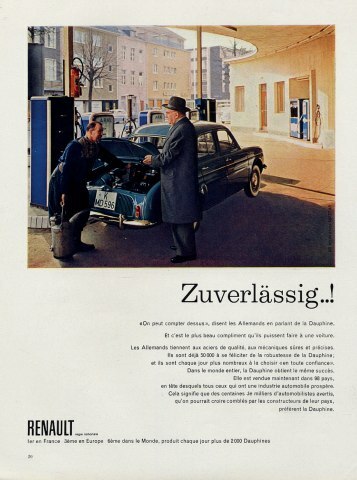 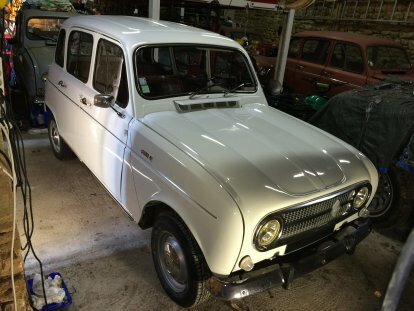 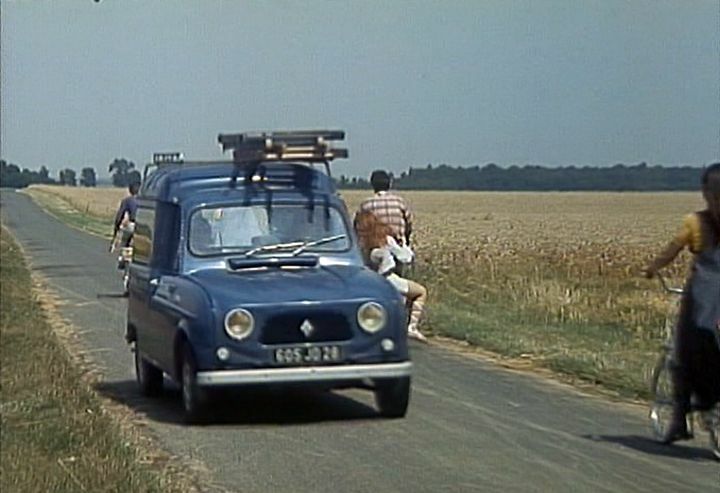 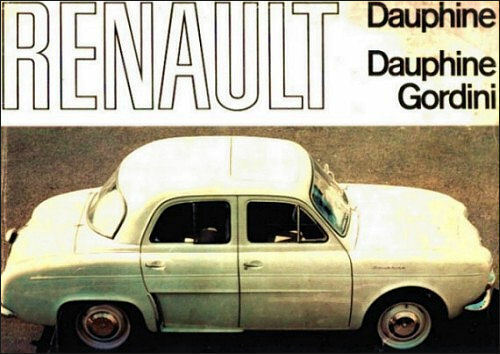 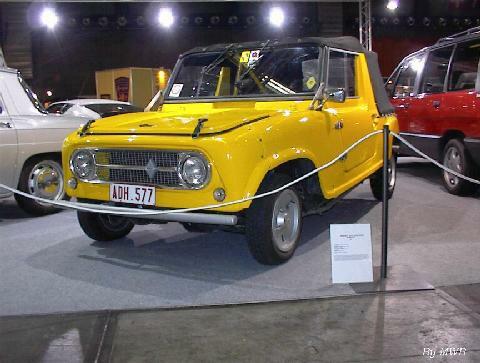 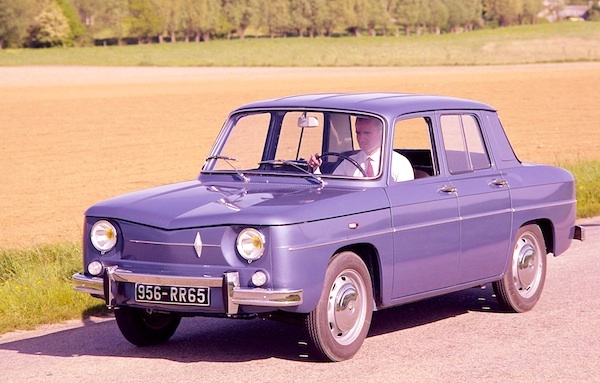 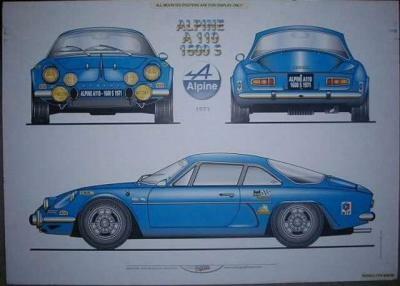 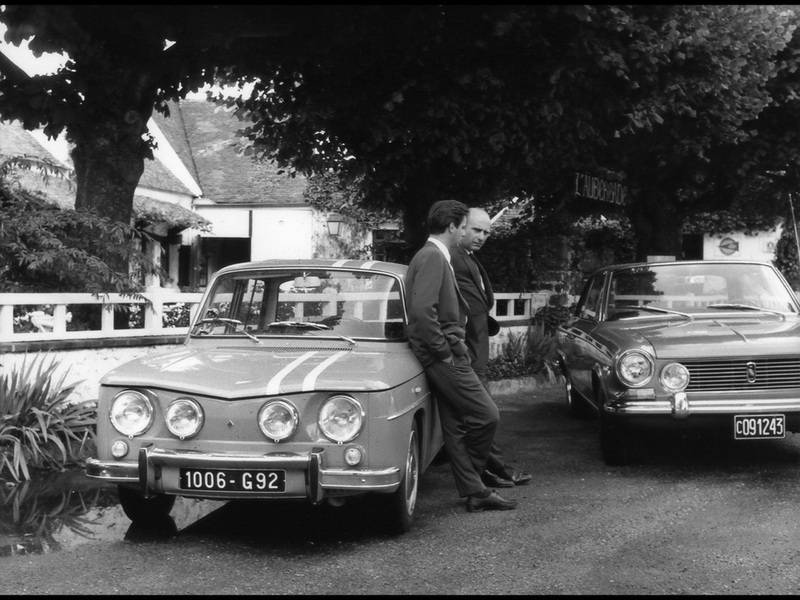 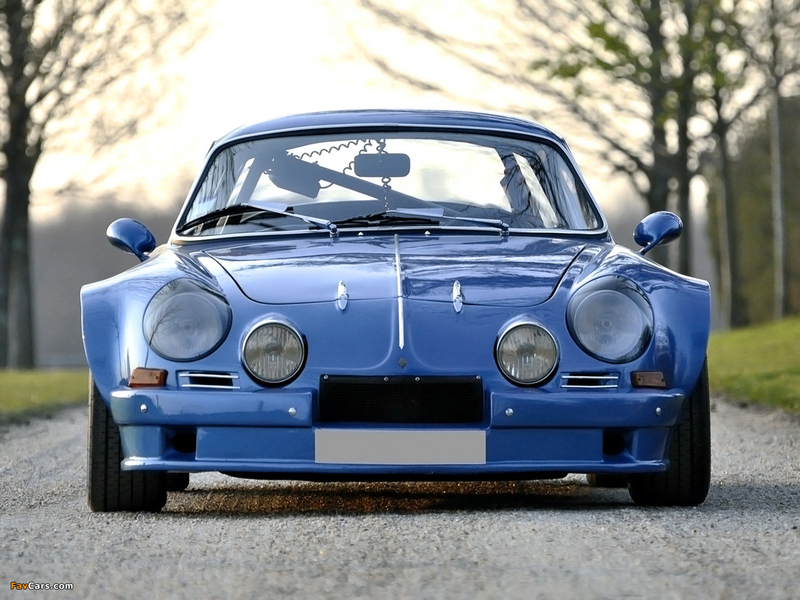 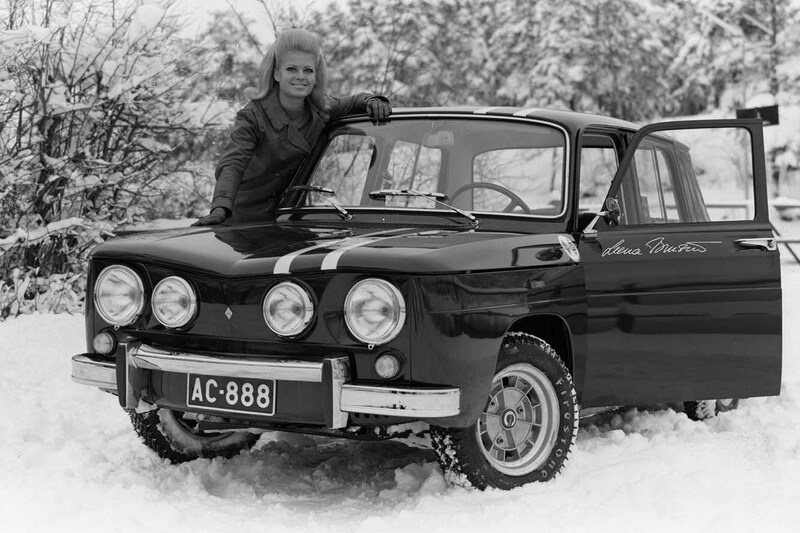 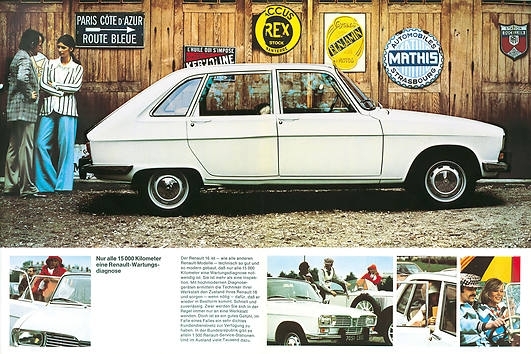 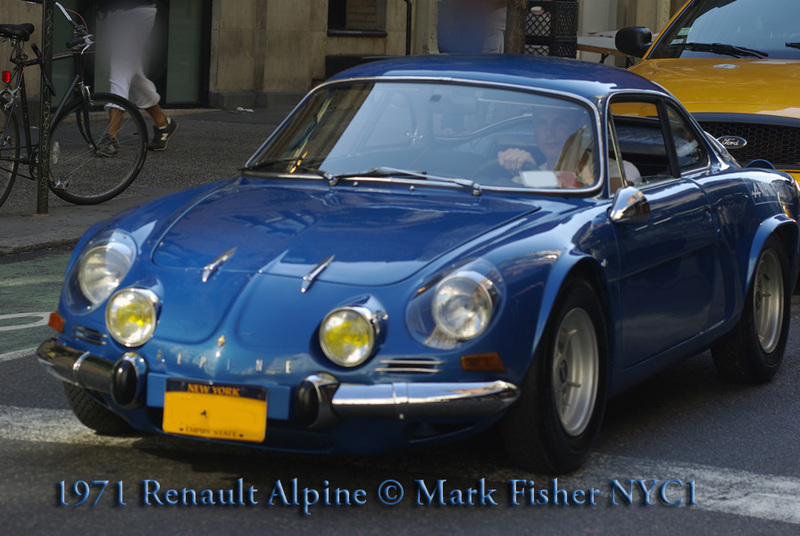 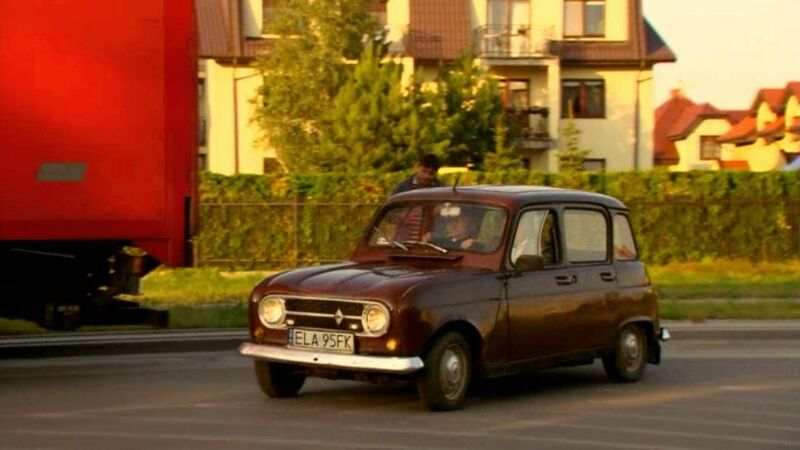 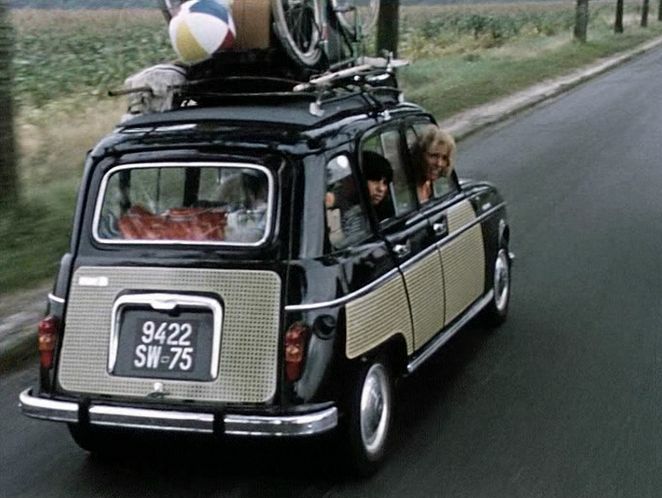 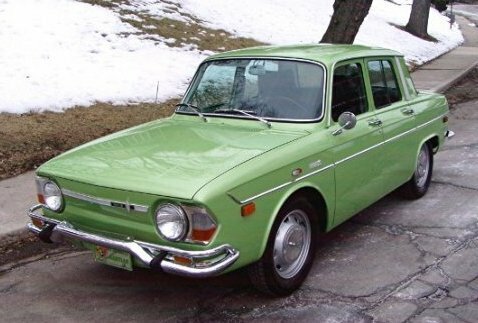 The model was a success, and 1970 was also the first year ever during which Renault produced more than a million cars in a single year, the actual figure being 1,055,803.